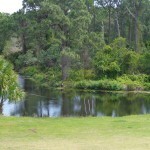 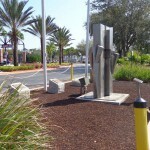 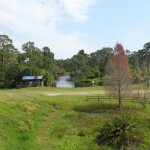 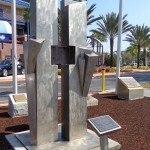 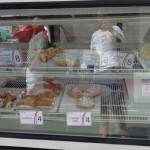 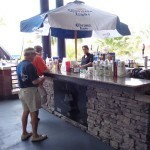 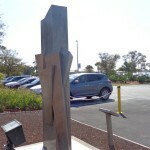 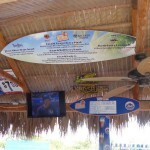 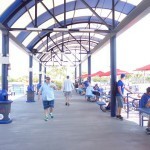 For non-mobile devices, click here to go directly to photo gallery. 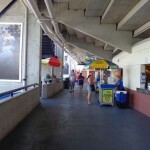 Gallery at bottom of page. 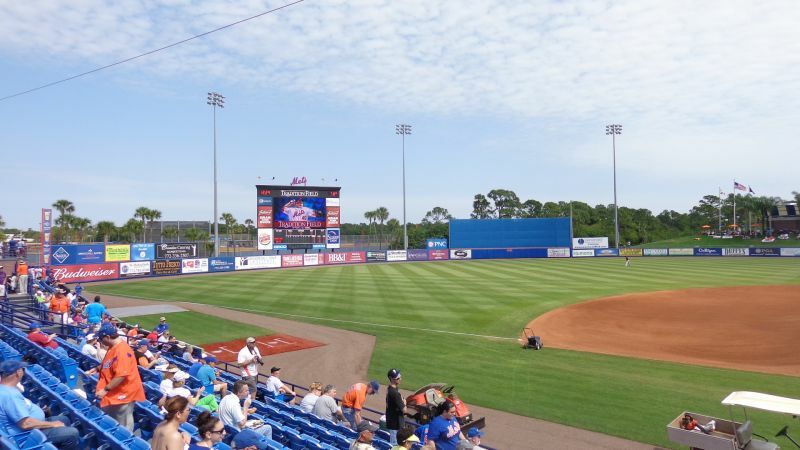 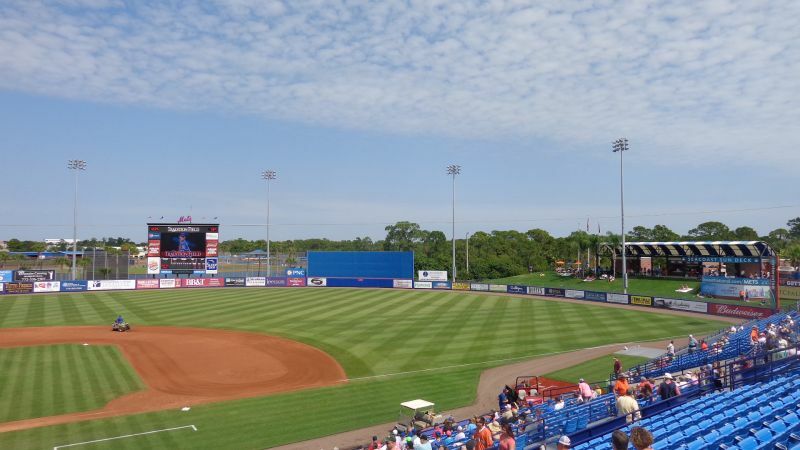 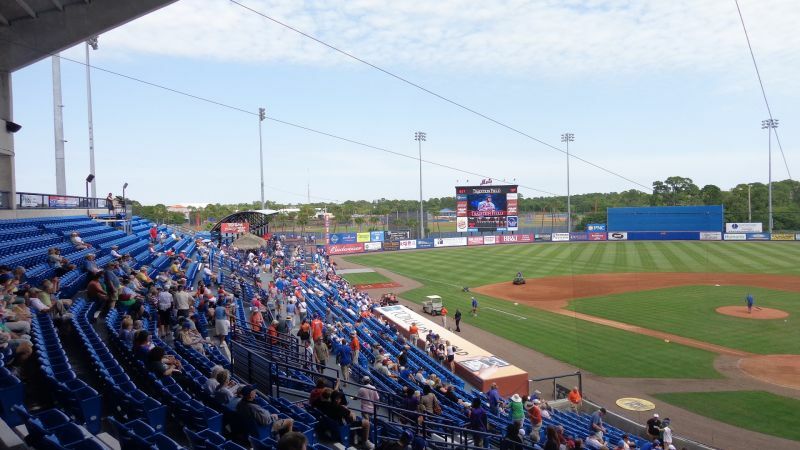 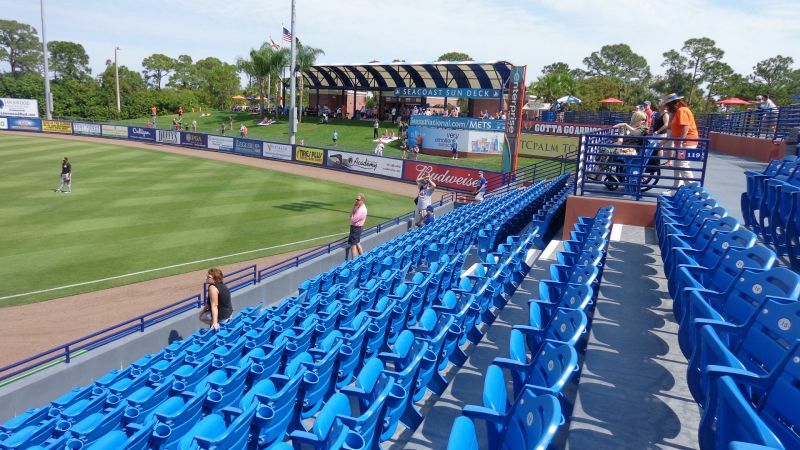 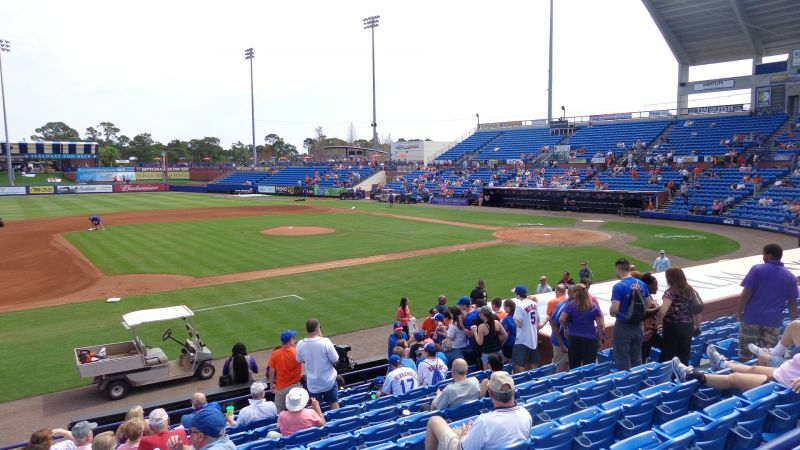 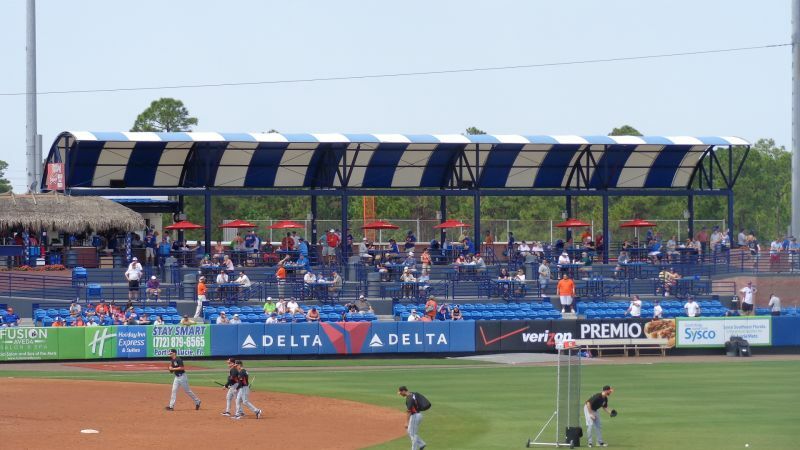 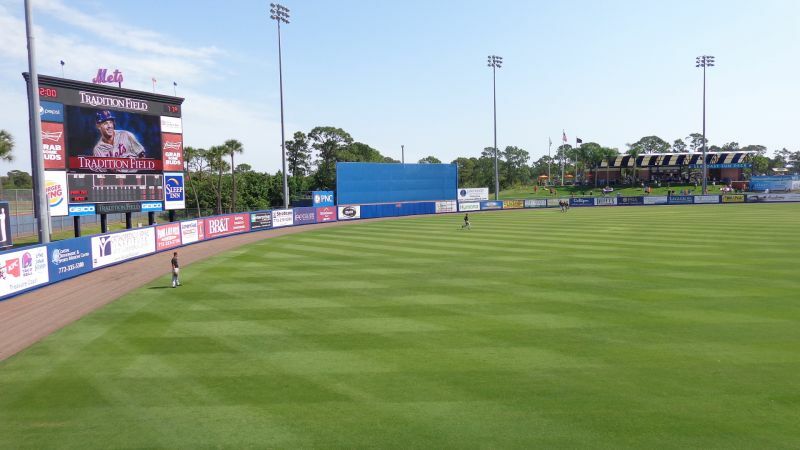 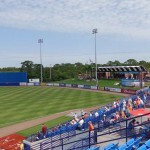 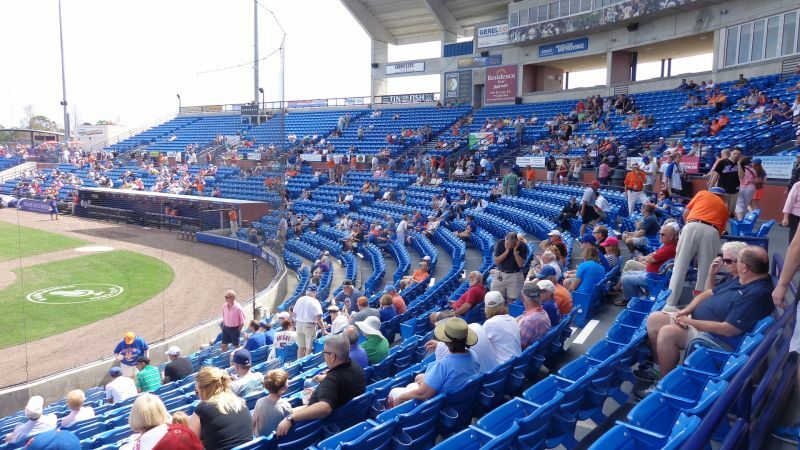 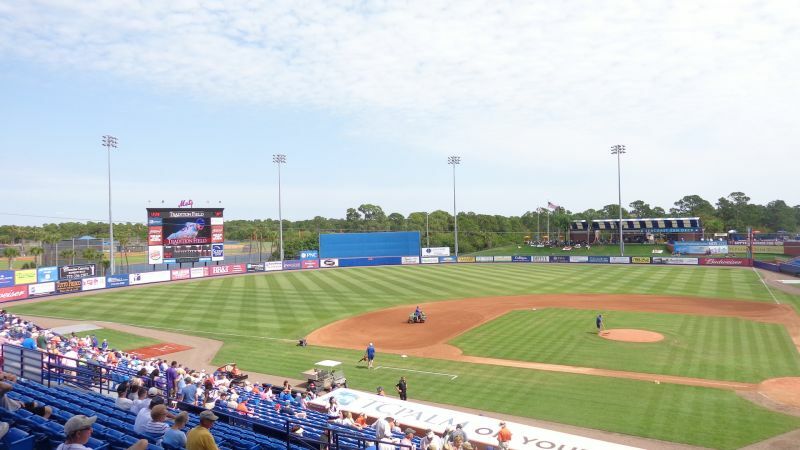 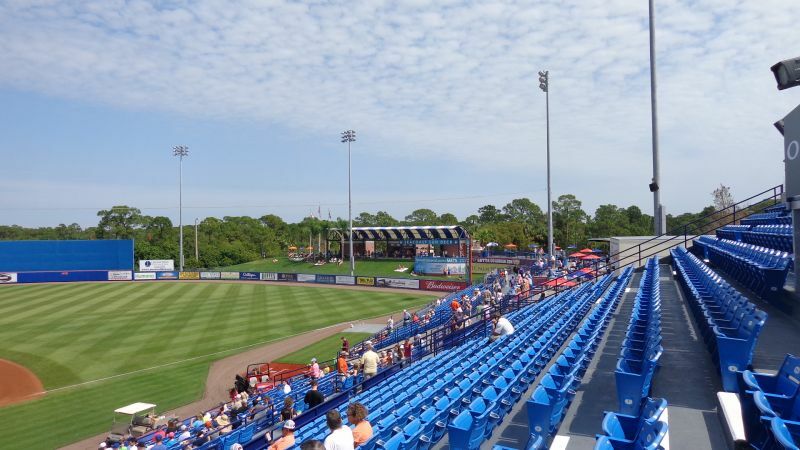 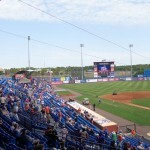 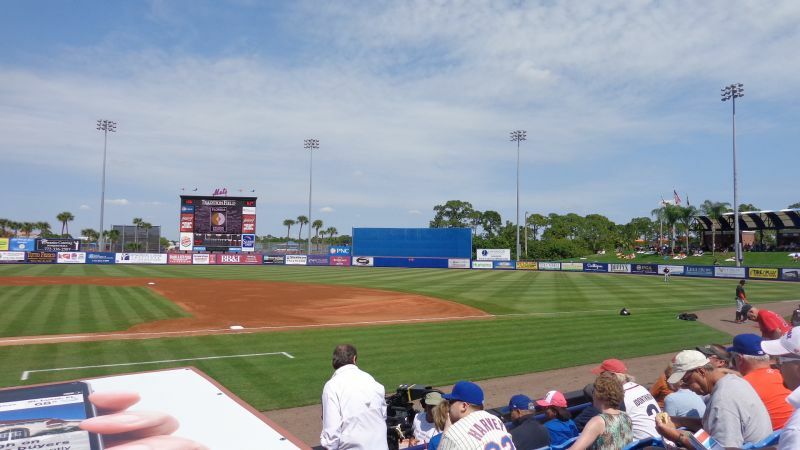 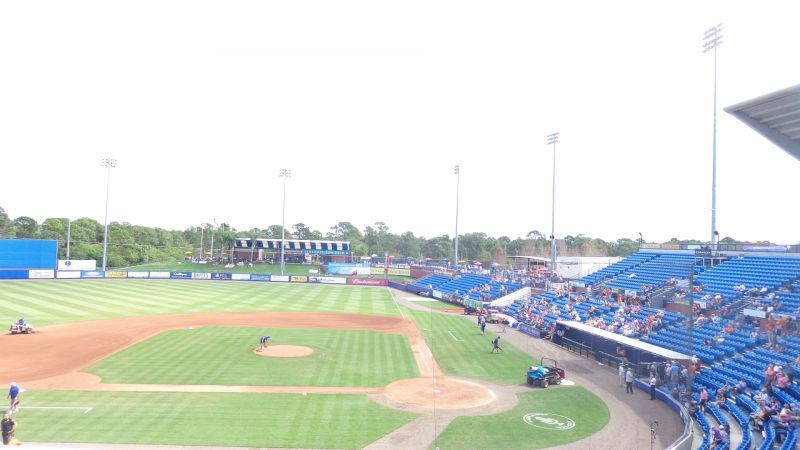 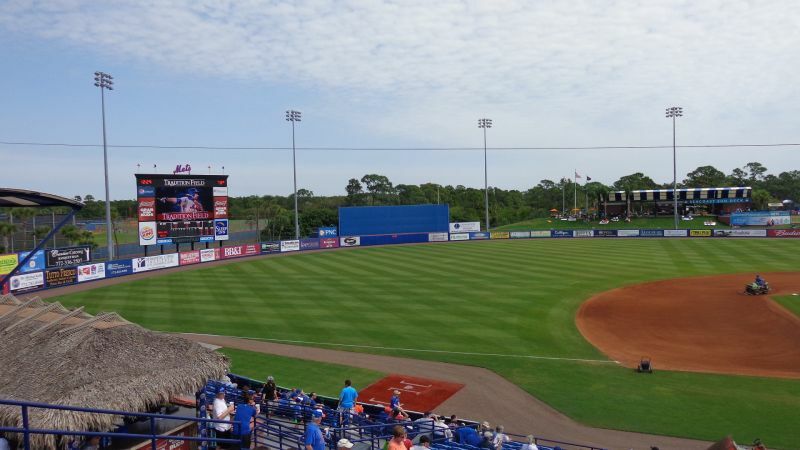 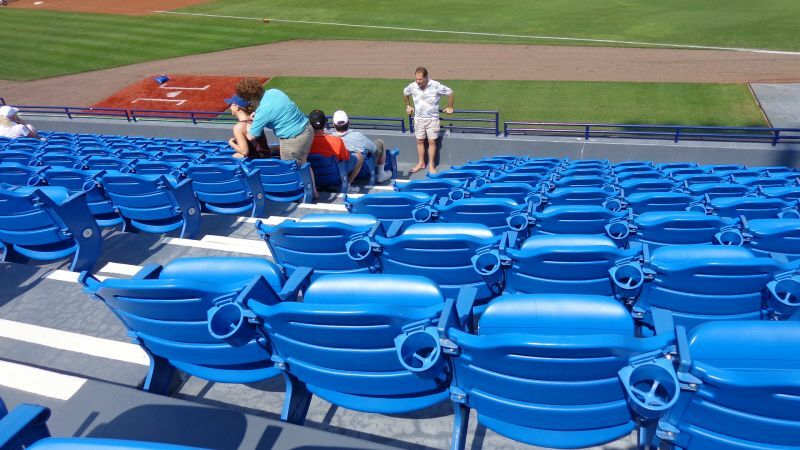 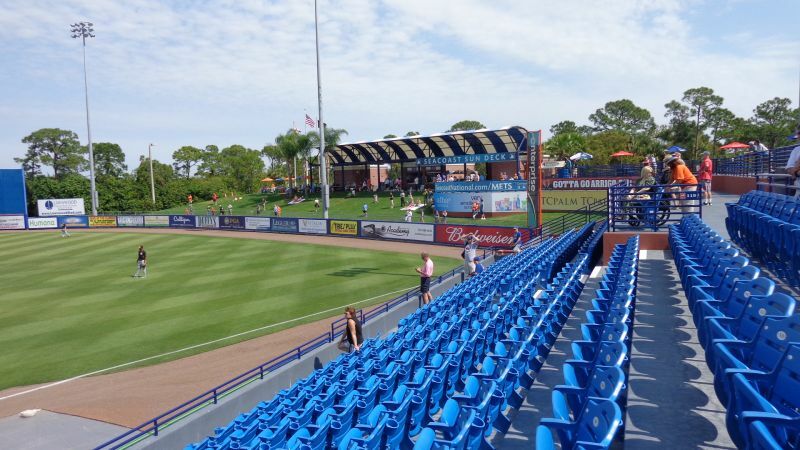 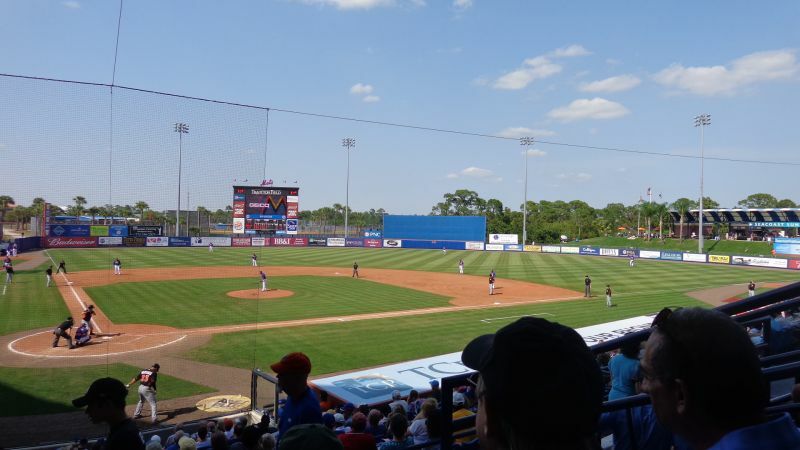 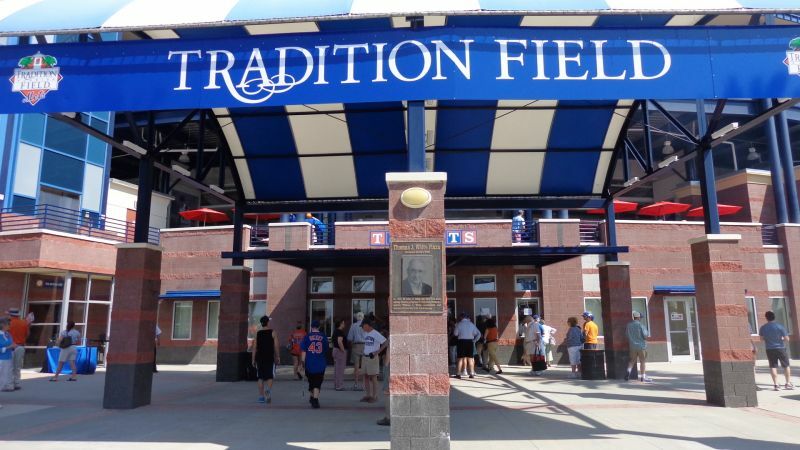 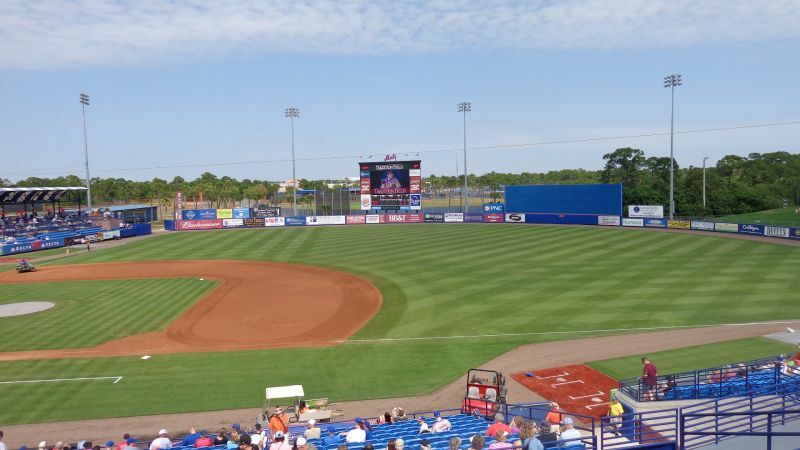 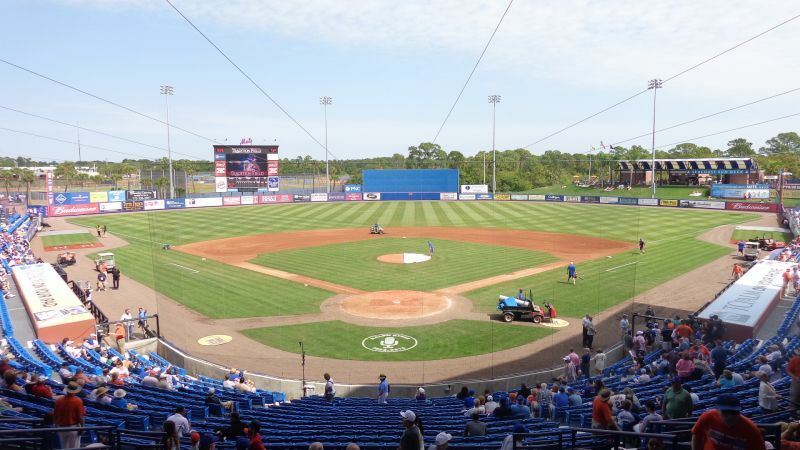 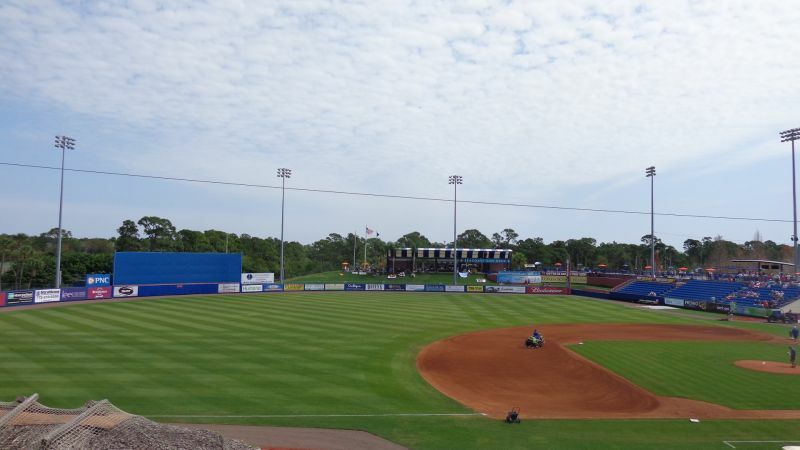 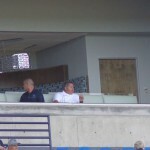 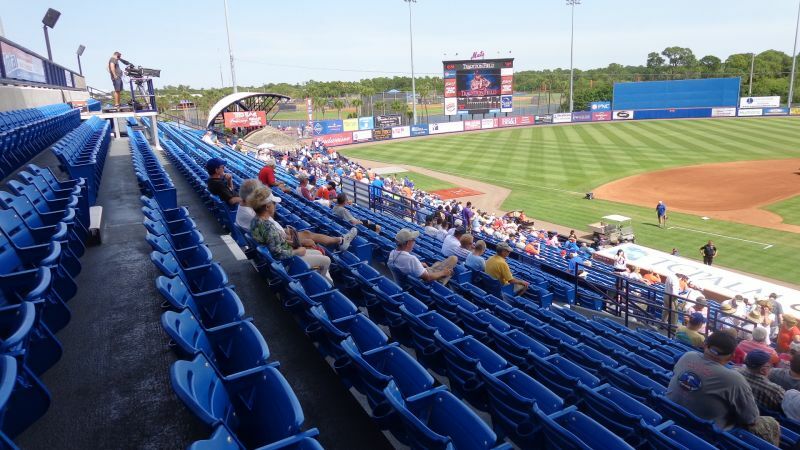 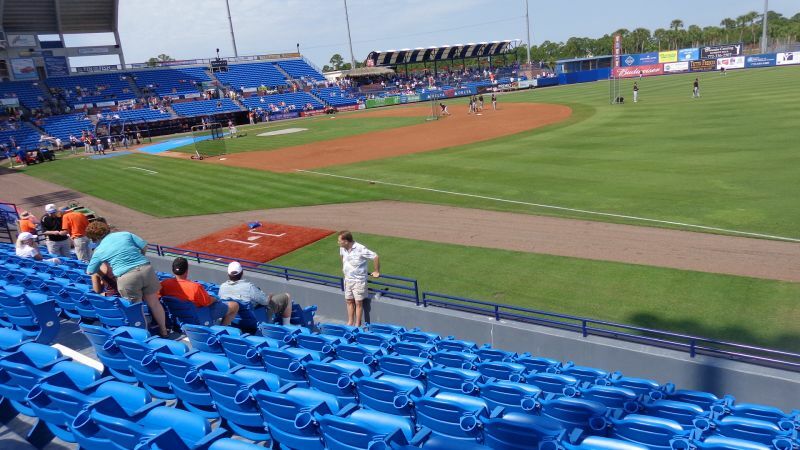 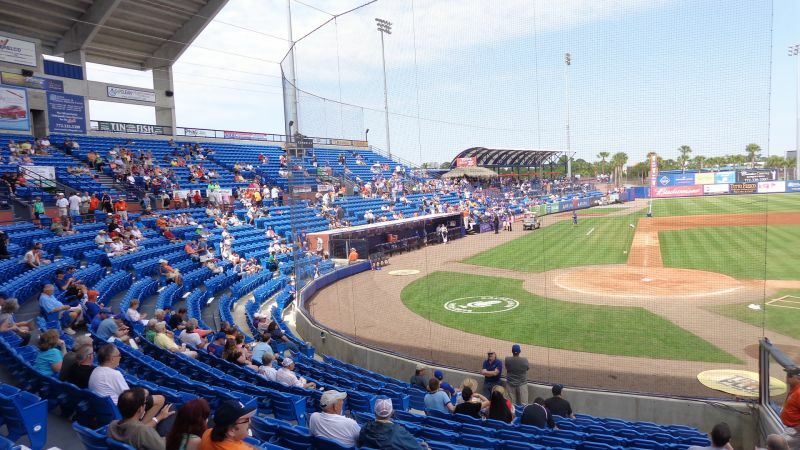 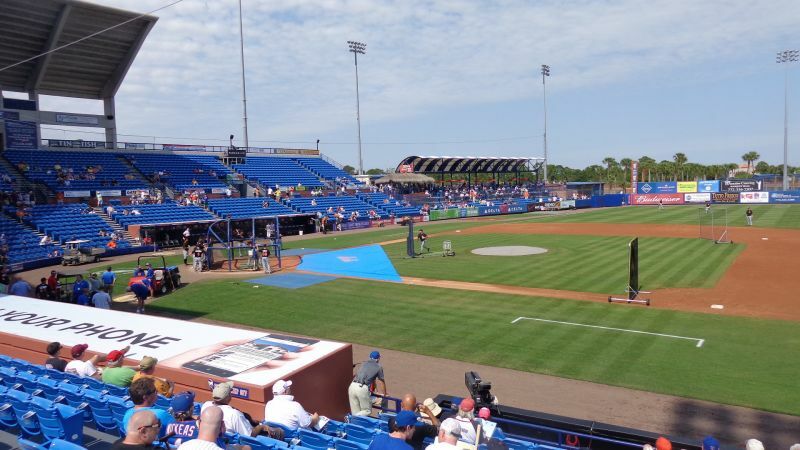 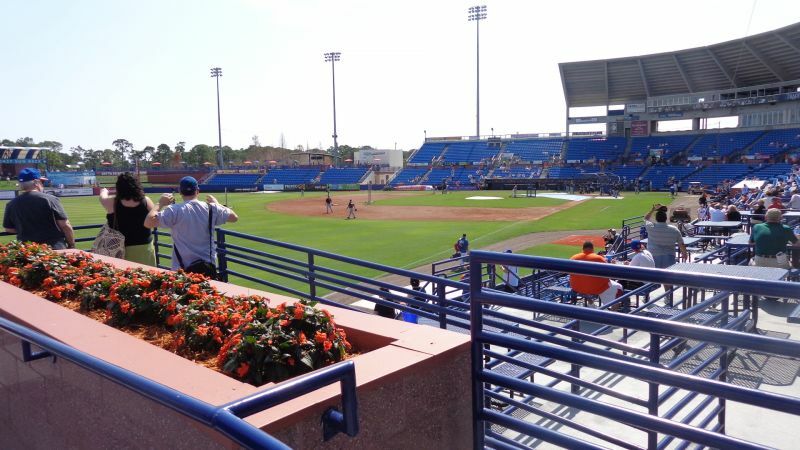 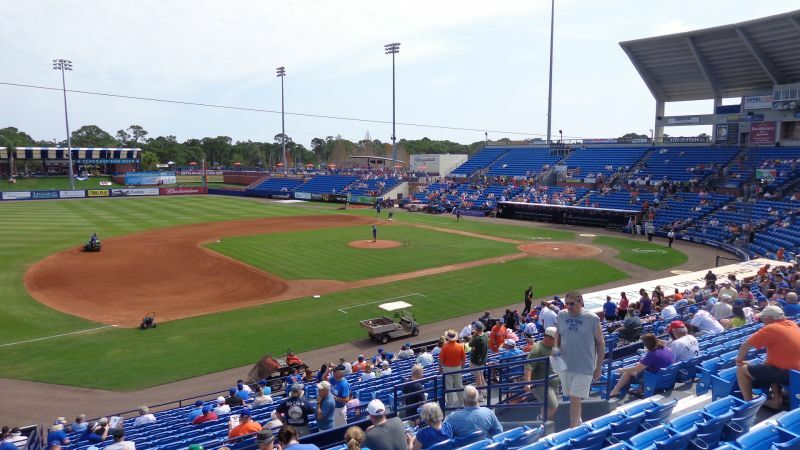 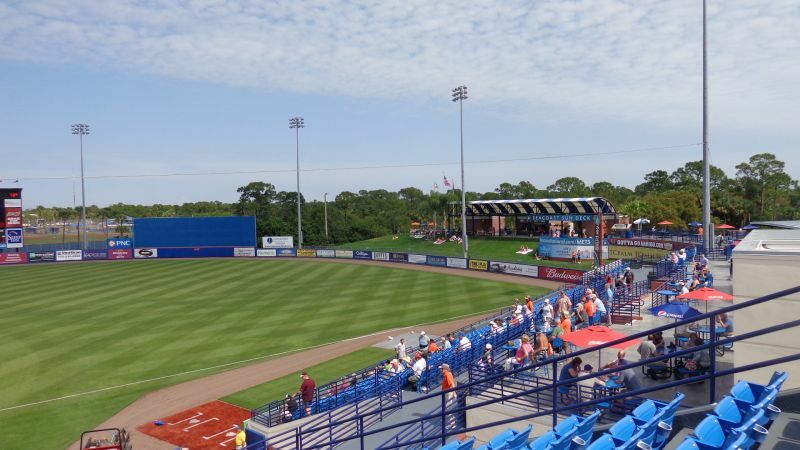 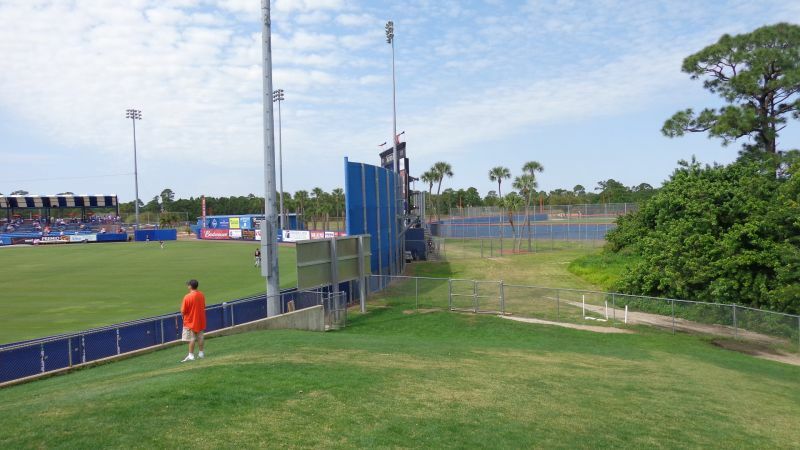 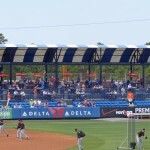 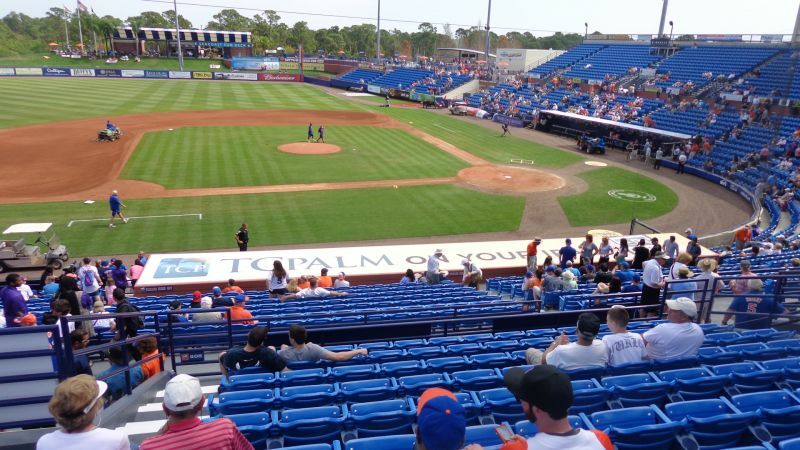 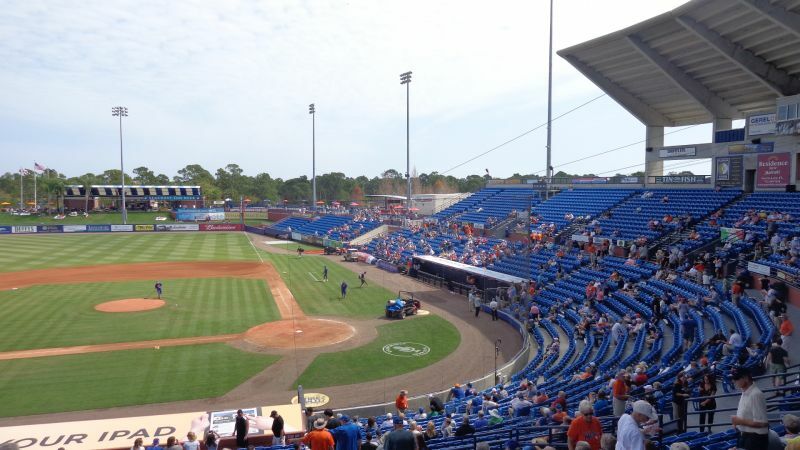 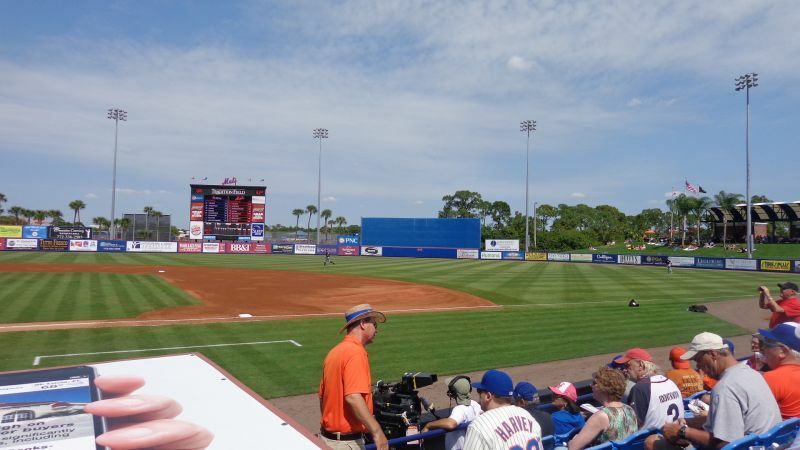 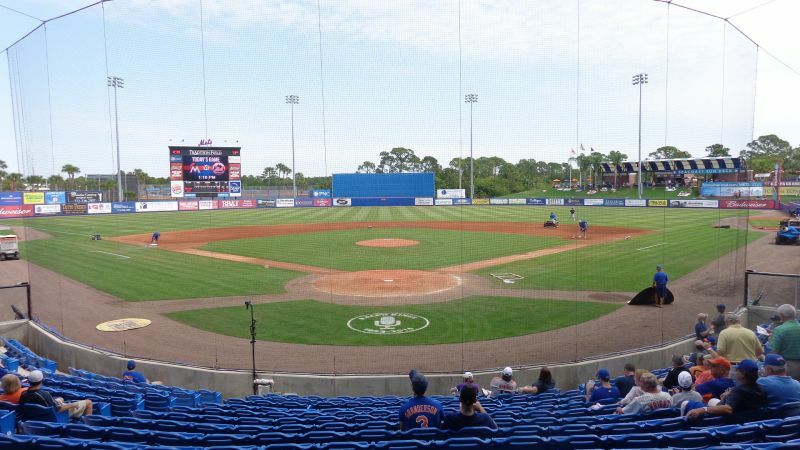 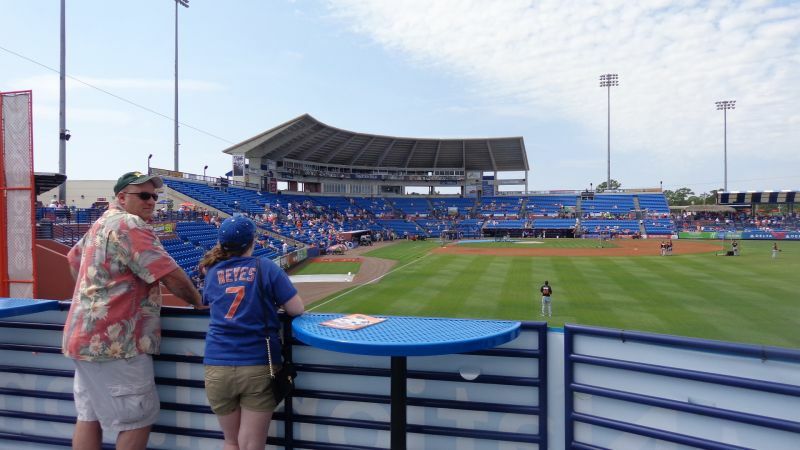 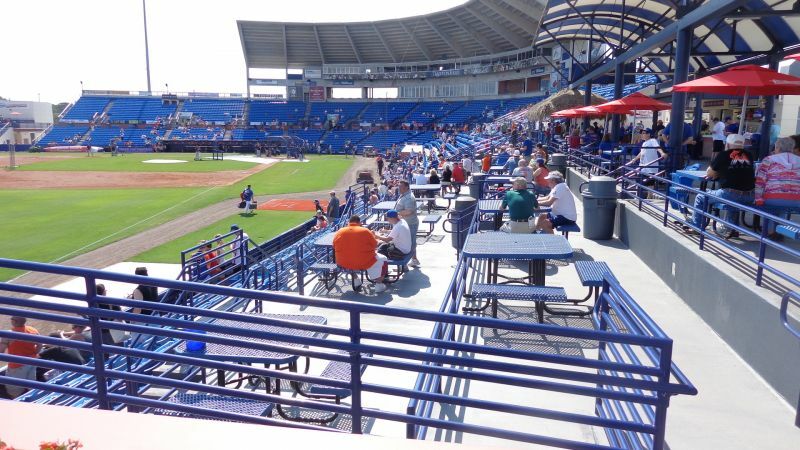 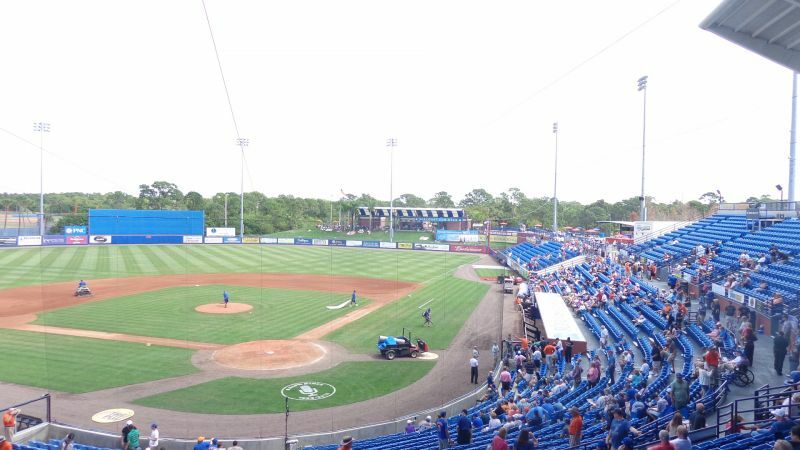 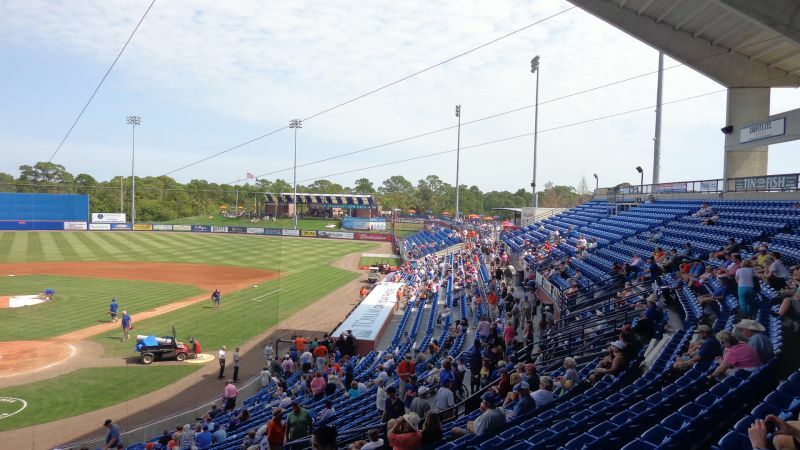 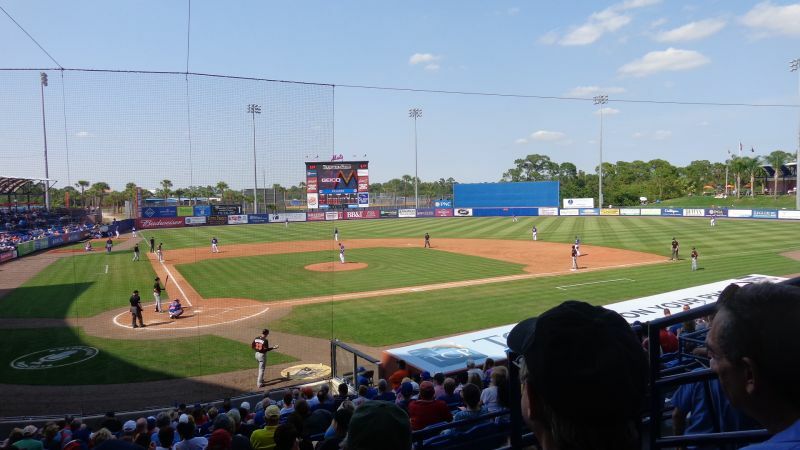 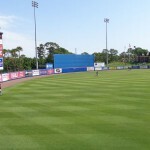 The central irony of the Mets’ spring training facility is that its grand, imposing architectural vision of a mini-me Shea Stadium circa 1988 led to the limited feasibility of large-scale renovations in the future. 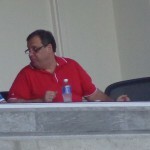 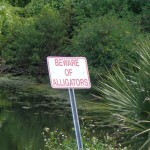 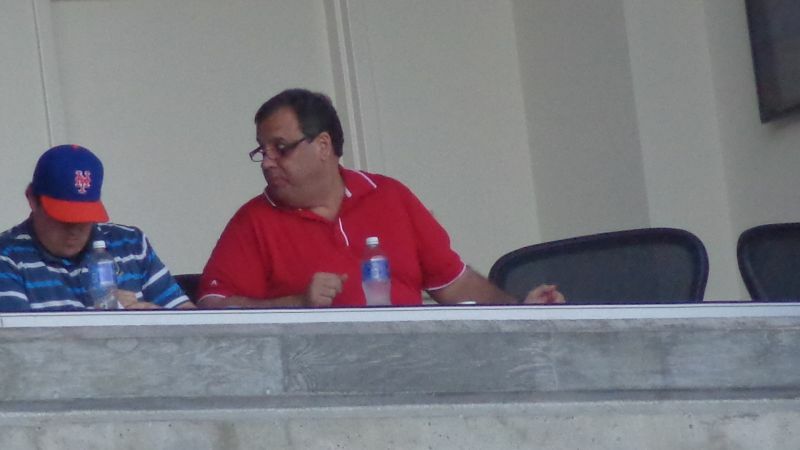 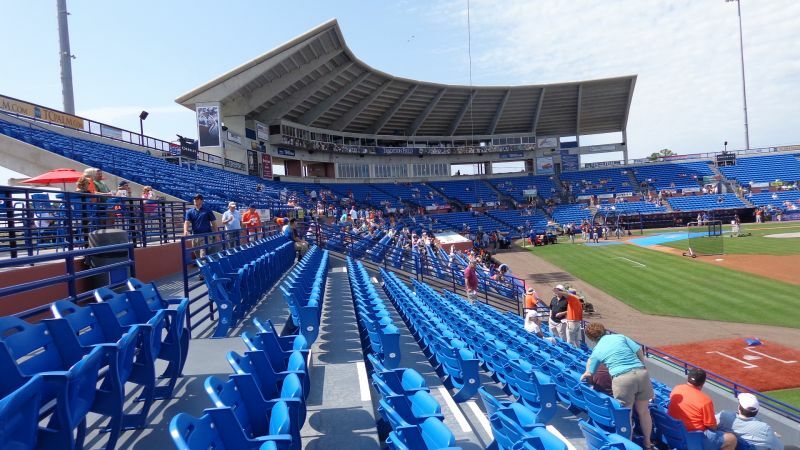 This was no Ed Smith Stadium or Charlotte County Stadium. 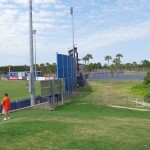 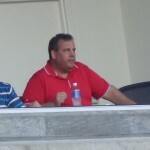 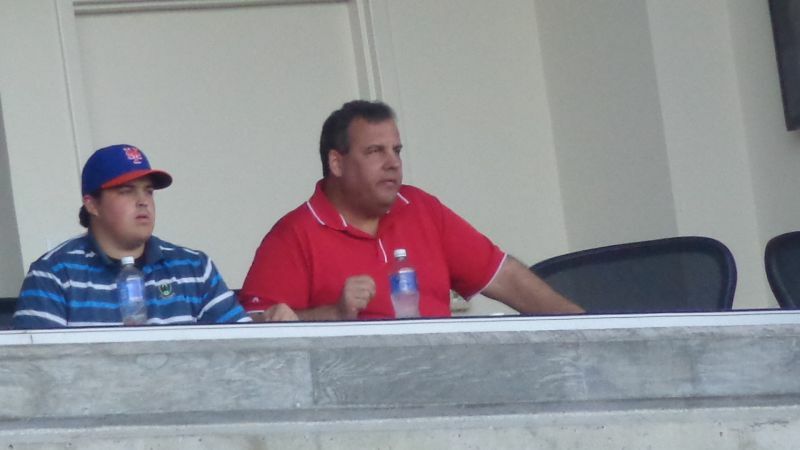 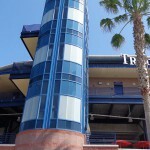 It was nothing like the other basic two-story spring training edifices built during the 1980s. 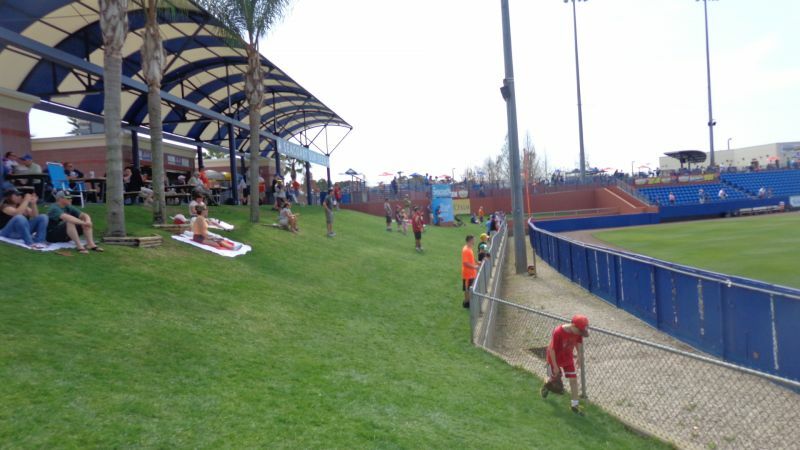 This park had ramps, four stories of drab gray concrete, the largest press box in spring training, clubhouses accessible in dugouts for both teams (a big deal), and a sprawling cantilevered roof. 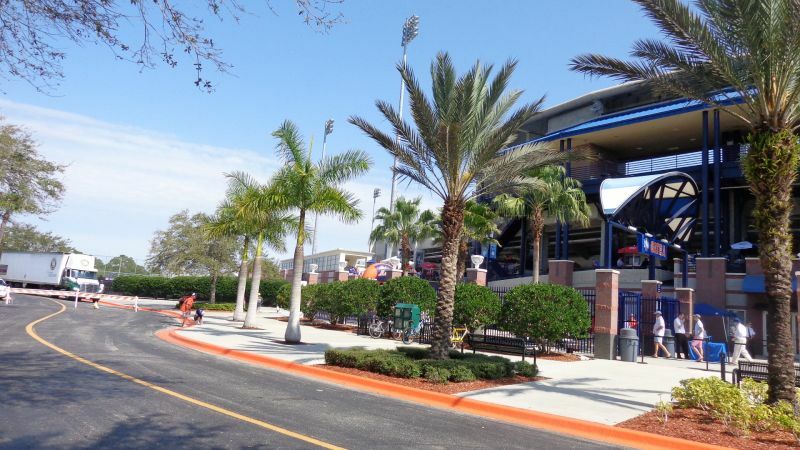 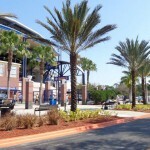 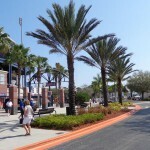 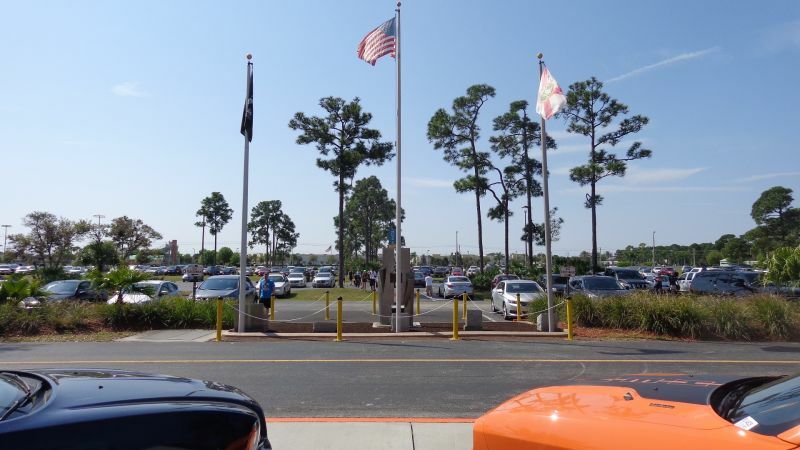 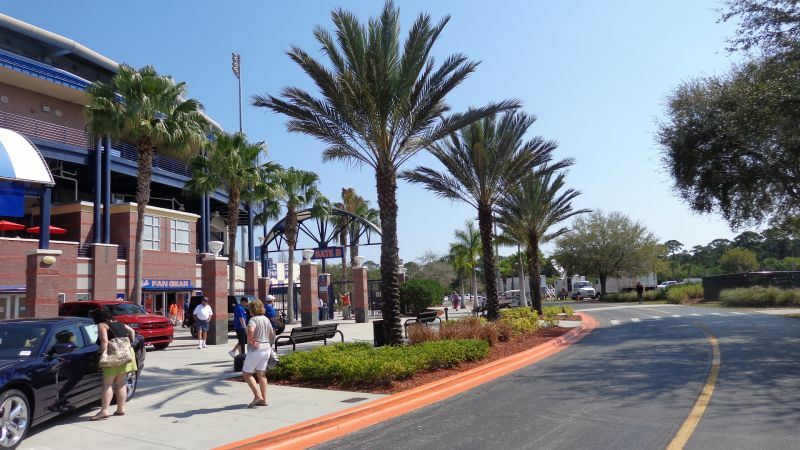 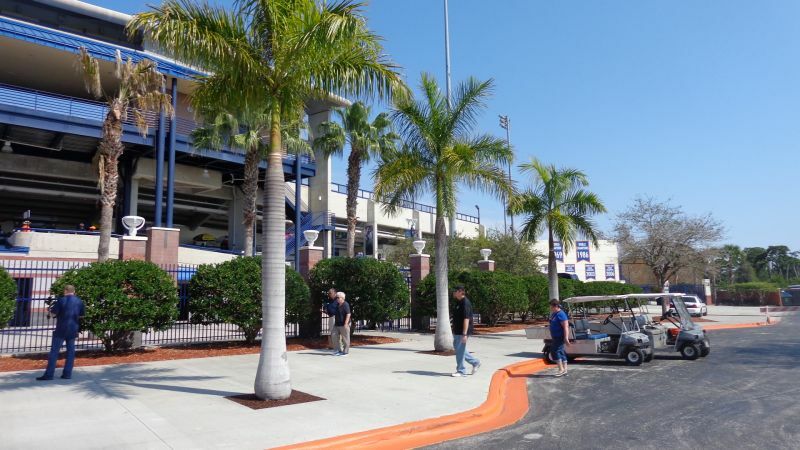 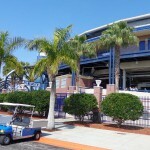 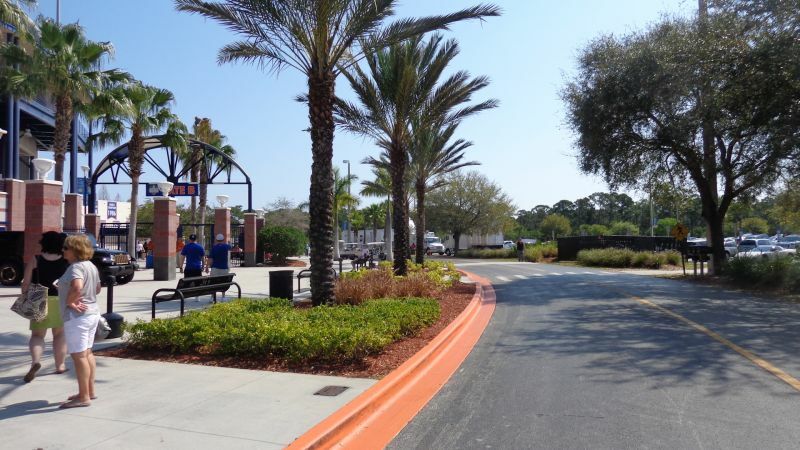 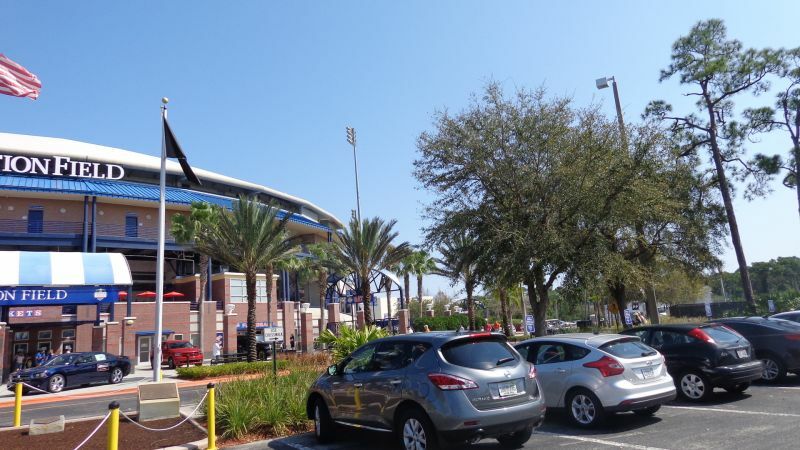 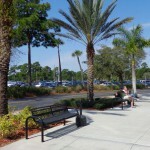 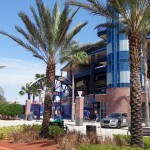 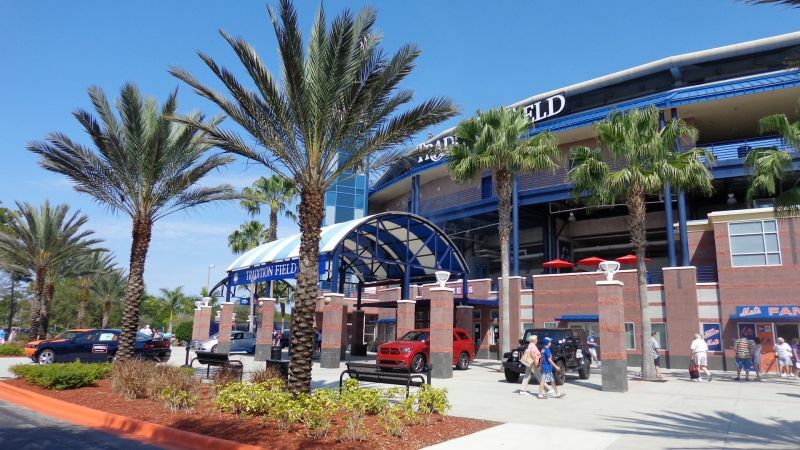 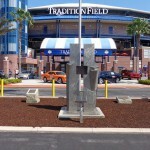 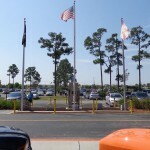 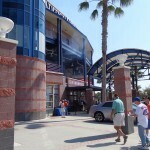 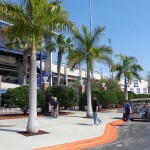 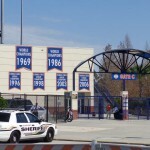 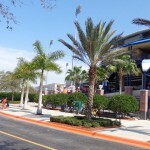 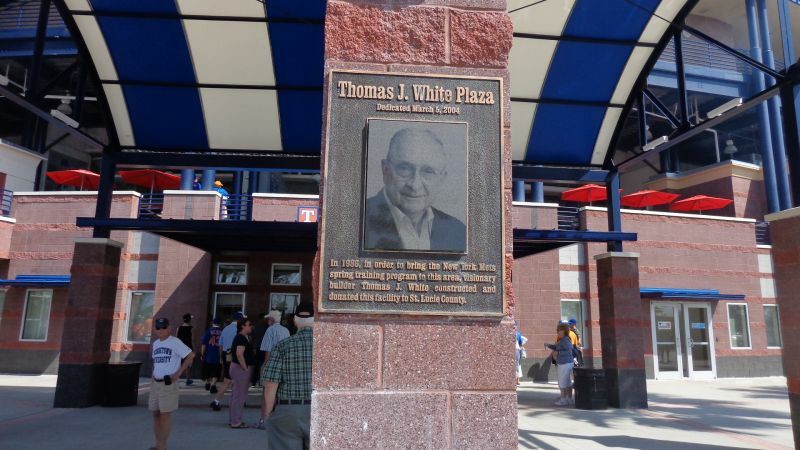 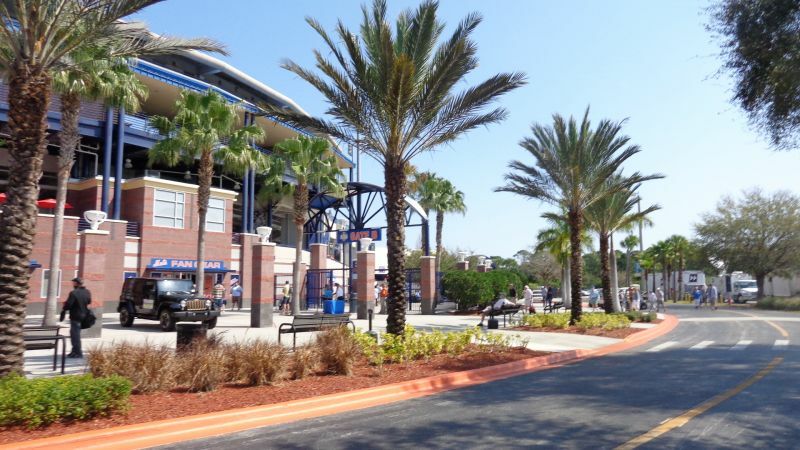 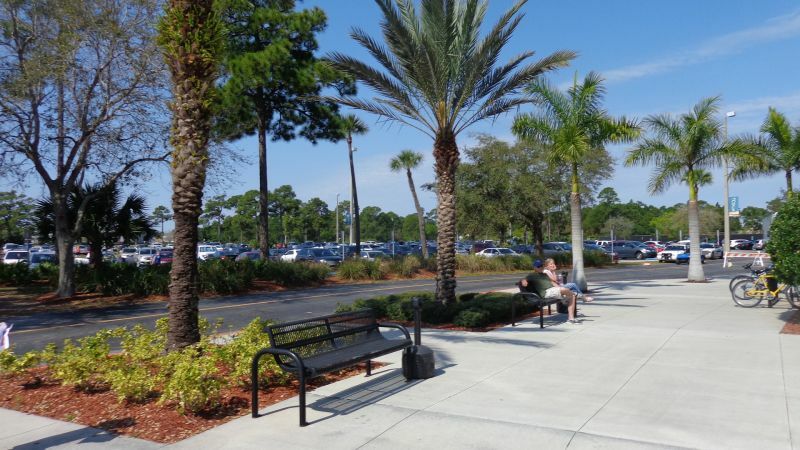 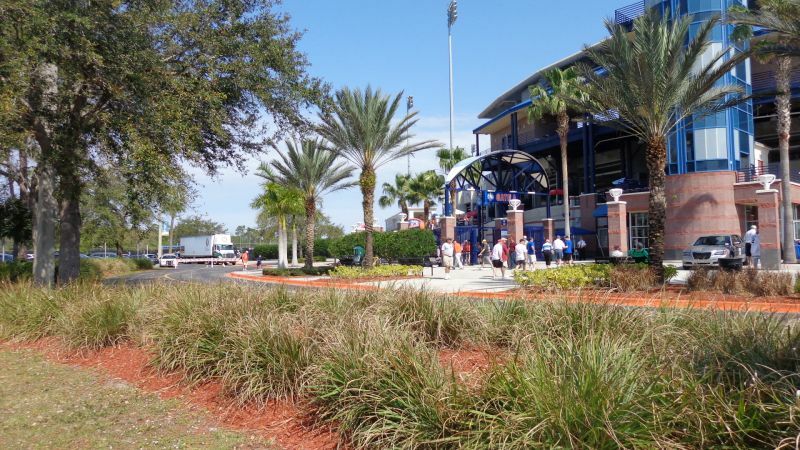 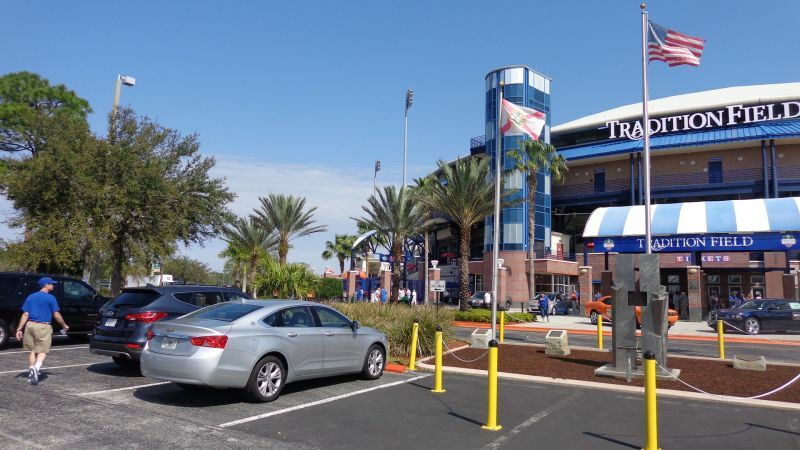 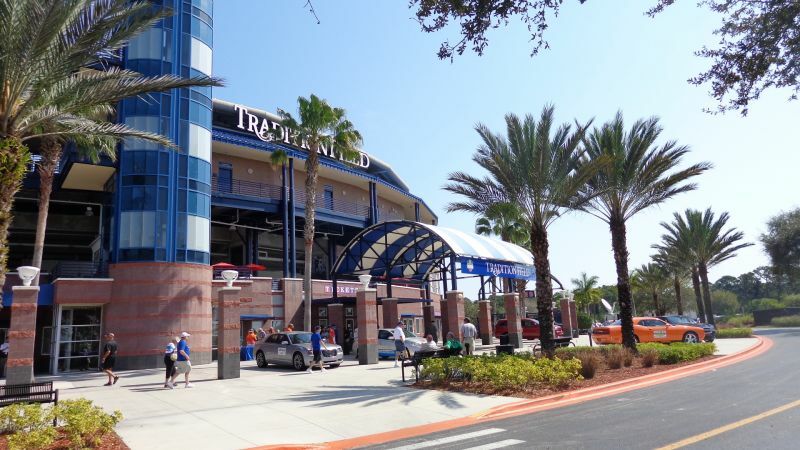 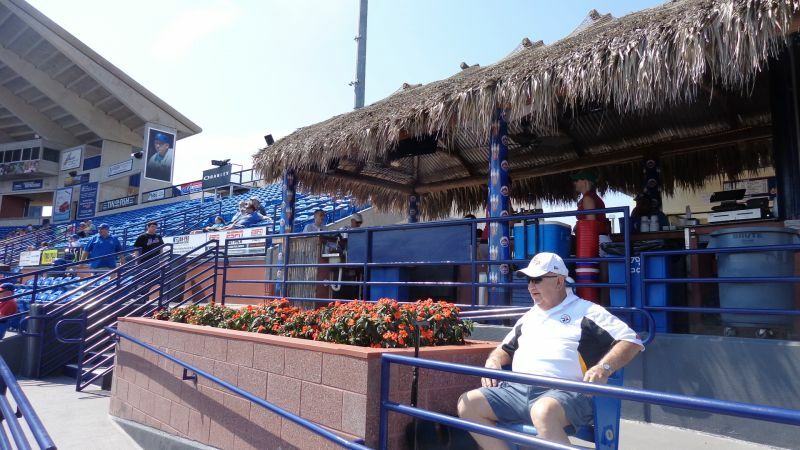 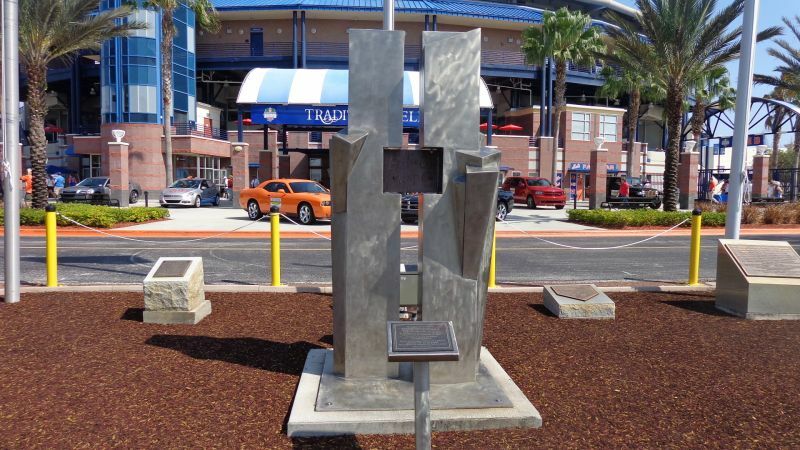 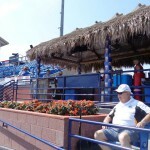 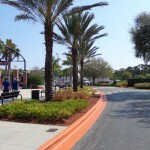 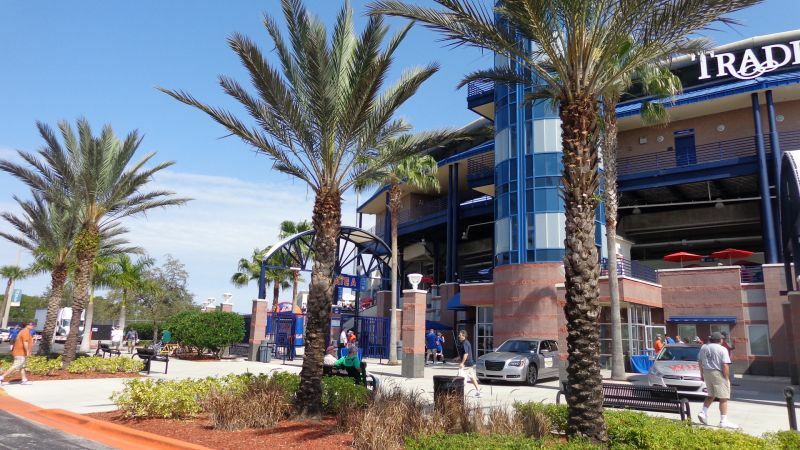 While it arguably wasn’t until Hammond Stadium in 1991 when we saw a true “super spring training complex,” replete with a beautified exterior aesthetic scene and tropical fountain motif, the Mets’ Thomas J. 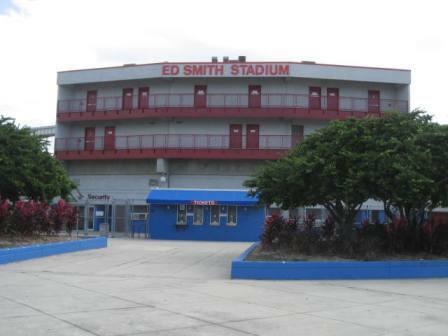 White Stadium undoubtedly represented a step forward and was probably the best of the 1980s. 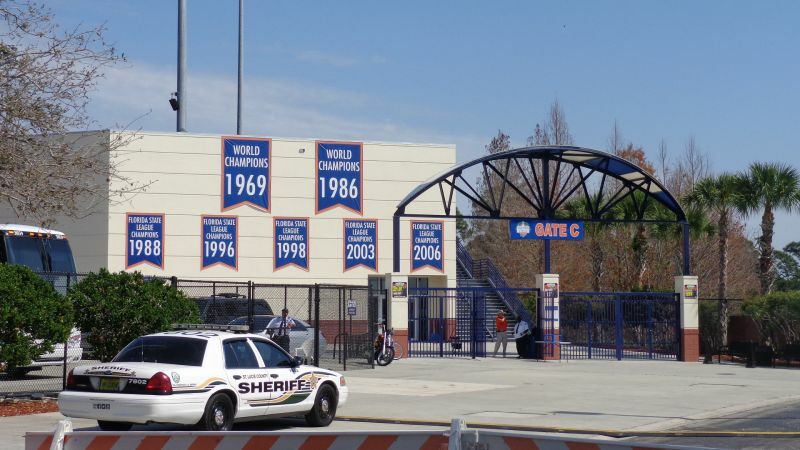 The construction cost was $11 million in 1988, compared to Compadre Stadium ($1.6 million in 1986), Charlotte County Stadium ($5 million in 1987), Plant City Stadium ($5.7 million in 1988), Ed Smith Stadium ($8.5 million in 1989), and even Space Coast Stadium ($6.2 million in 1994), which got rave reviews upon opening. 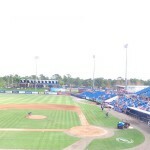 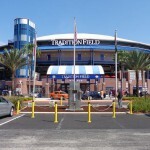 No one says this today, but the ballpark now known as Tradition Field was the Steinbrenner Field of 1988. 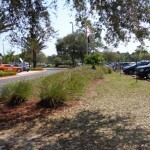 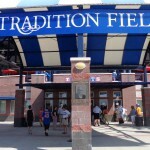 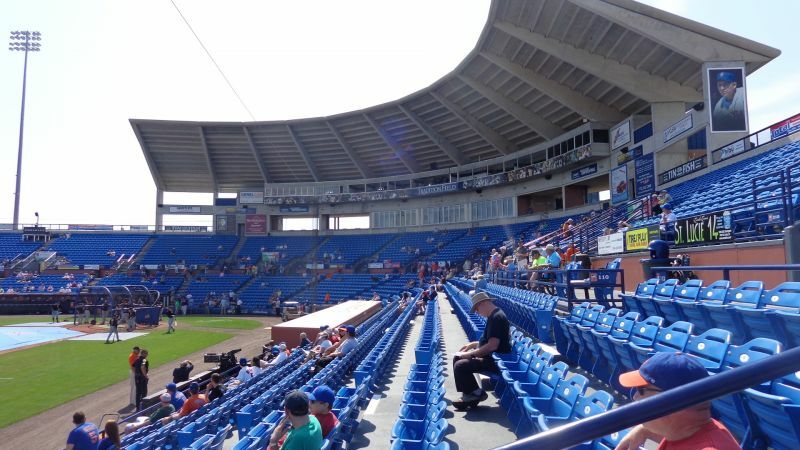 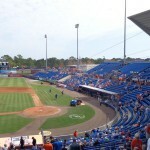 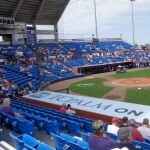 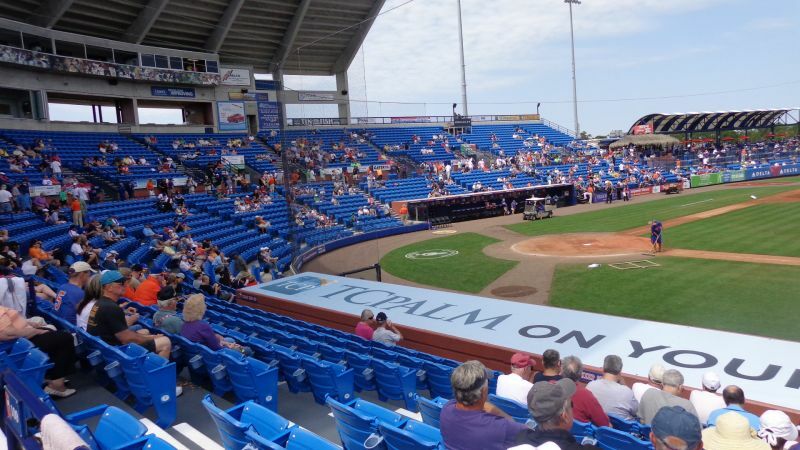 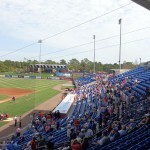 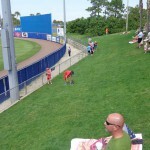 Tradition Field was built to last, but it doesn’t hold up very well today. 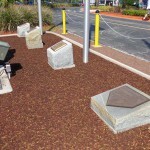 Periodic aesthetic enhancements can only improve the original design to a degree. 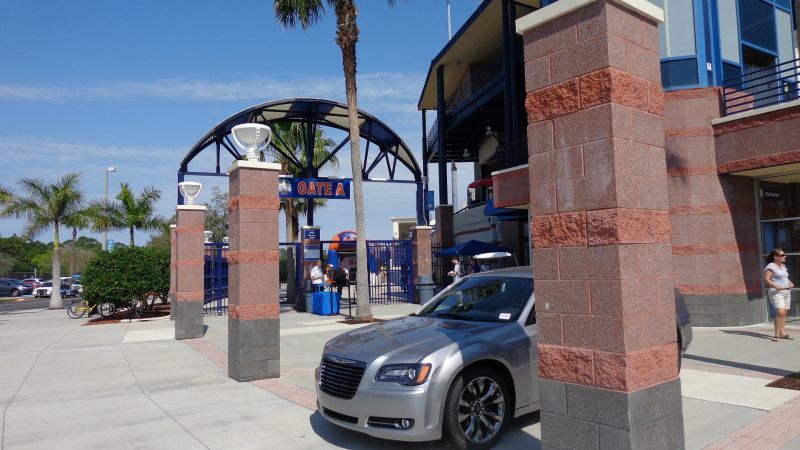 The Mets’ just won a World Series, and they felt entitled to a grand mini-me on Florida’s treasure coast. 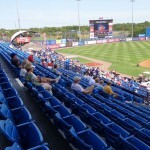 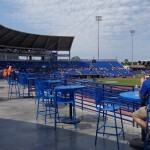 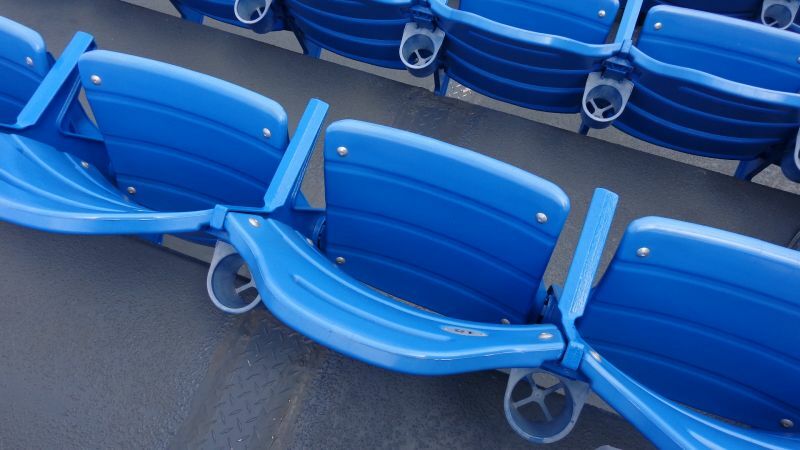 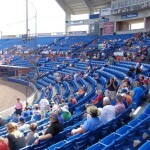 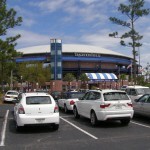 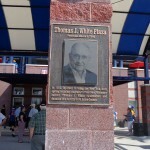 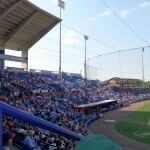 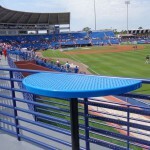 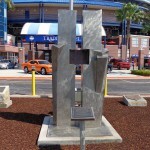 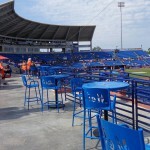 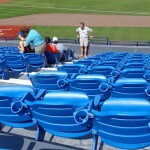 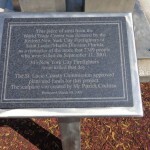 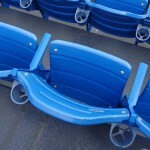 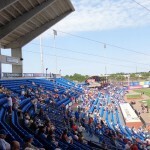 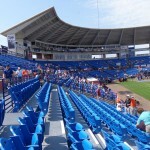 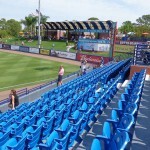 Thomas J. White’s design mimicked Shea Stadium as much as an 80s spring training ballpark could, from the playing dimensions and blue fold-down seats to the unabashed large-scale construction technique and exposed concrete. 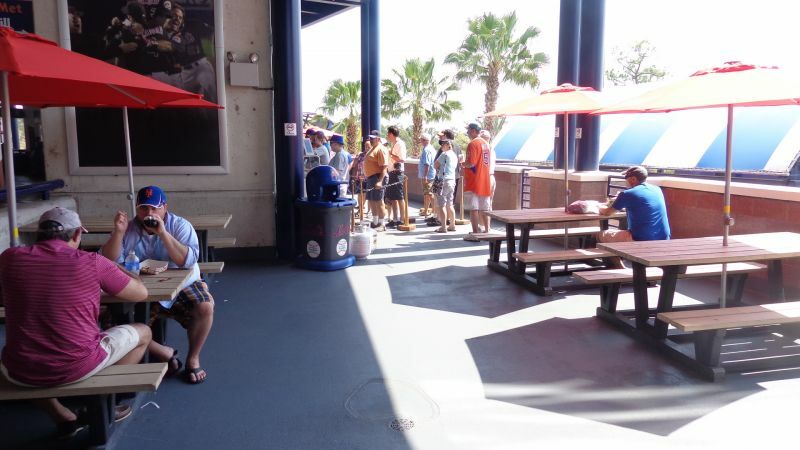 However, that emulation came at a price. 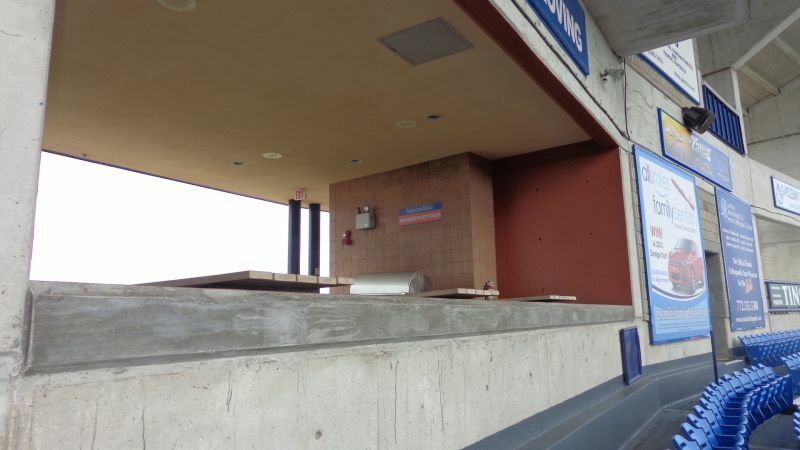 With that cantilevered concrete roof and four story concrete exposed exterior, this 1980s monstrosity couldn’t easily be retrofitted to meet modern sensibilities like some others. 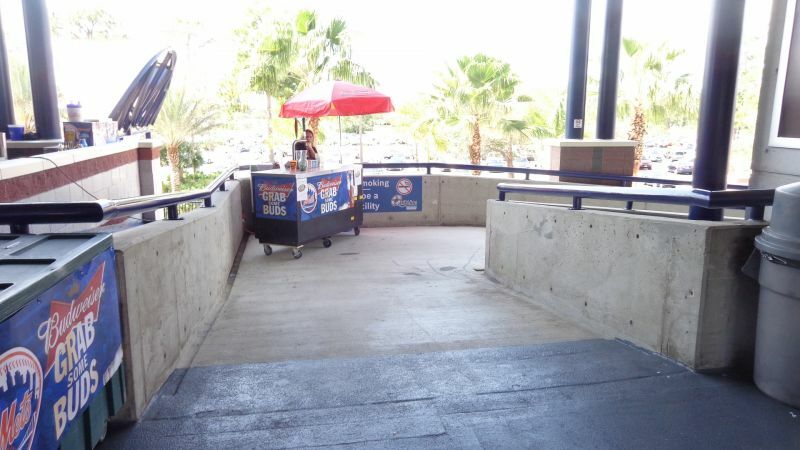 This was no intimate two-story concrete icebox that could be beautified with one brushstroke, like Ed Smith Stadium with the Orioles. 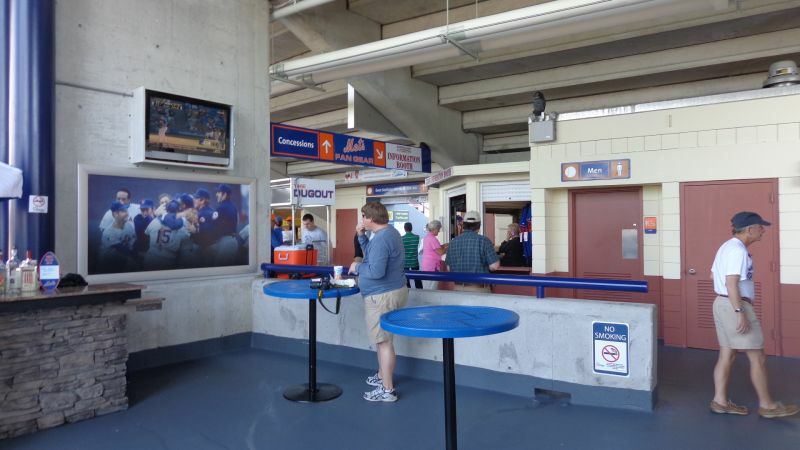 The Mets, unfortunately, built a large, imposing concrete monster that would have to be demolished and rebuilt if it were to truly meet 21st century architectural trends. 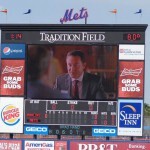 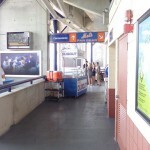 By the early 2000s, when their 15-year lease was about to expire, the Mets wanted to renovate the now archaic looking building. 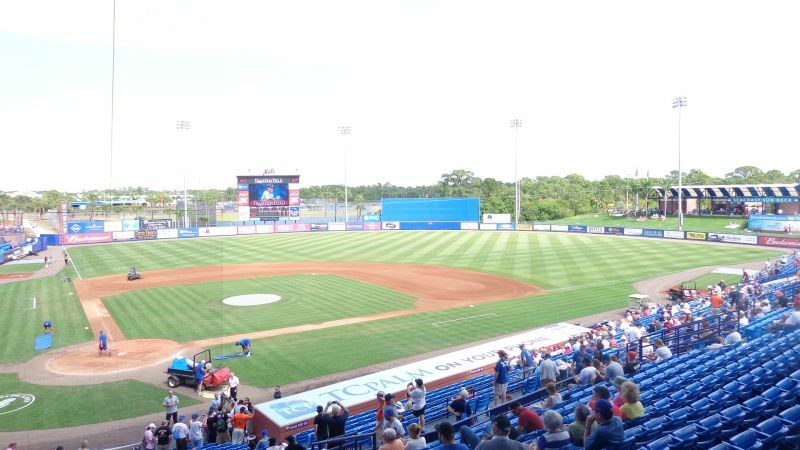 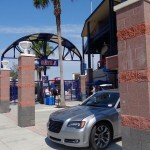 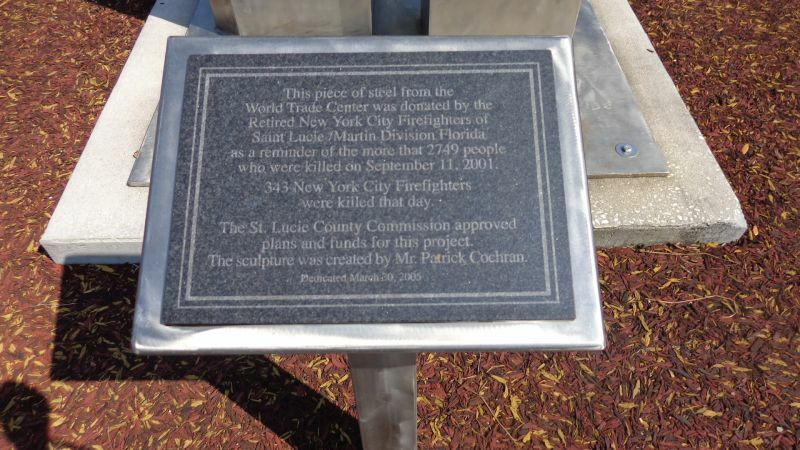 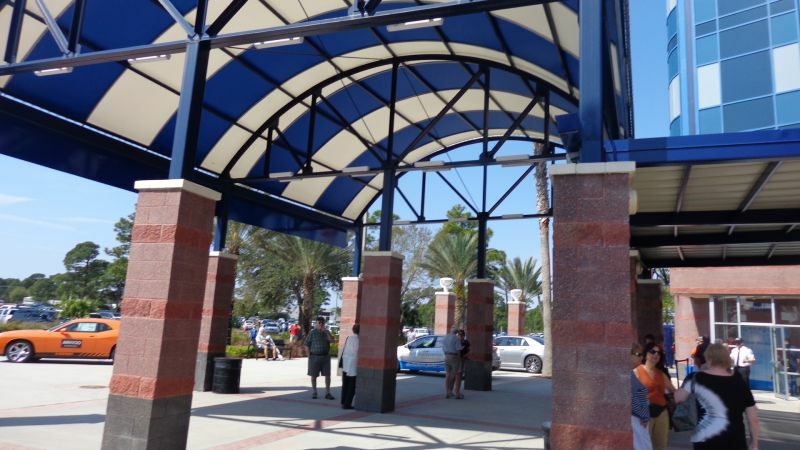 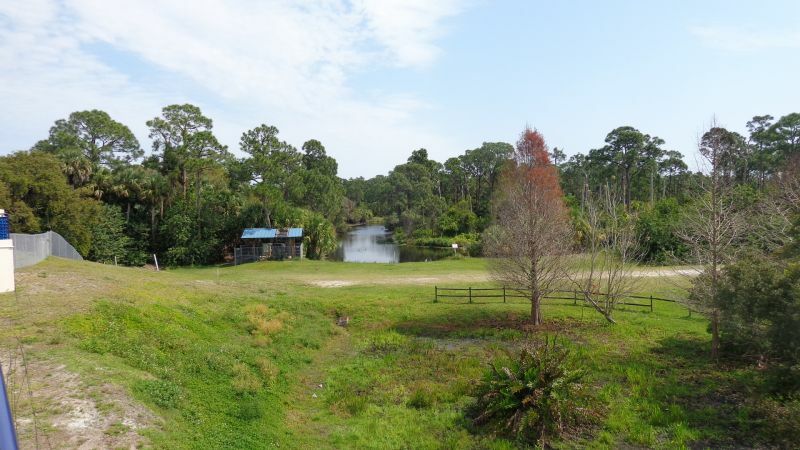 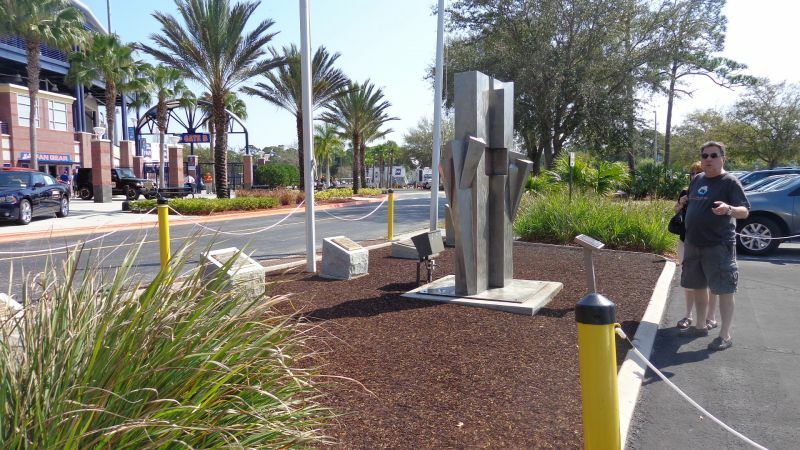 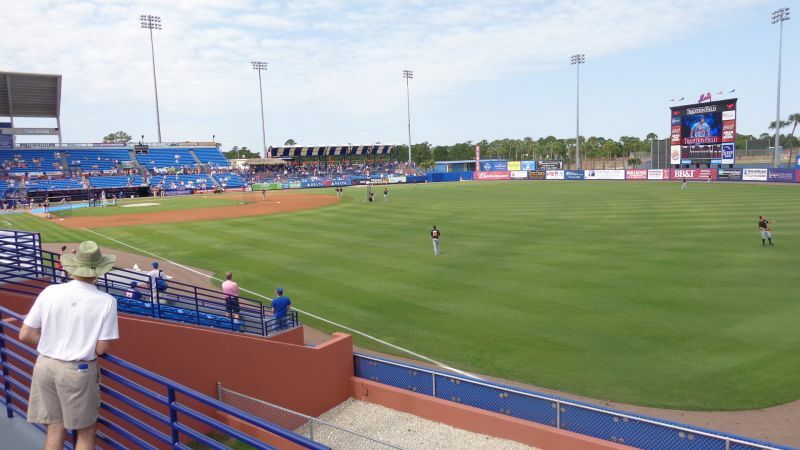 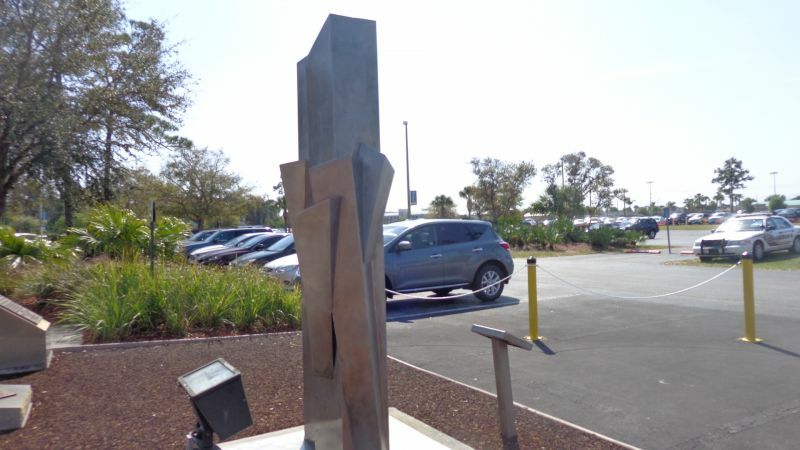 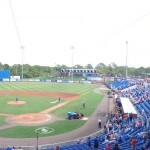 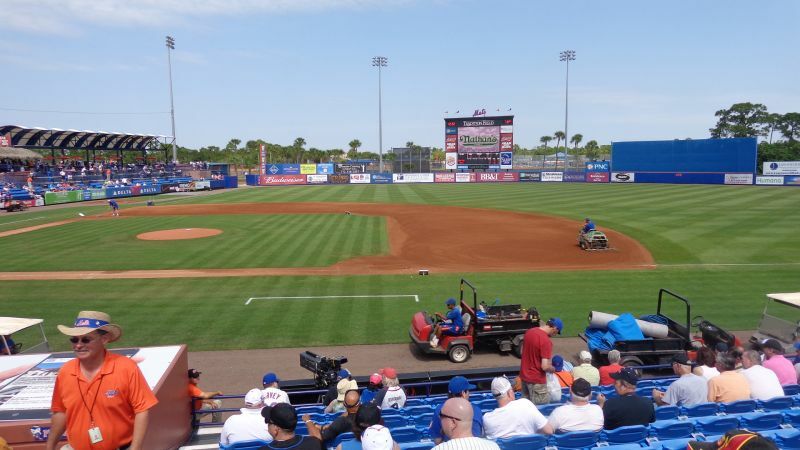 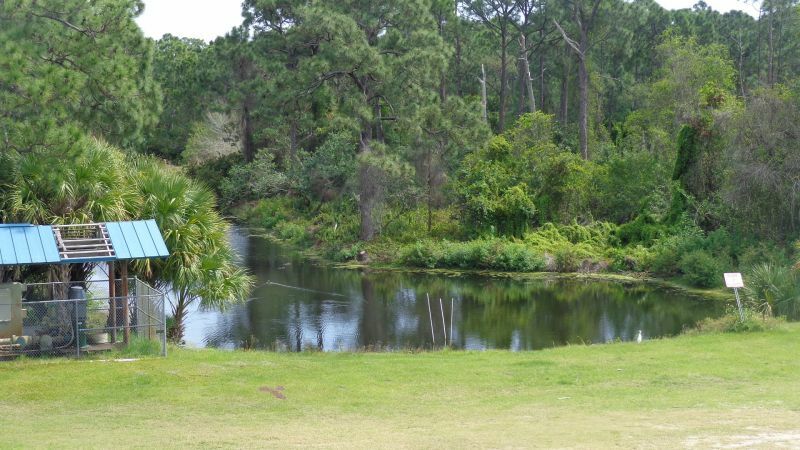 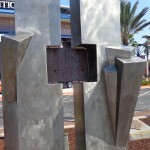 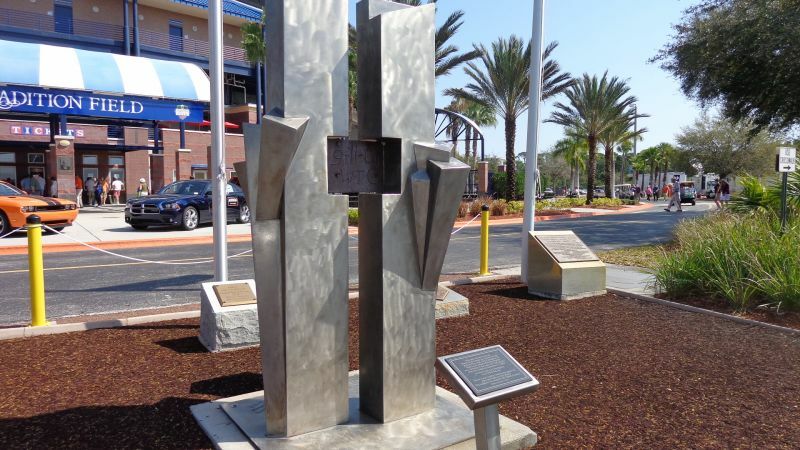 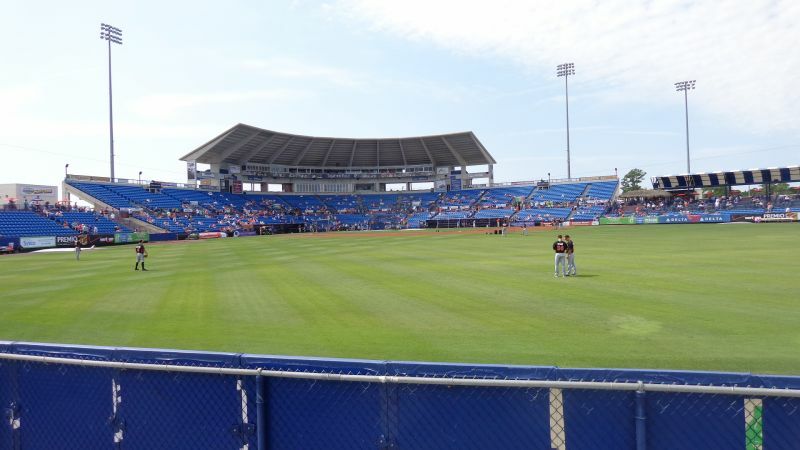 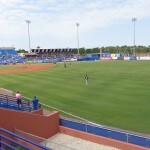 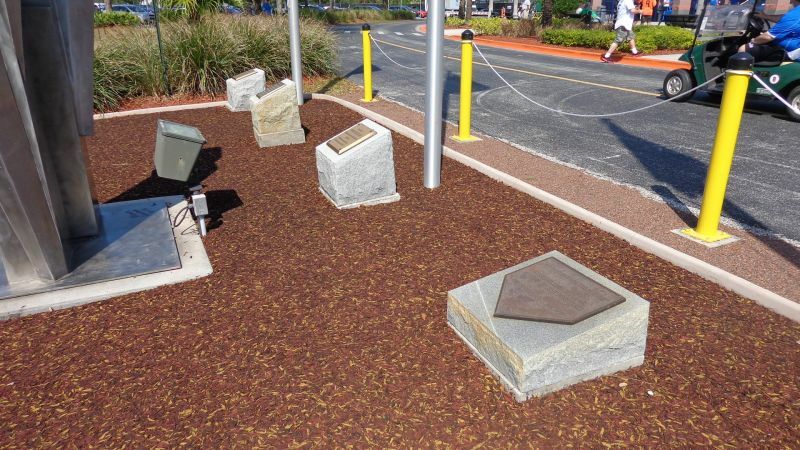 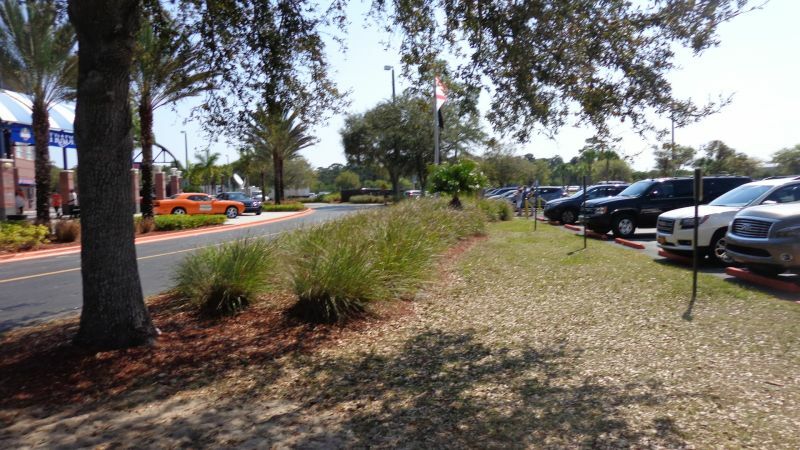 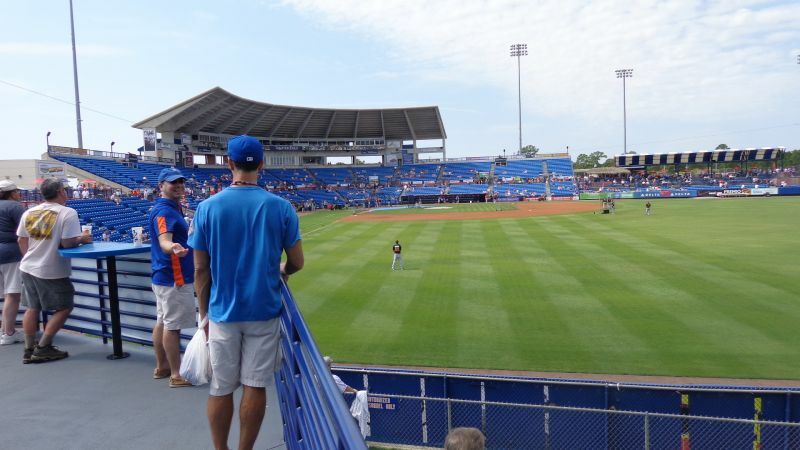 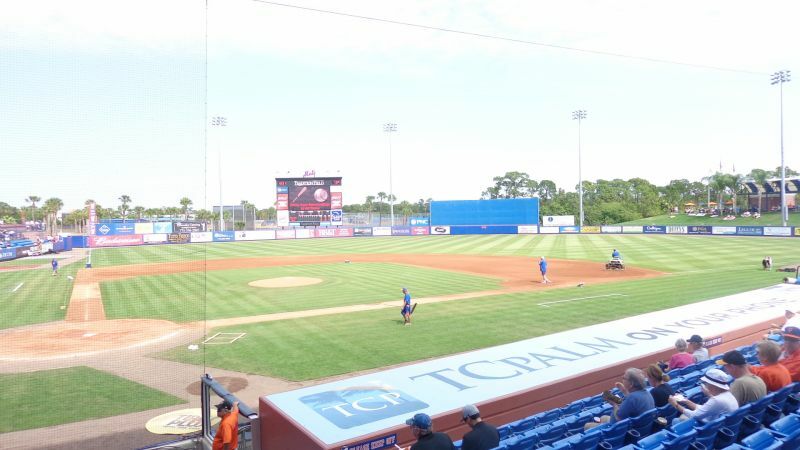 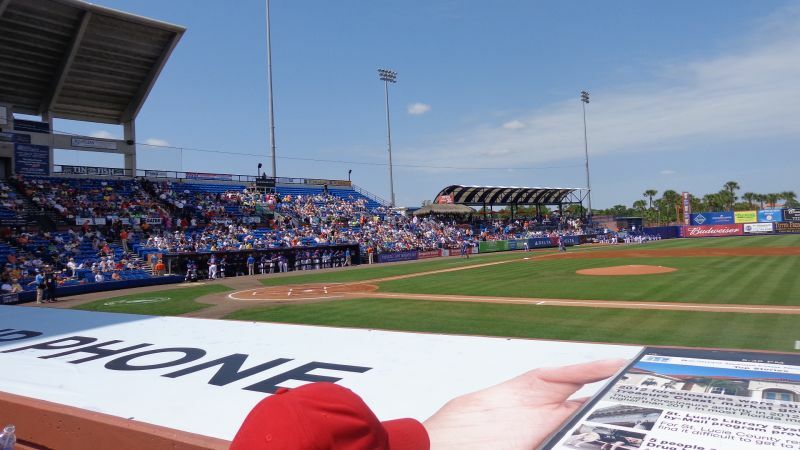 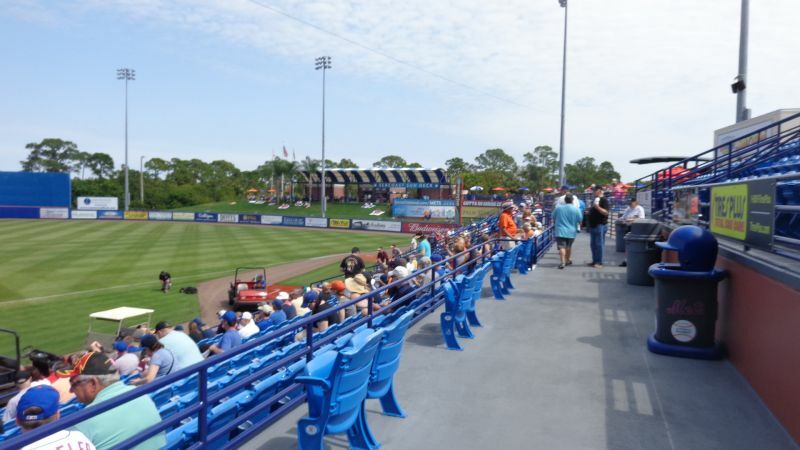 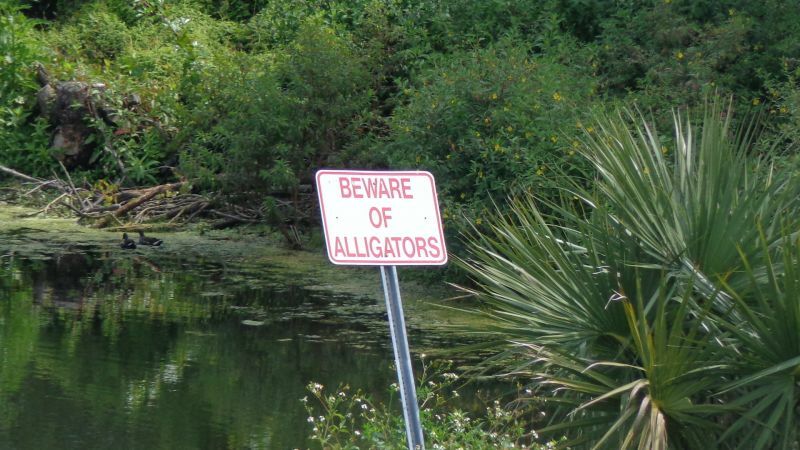 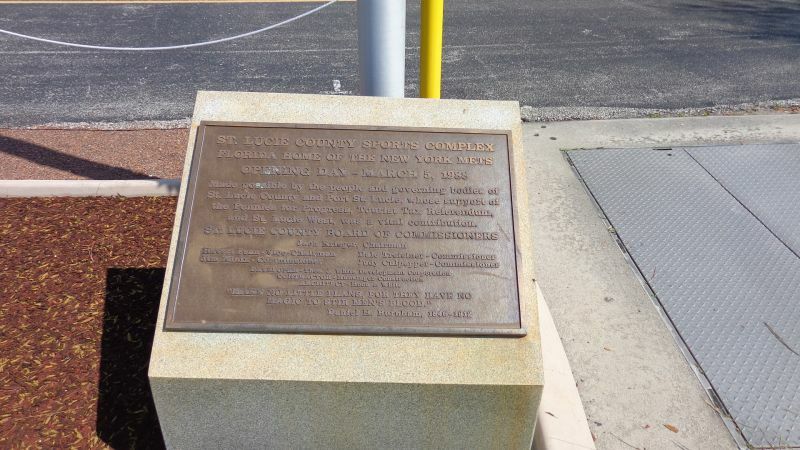 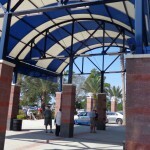 They were partial to Port St Lucie, but realized this was a facility that couldn’t get rid of its more significant age marks without completely leveling the structure. 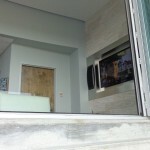 Cost wise, it just made sense to cosmetically make the best of it. 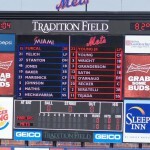 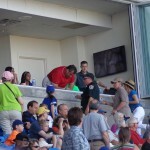 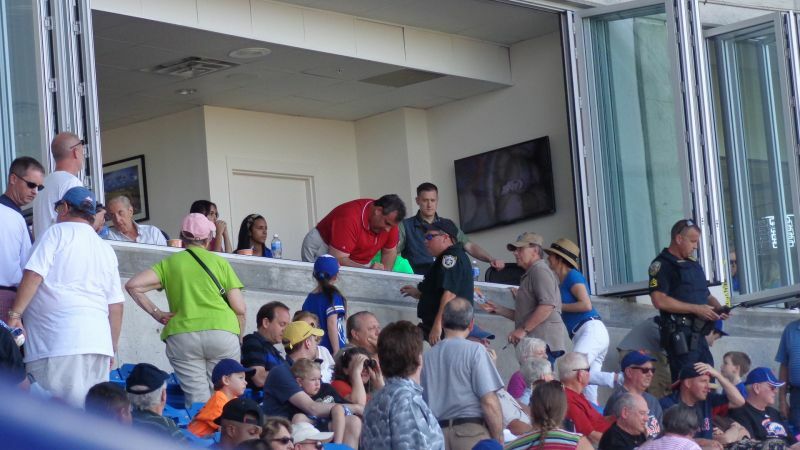 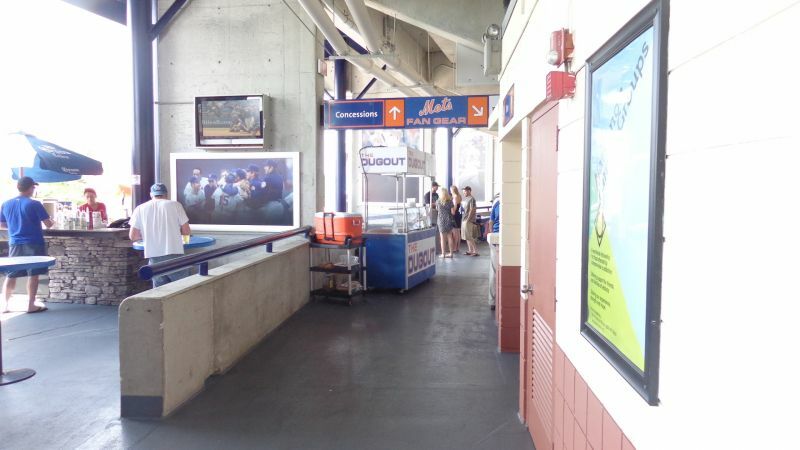 Without resorting to demolition, you really have to hand it to the Mets for doing their best. 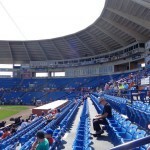 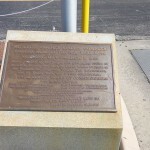 They’ve yielded just about as much benefit in major renovations and year-to-year upgrades per dollar spent as they could. 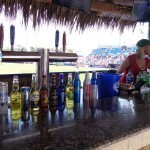 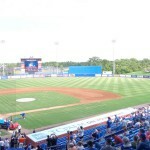 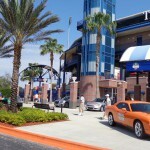 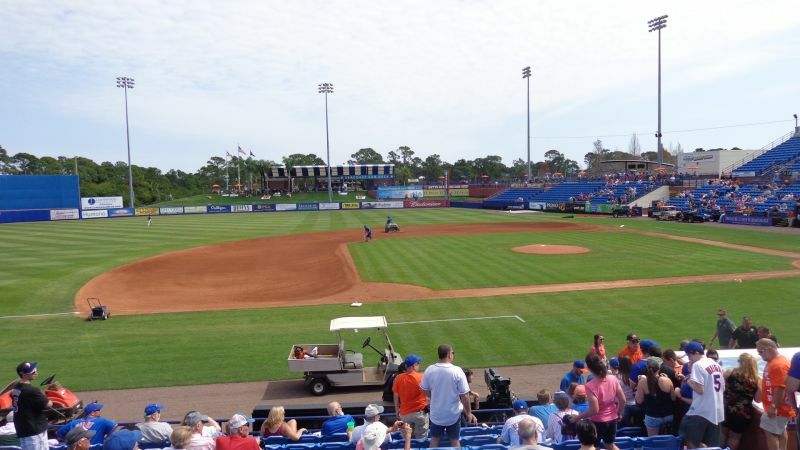 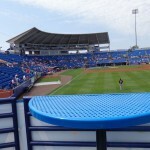 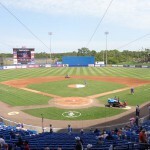 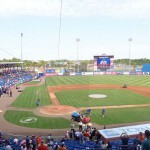 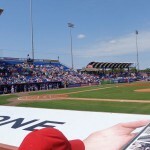 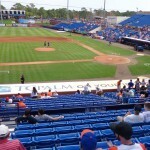 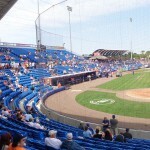 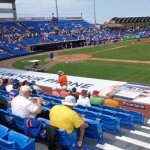 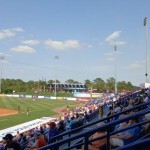 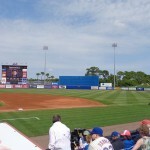 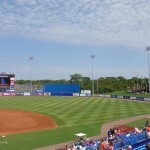 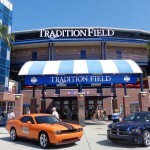 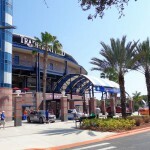 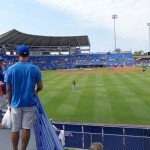 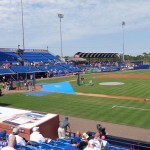 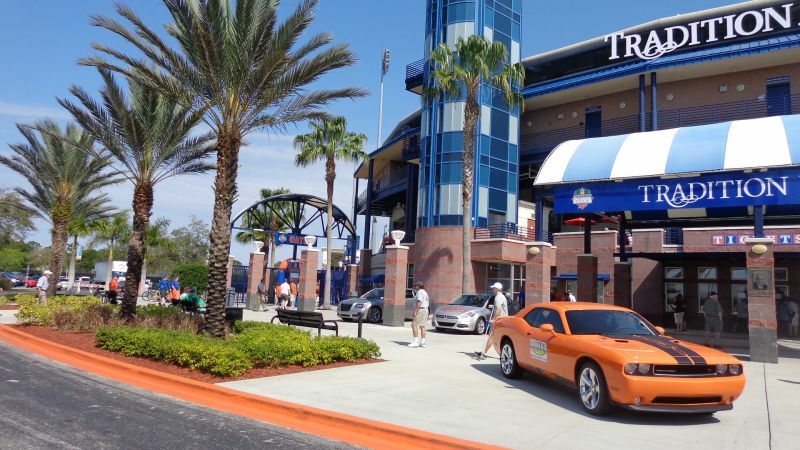 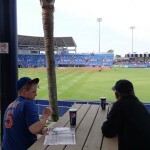 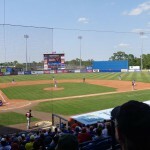 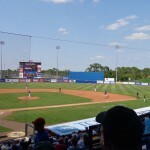 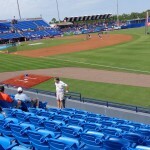 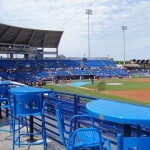 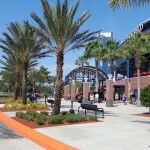 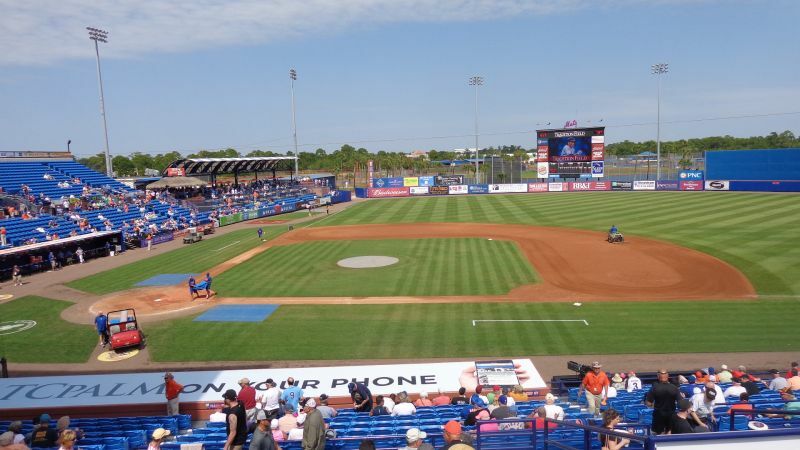 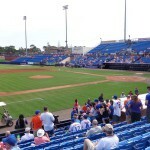 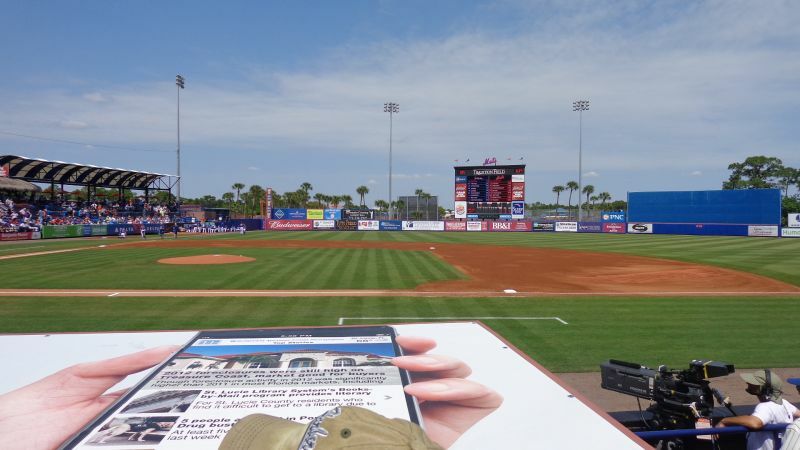 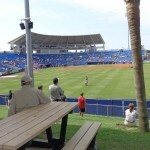 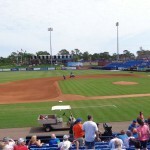 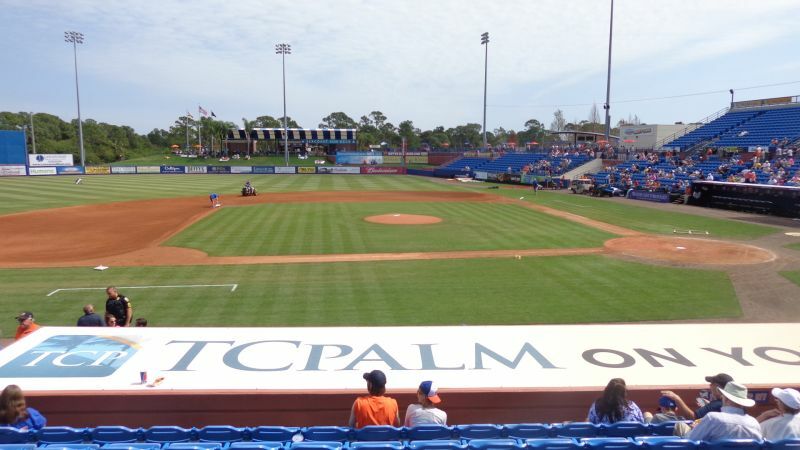 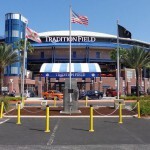 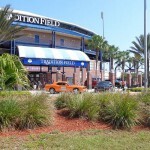 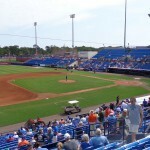 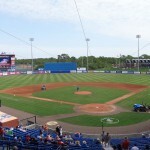 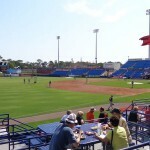 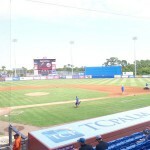 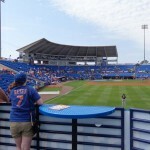 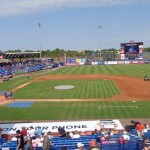 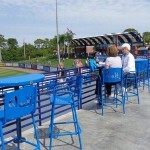 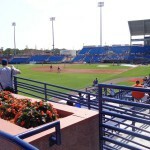 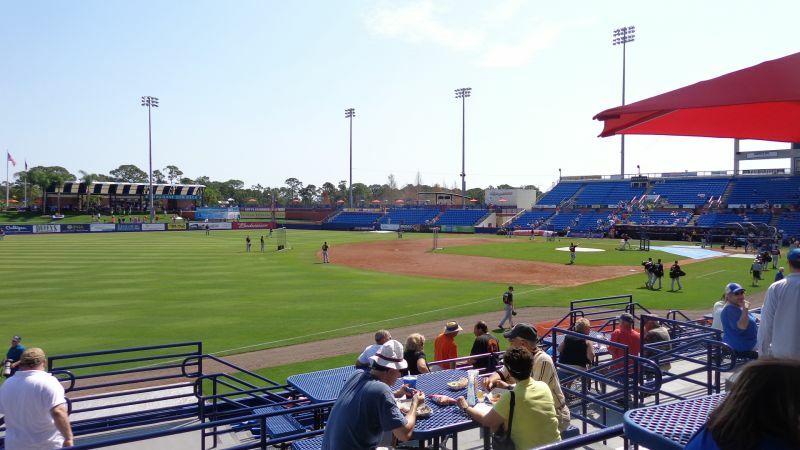 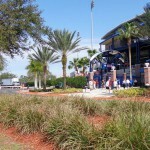 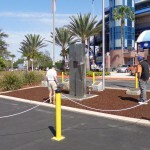 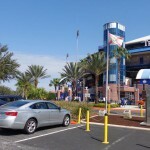 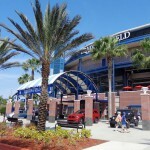 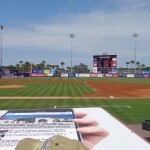 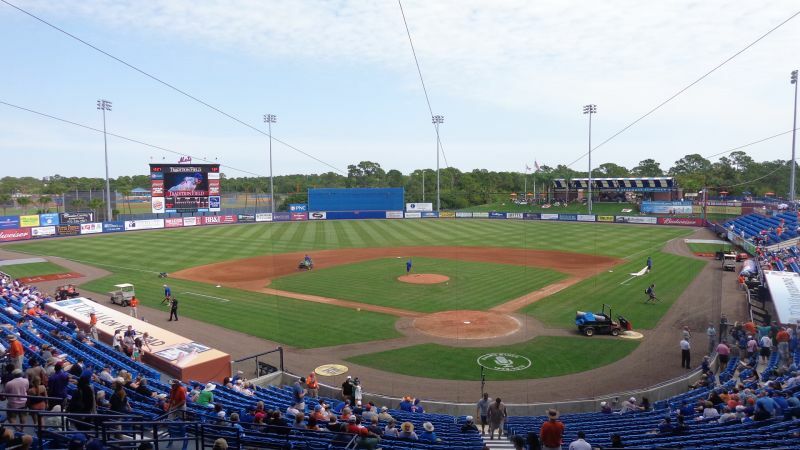 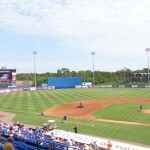 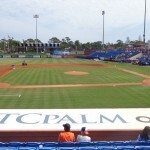 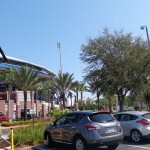 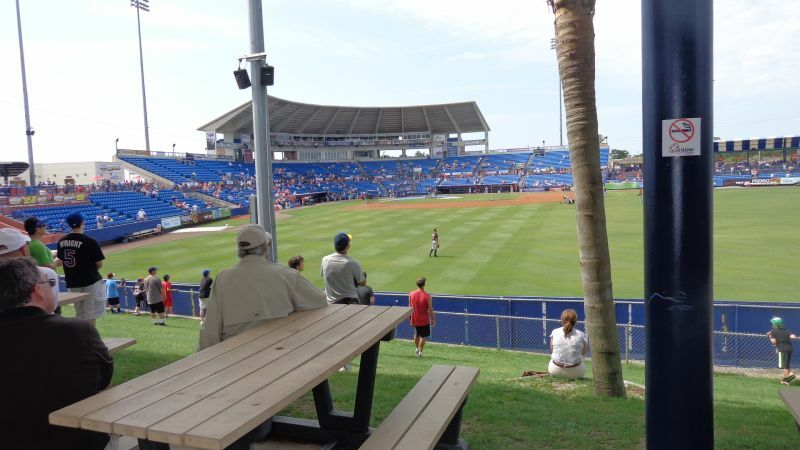 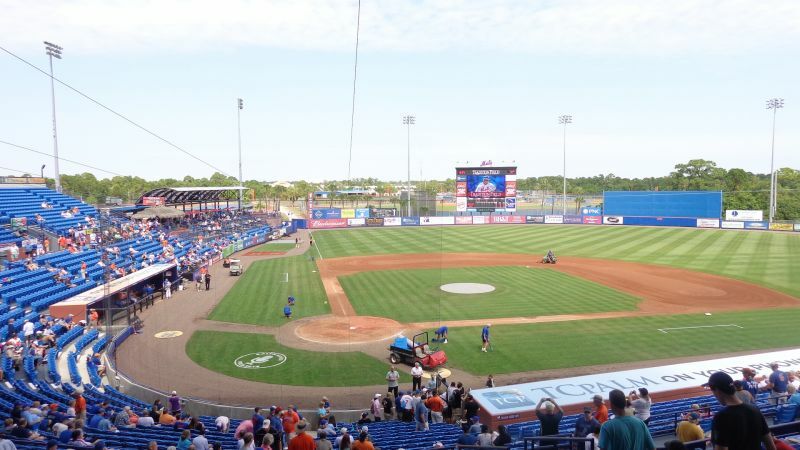 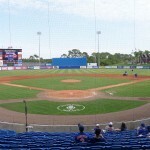 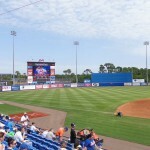 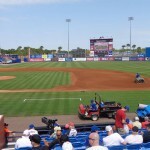 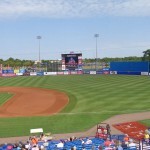 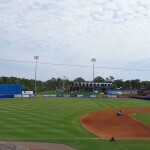 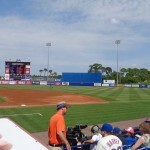 Tradition Field will never be in the top half of spring training ballparks, but they maintained the ballpark well. 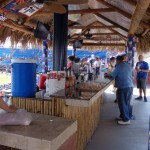 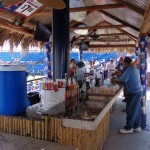 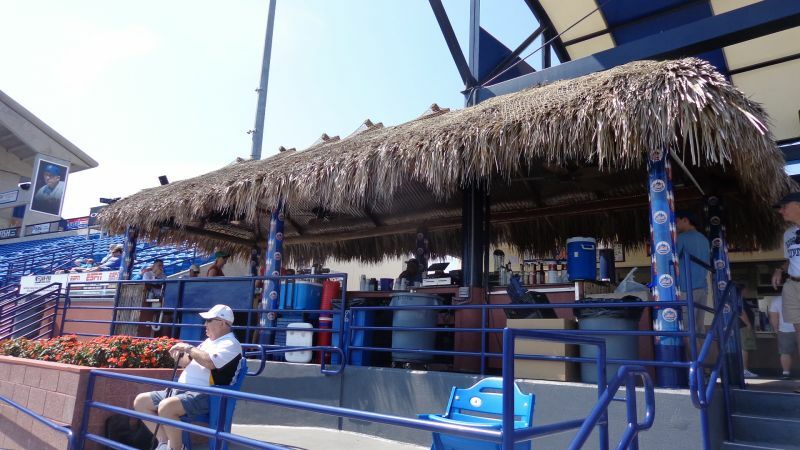 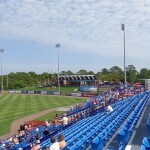 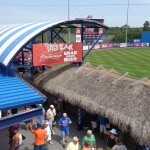 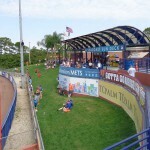 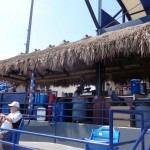 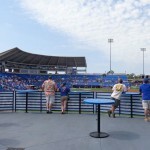 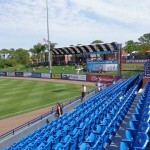 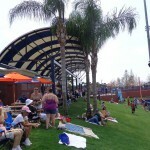 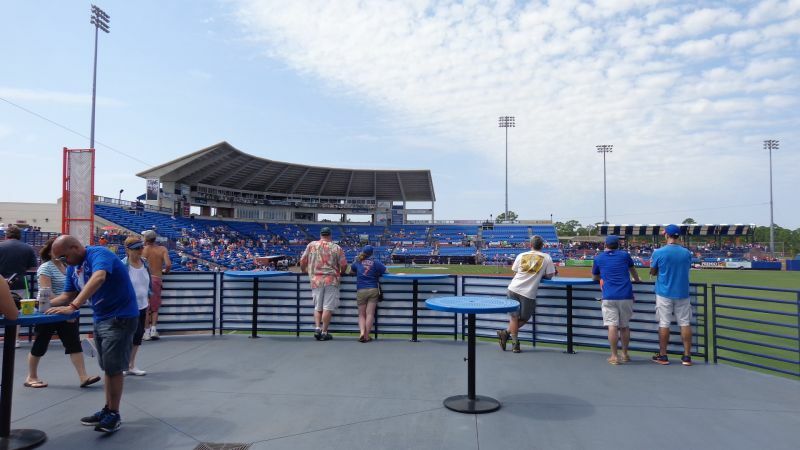 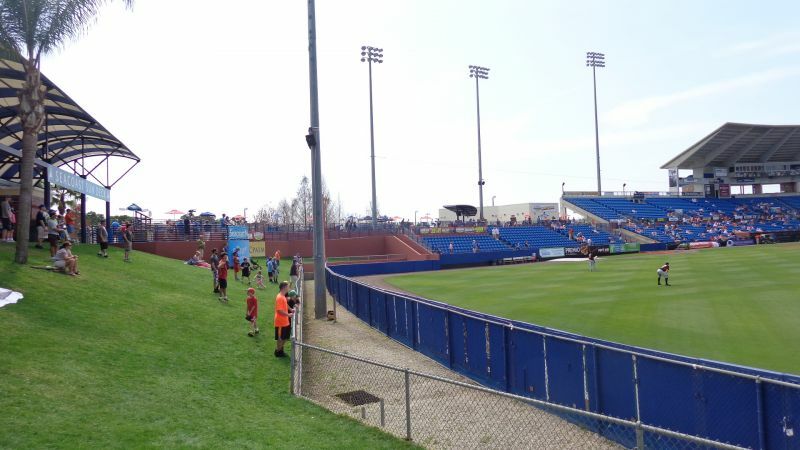 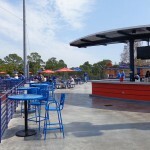 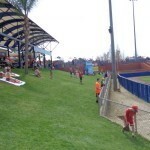 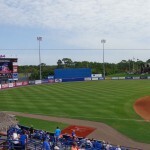 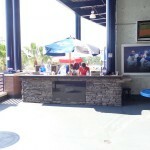 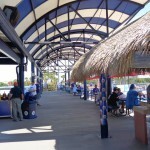 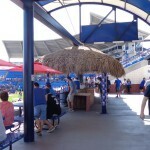 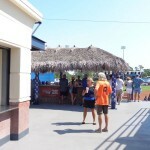 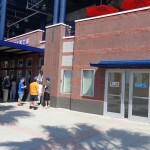 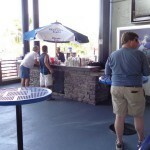 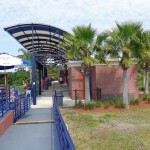 The 2004 renovations added a nice brick façade to the uncloaked concrete, as well as a Tiki bar in left field and a berm beyond the right field fence. 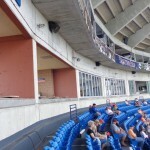 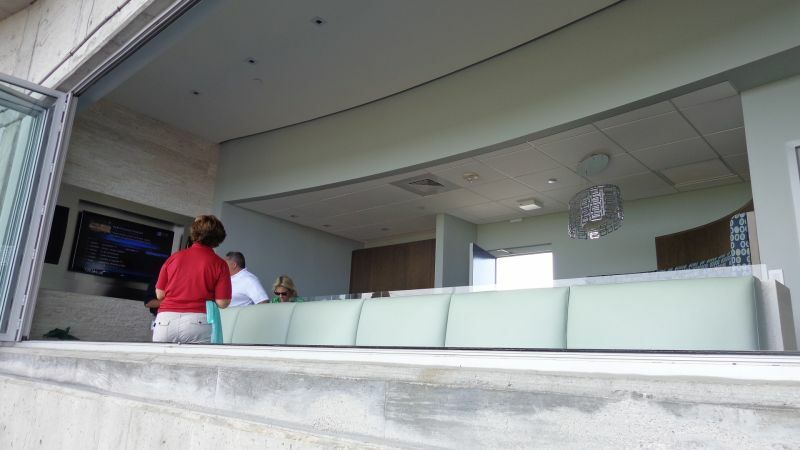 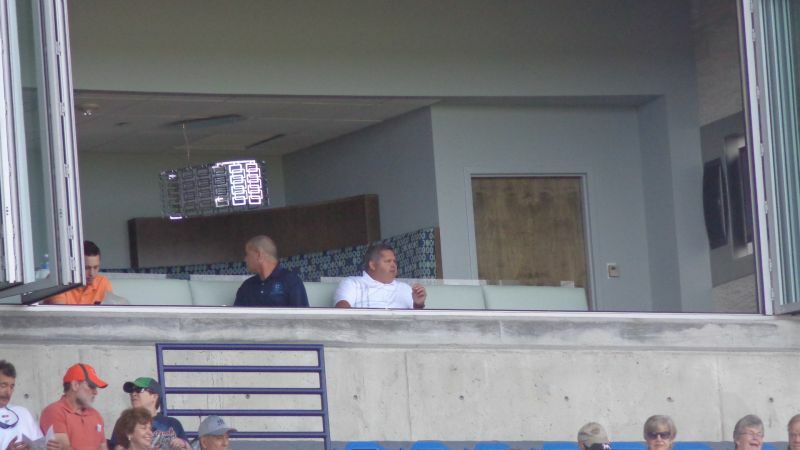 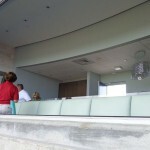 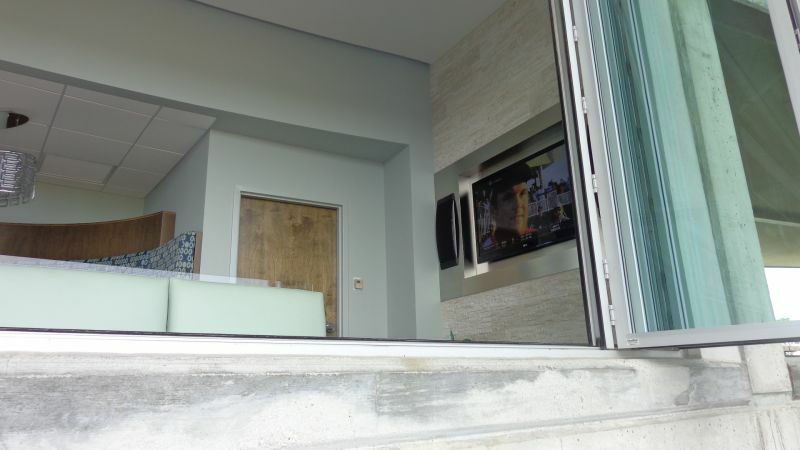 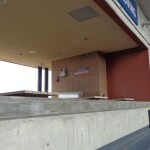 They also added luxury suites in those random empty spaces between the back of the concrete façade. 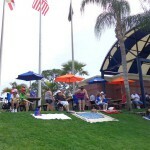 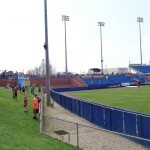 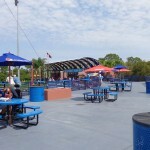 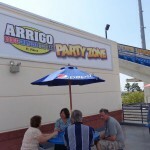 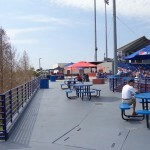 In 2012, they added a giant video board and a new party area in right field. 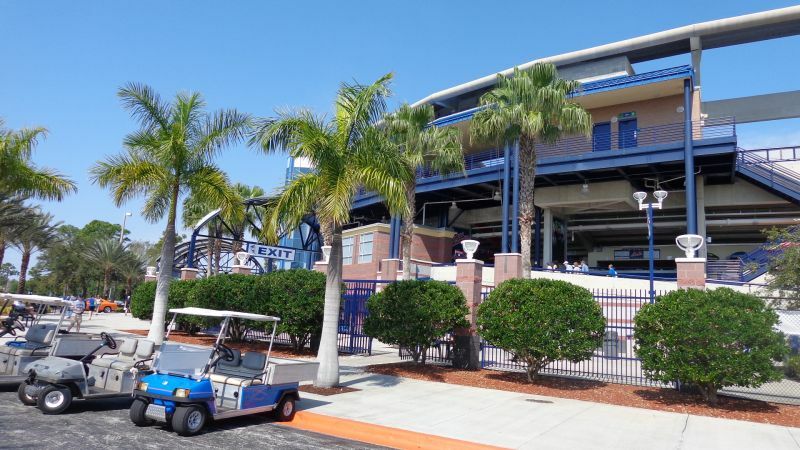 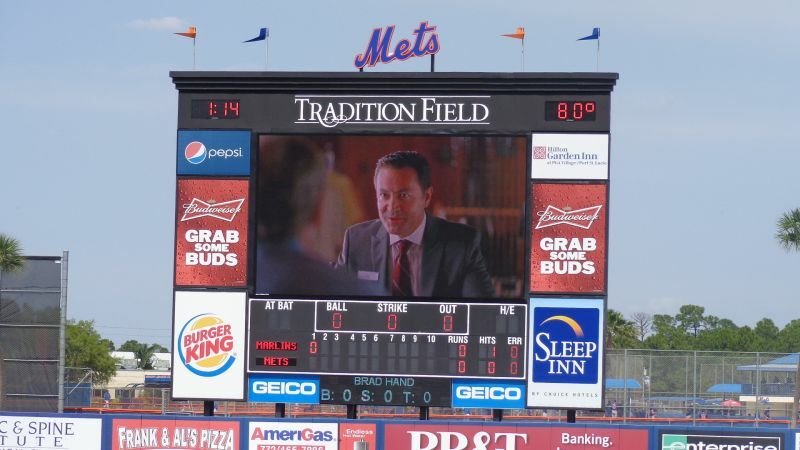 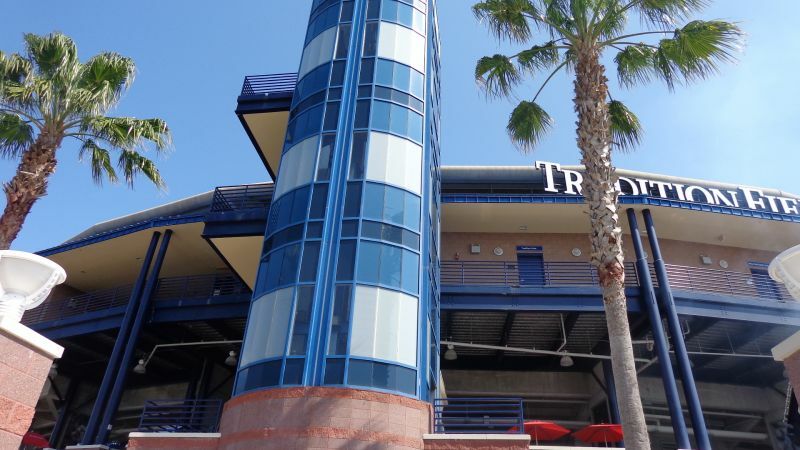 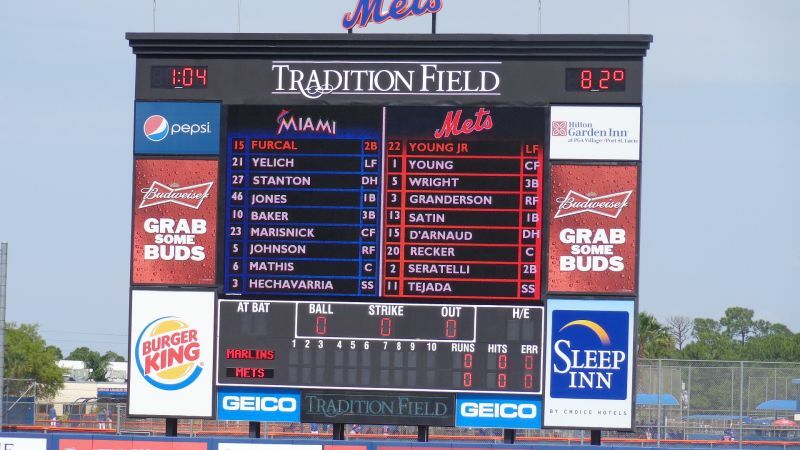 The Mets had such a sanguine perspective on their Port St. Lucie pad that they added room for a potential second tenant (well, they just wanted baseball to stay on the Treasure Coast). 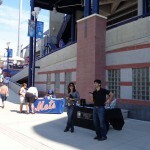 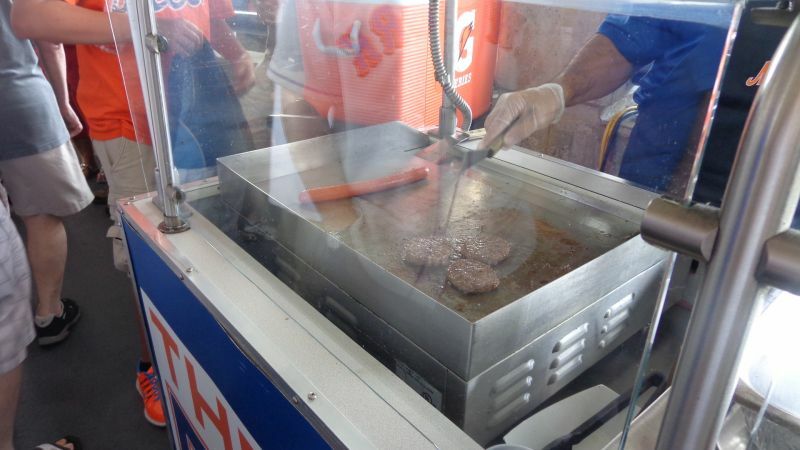 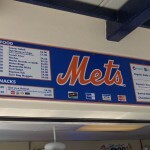 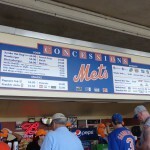 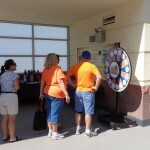 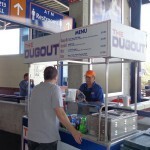 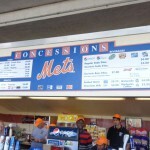 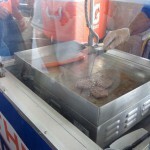 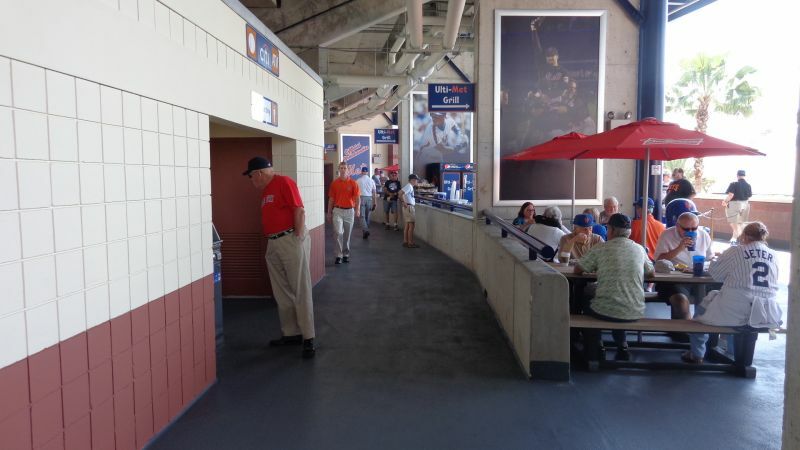 The Mets really excel in putting their cramped concourse space to the best possible use. 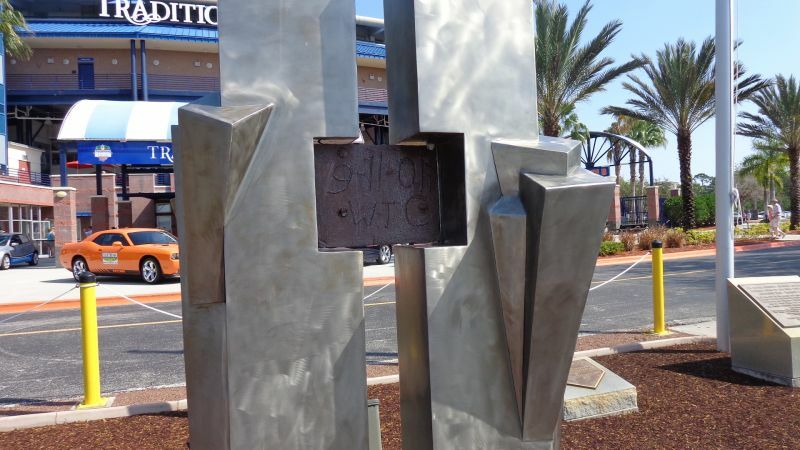 Hoon & White architects (boy, they really took off, huh?) 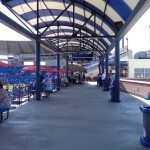 built the main concourse above street level. 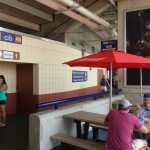 This means it would be more expensive to expand the concourse. 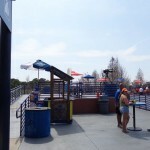 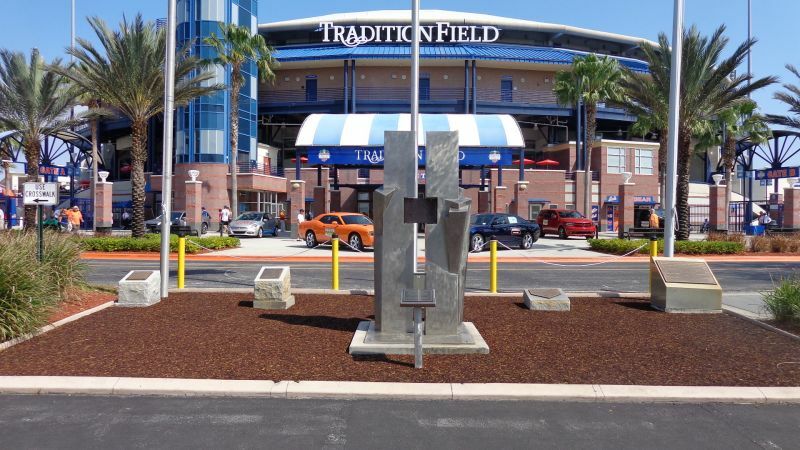 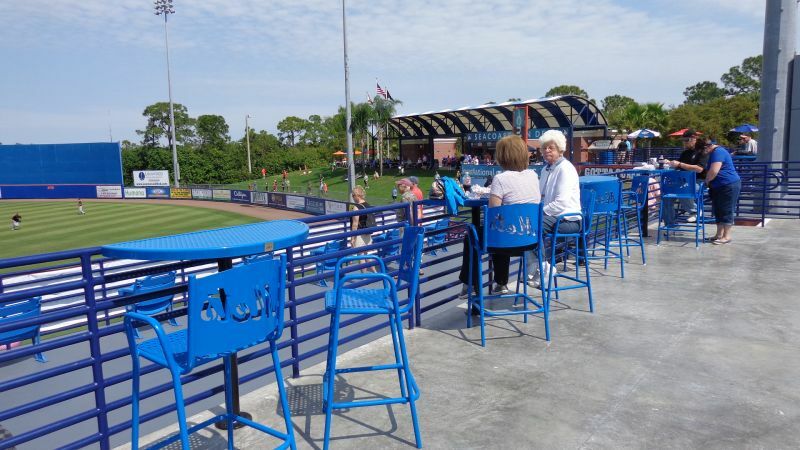 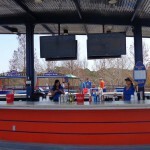 In the backdrop of the ugly concrete roof looming over the ballpark experience, Tradition Field has added some nice amenities. 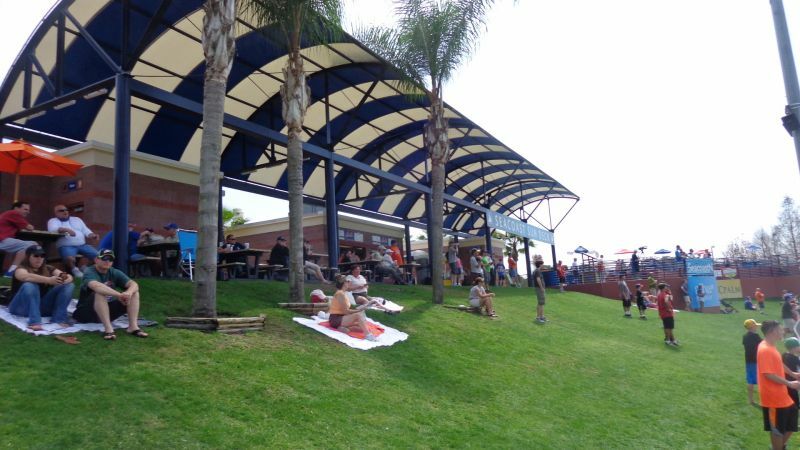 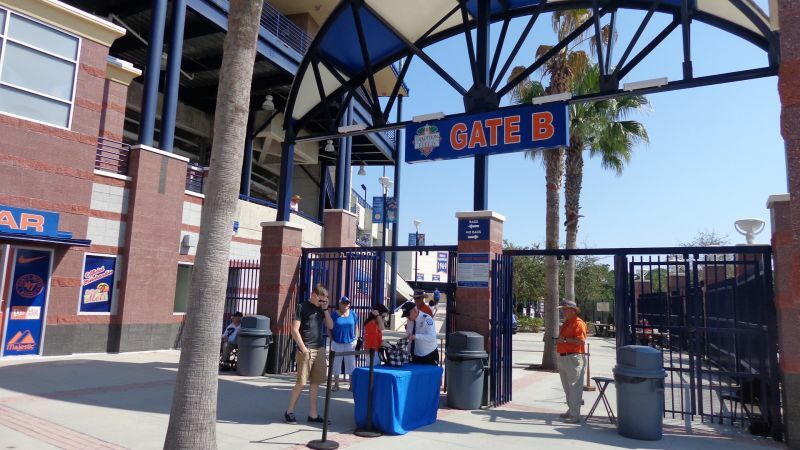 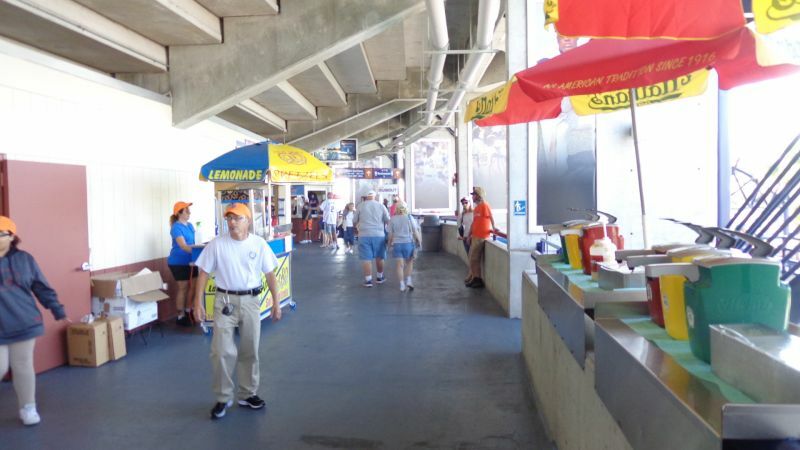 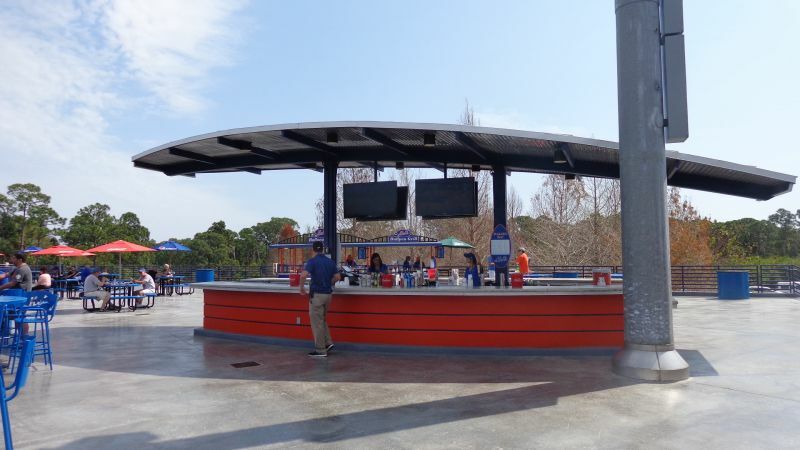 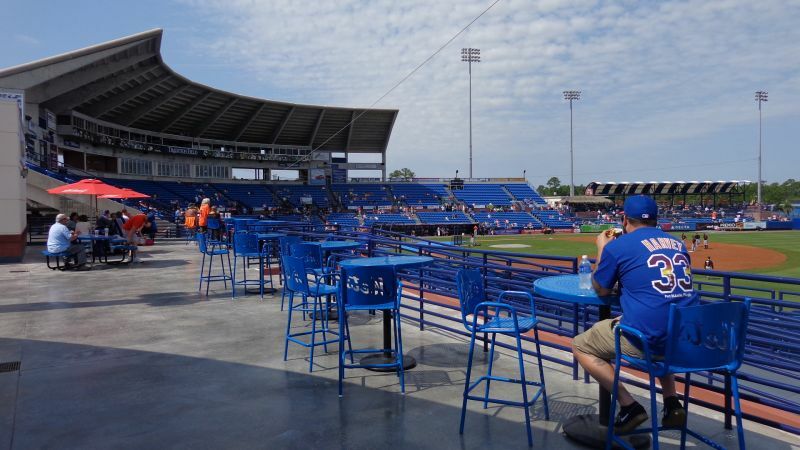 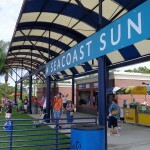 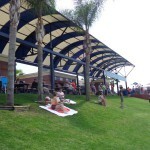 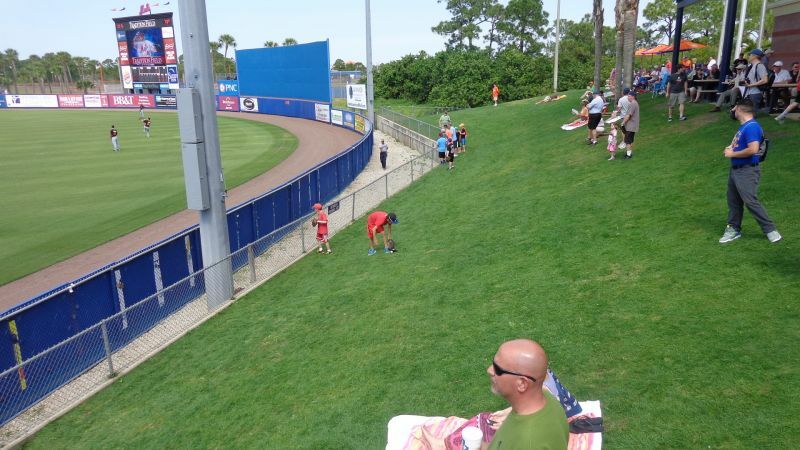 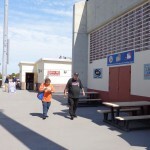 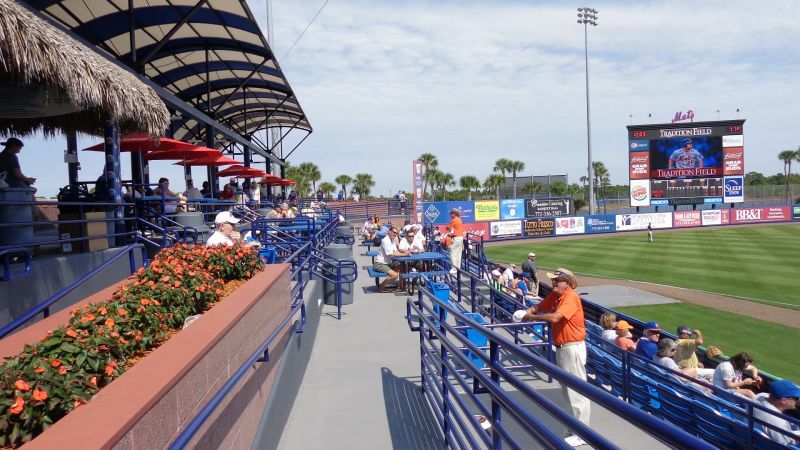 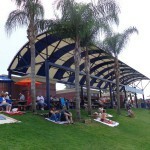 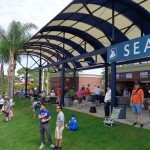 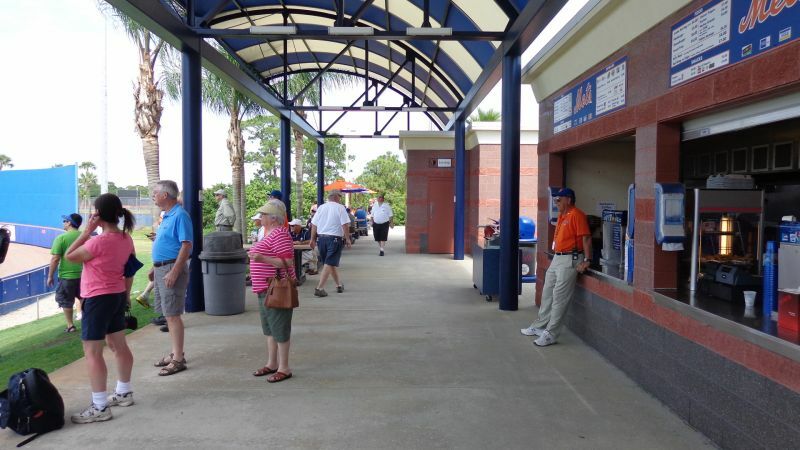 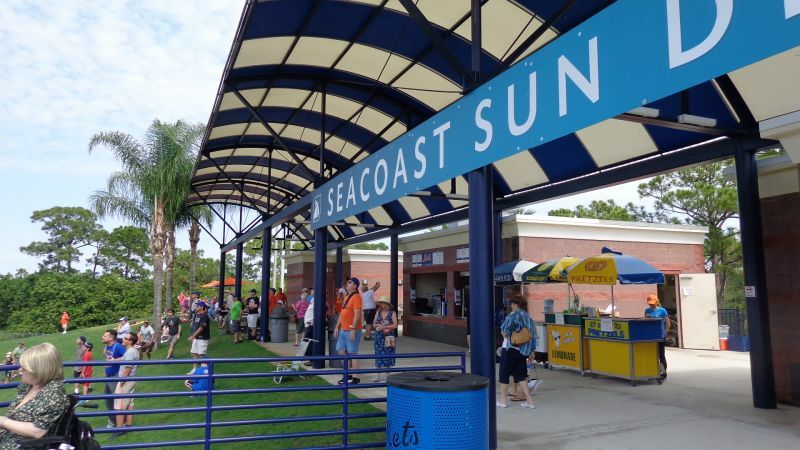 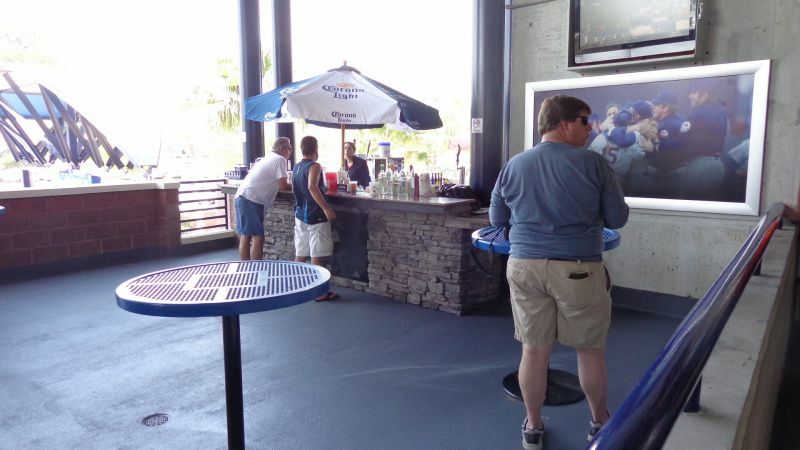 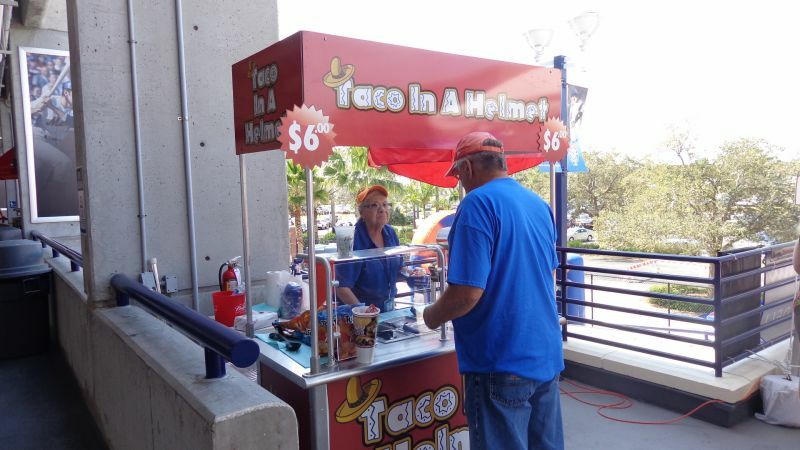 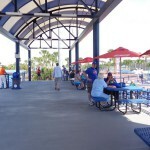 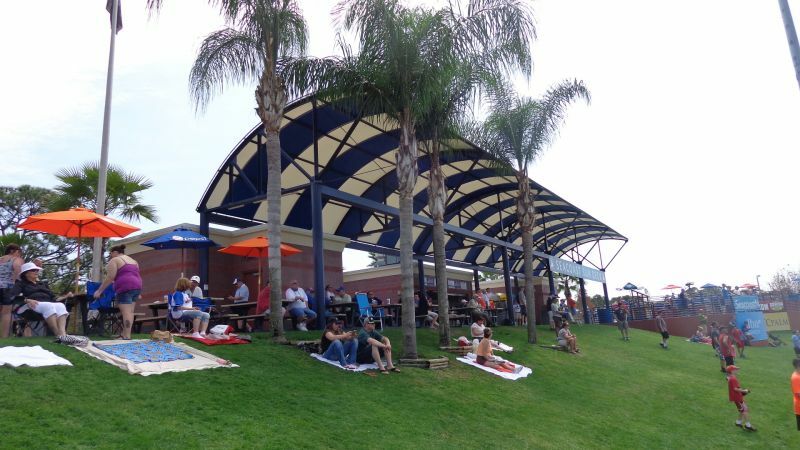 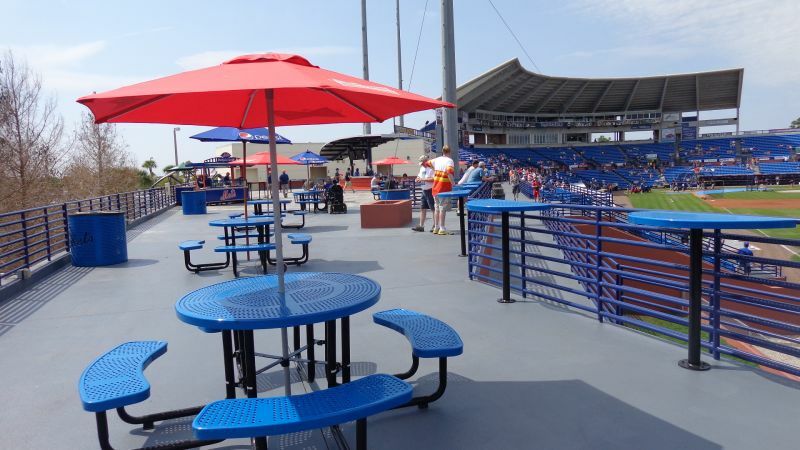 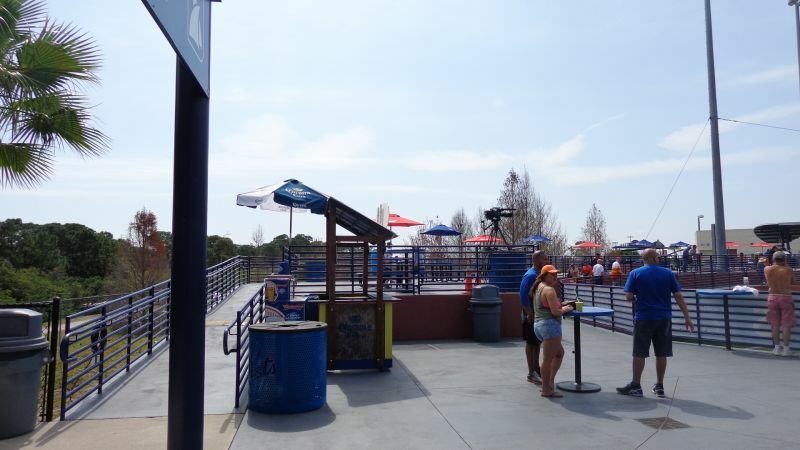 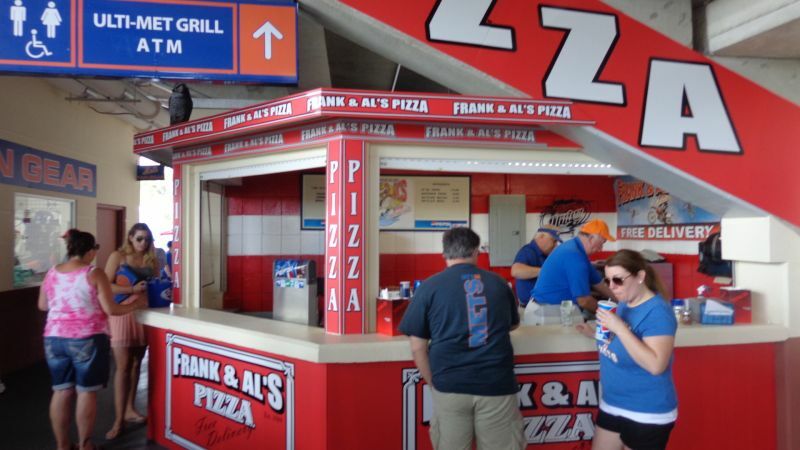 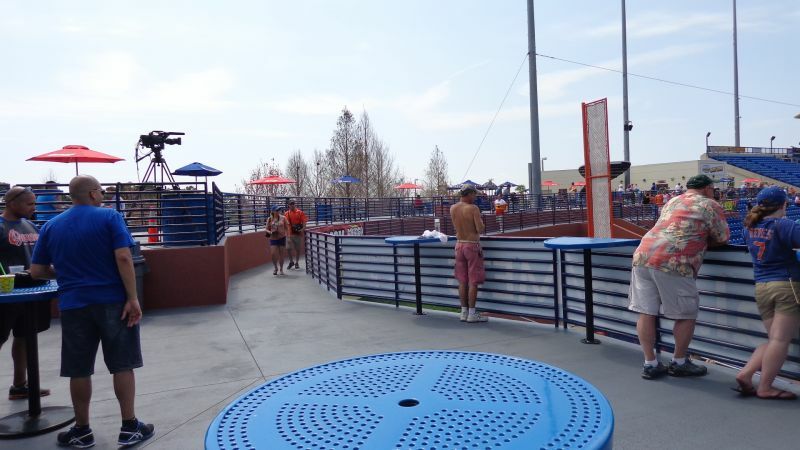 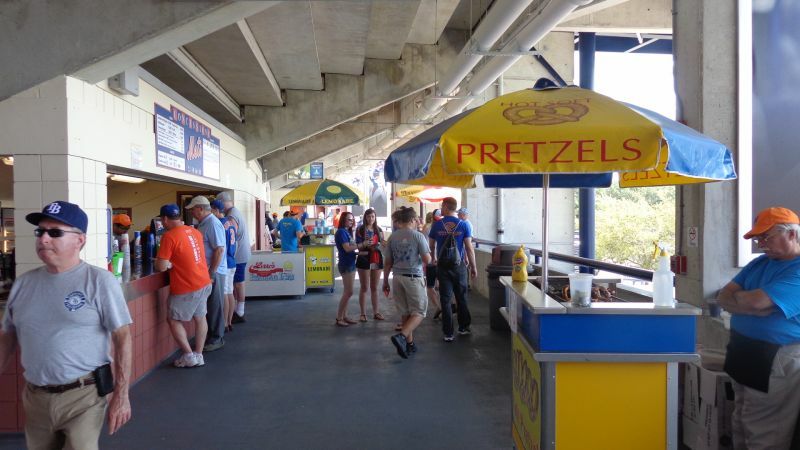 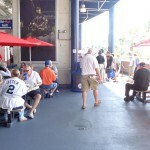 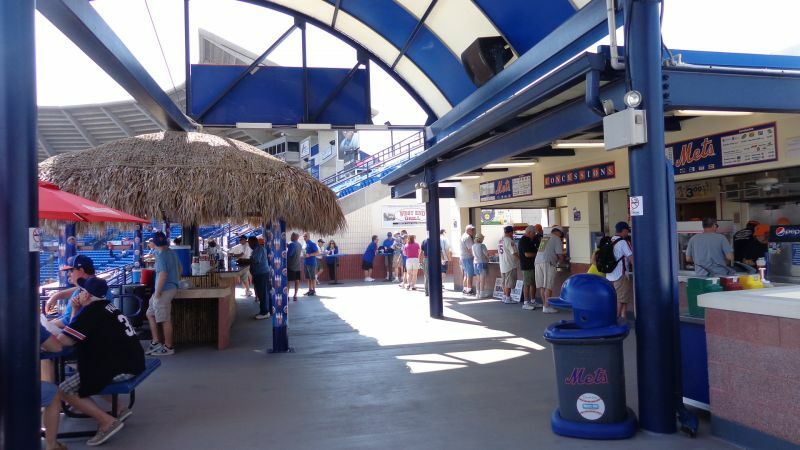 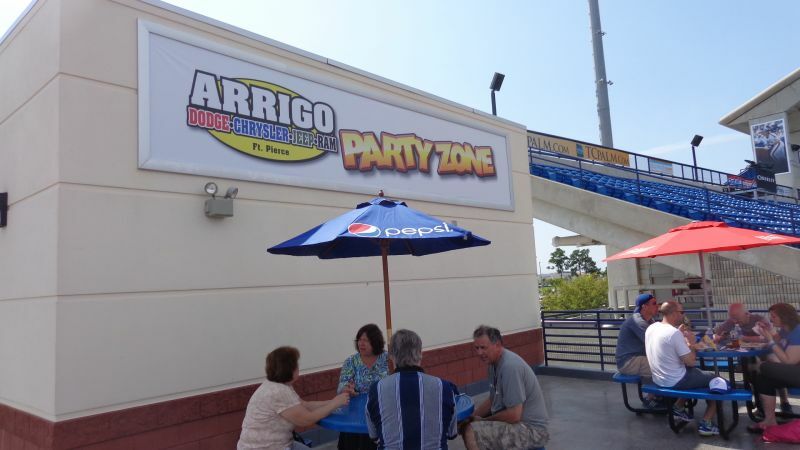 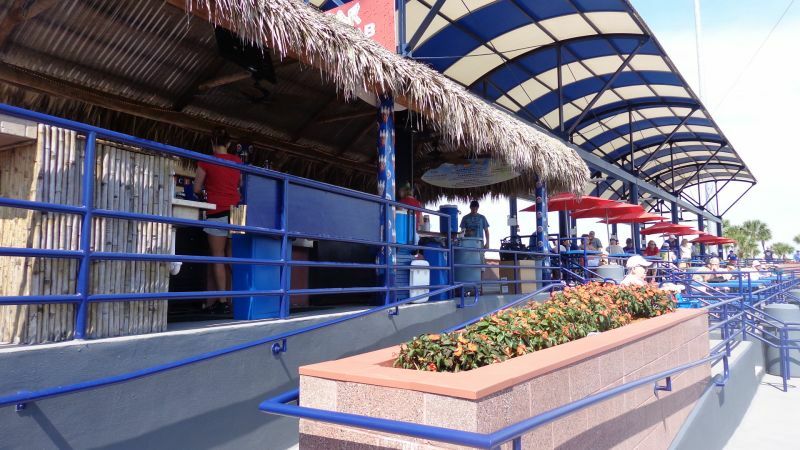 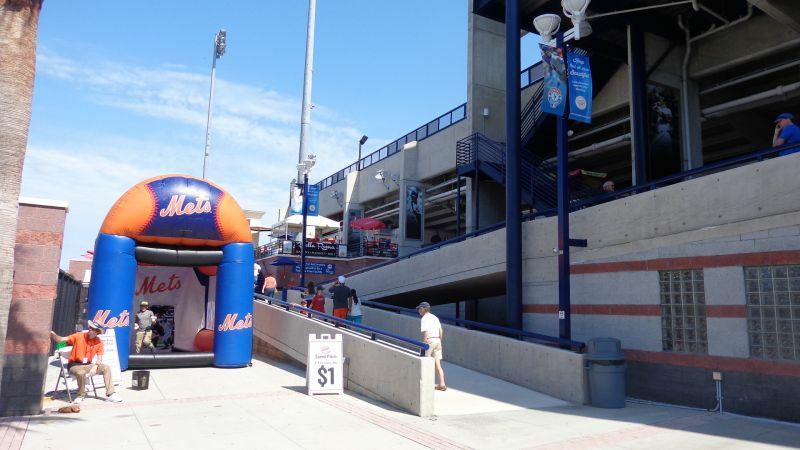 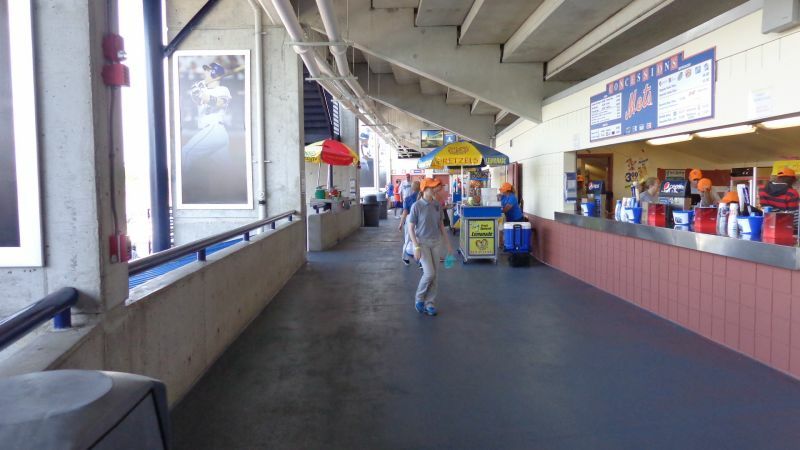 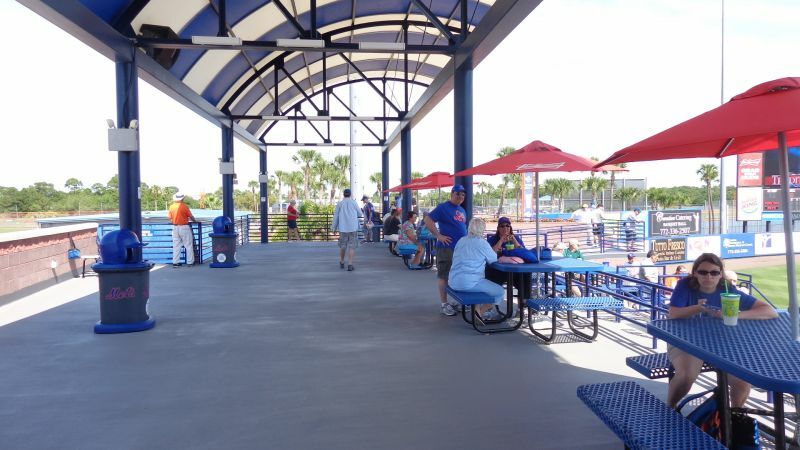 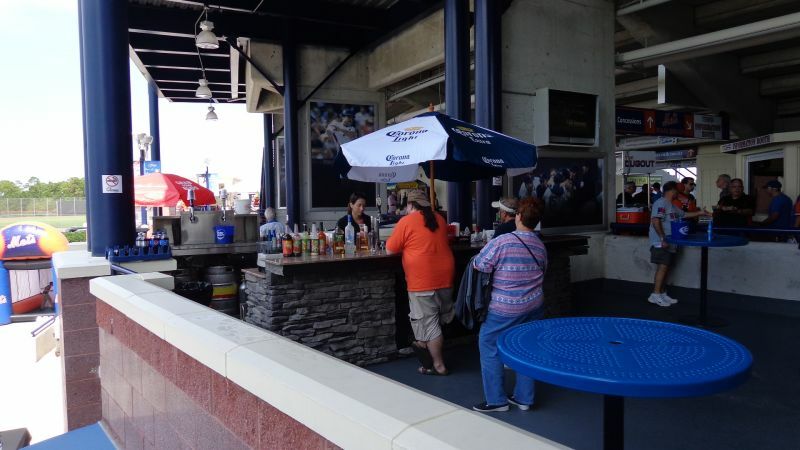 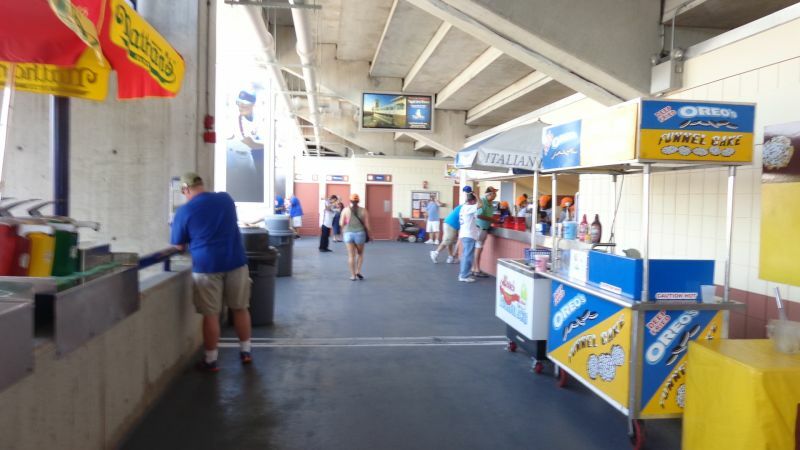 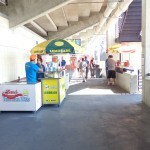 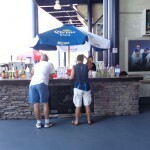 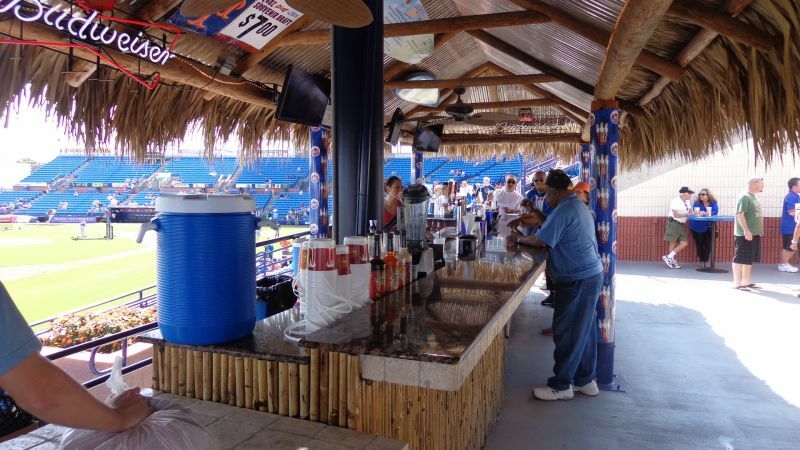 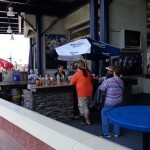 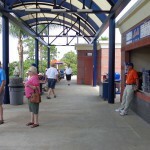 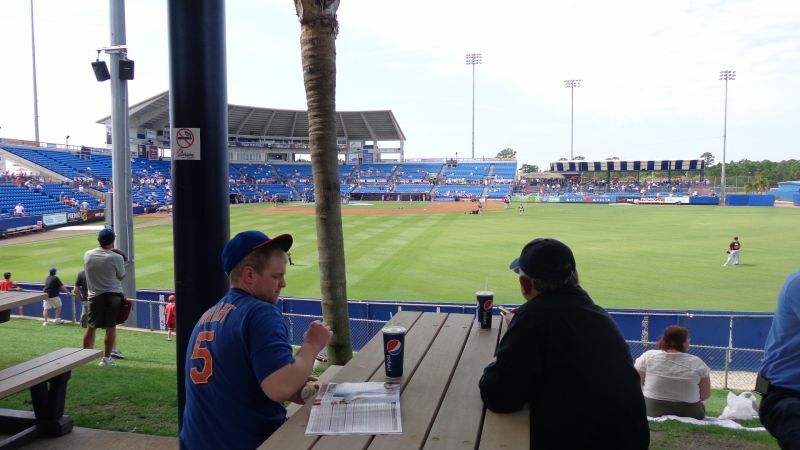 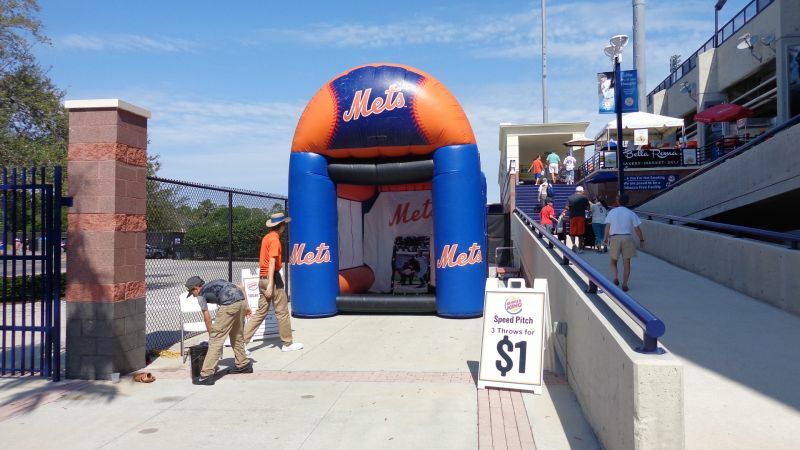 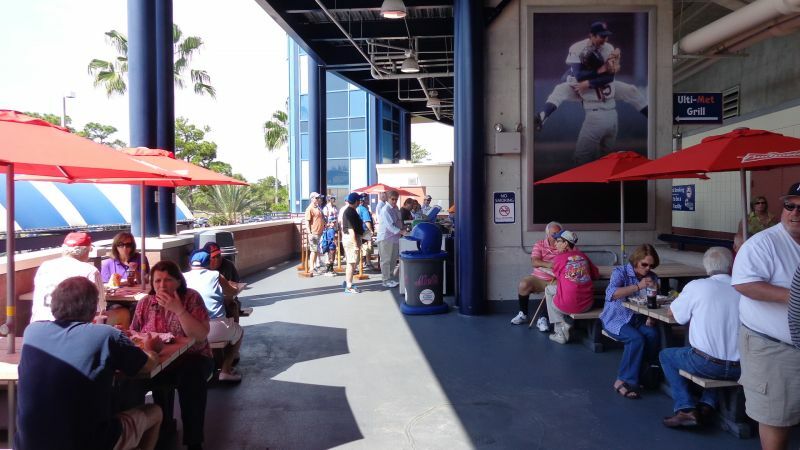 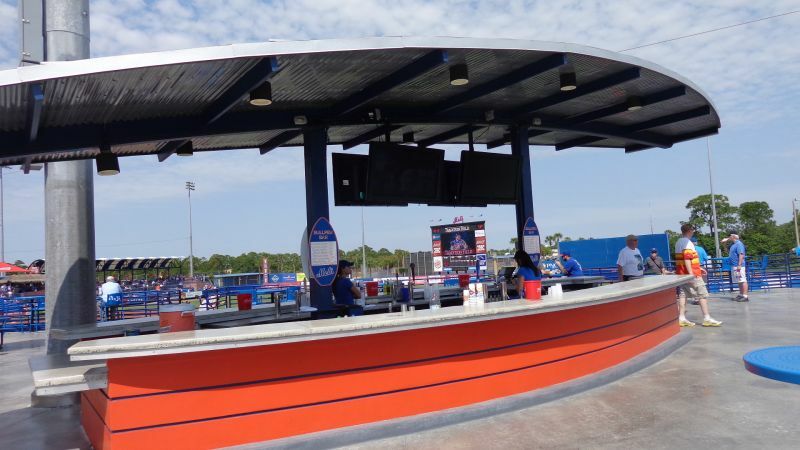 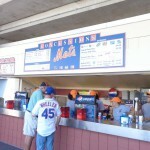 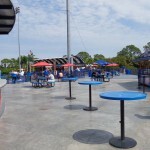 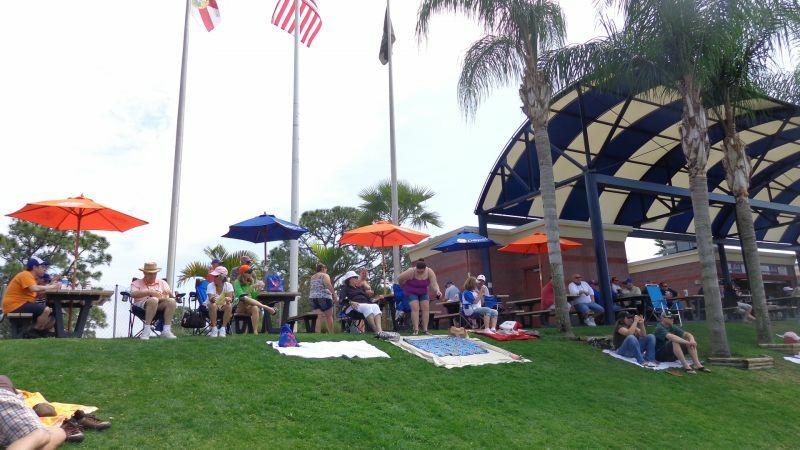 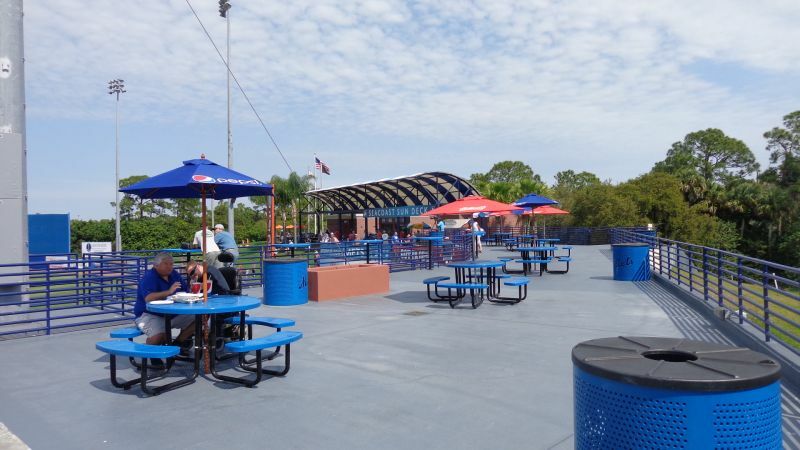 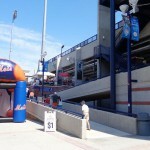 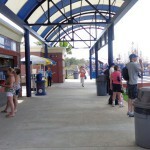 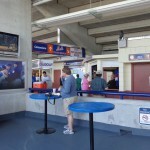 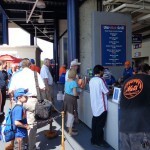 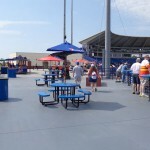 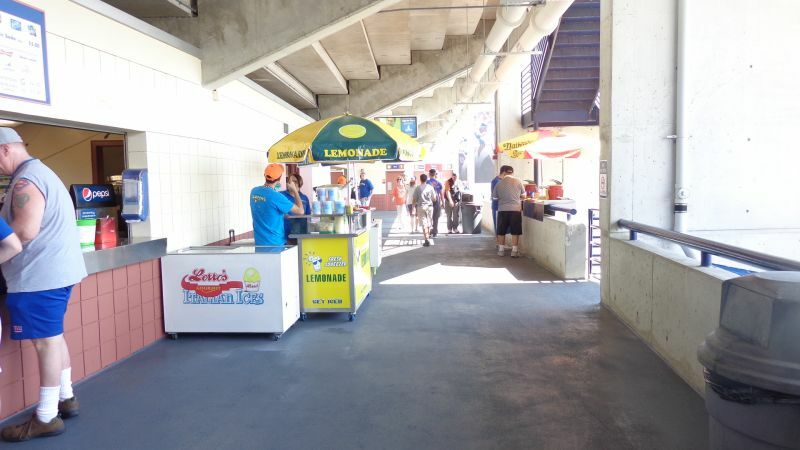 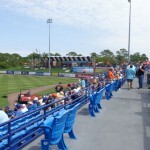 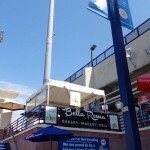 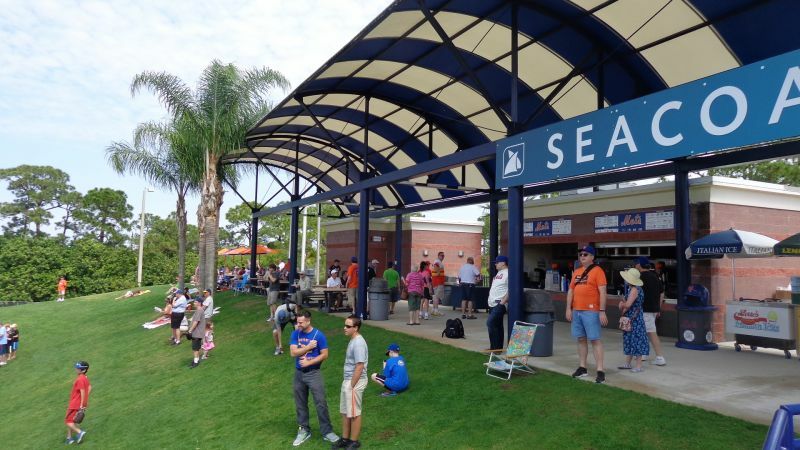 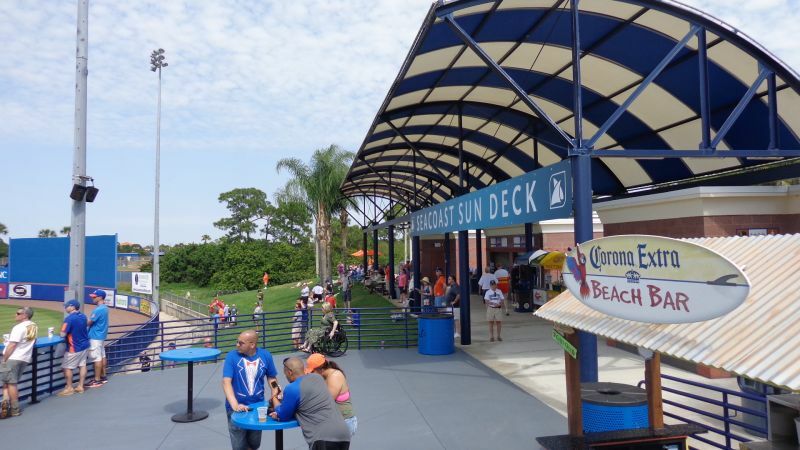 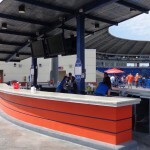 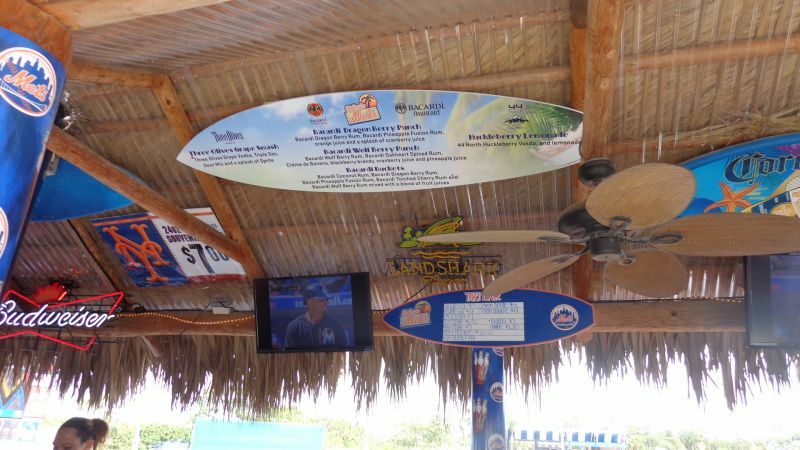 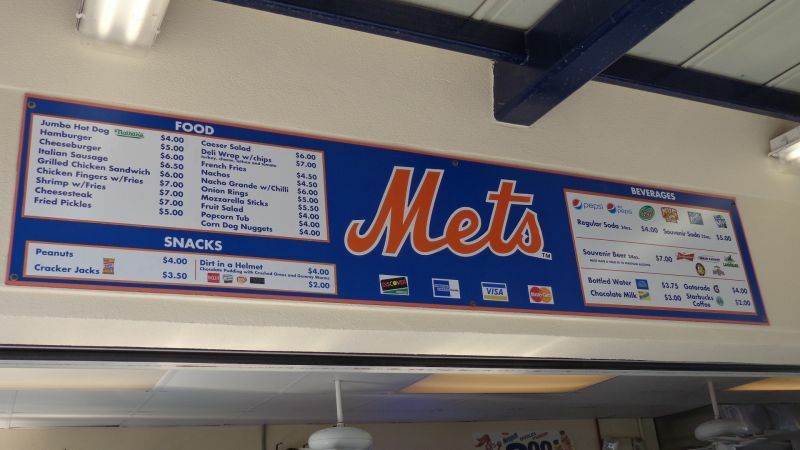 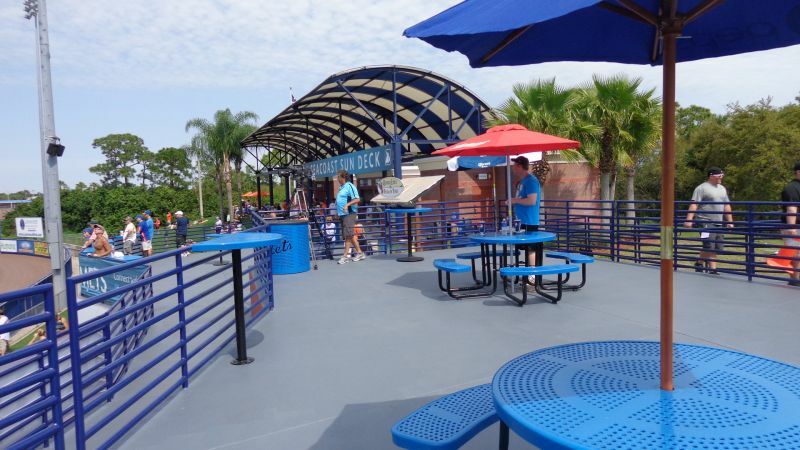 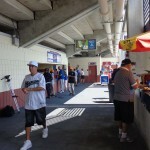 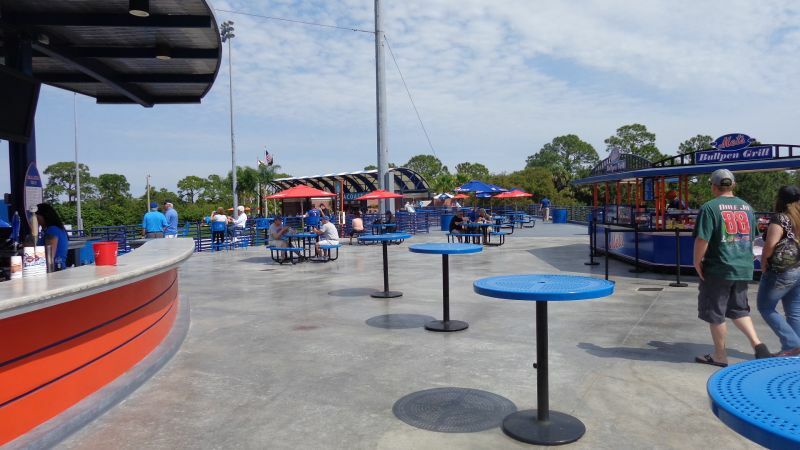 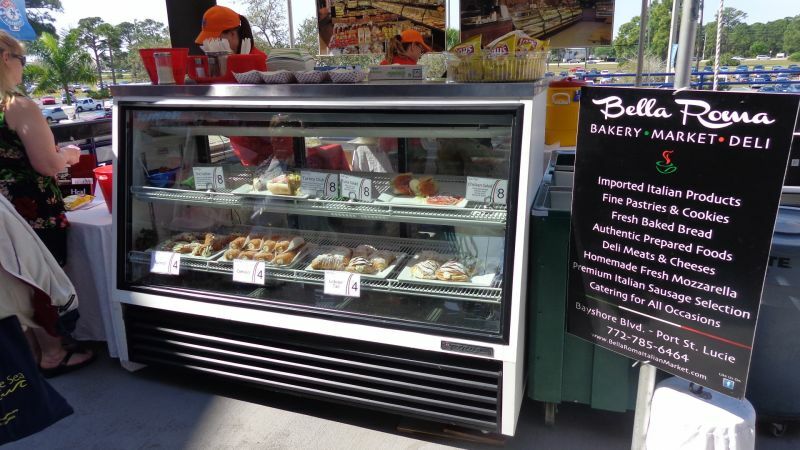 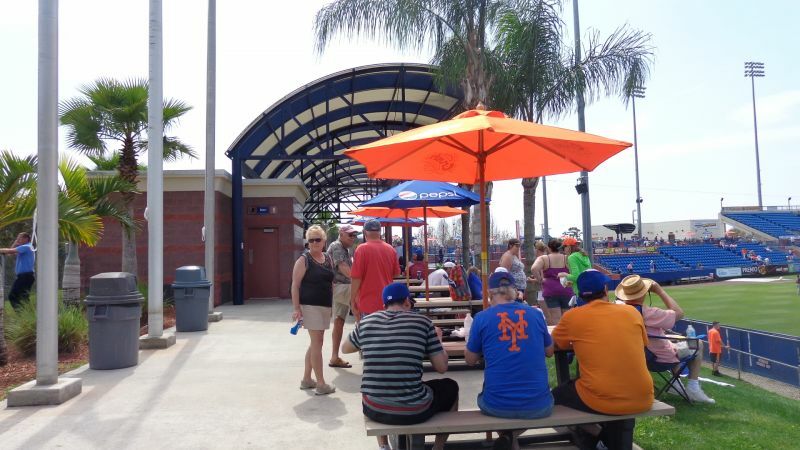 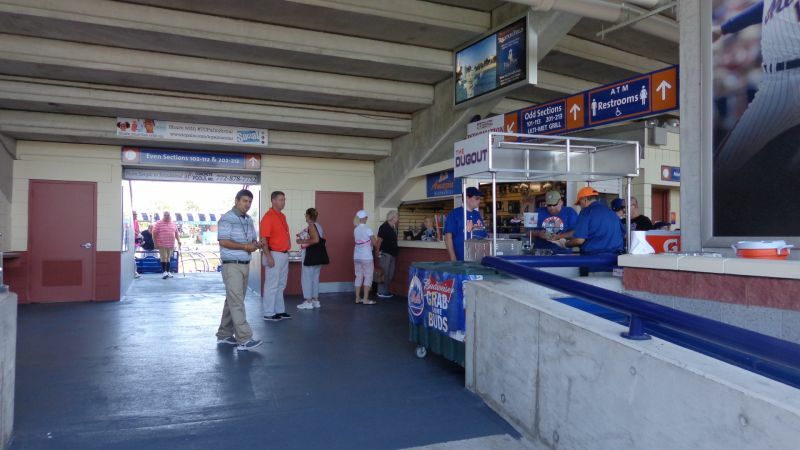 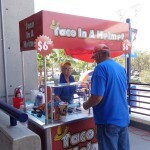 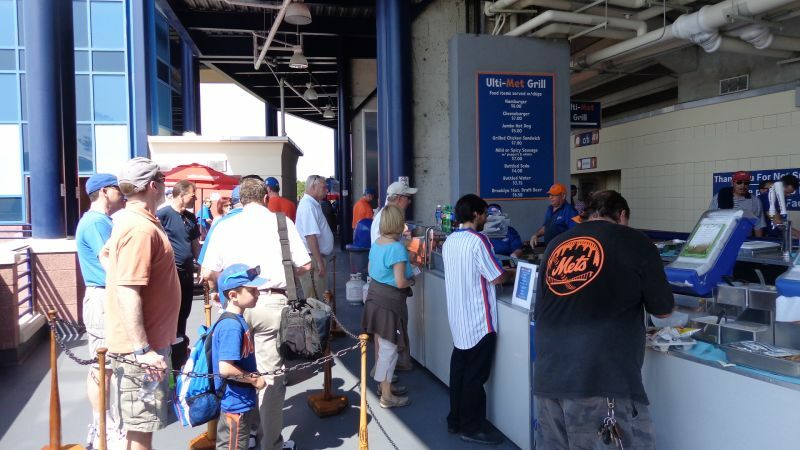 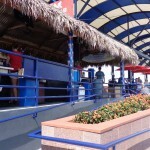 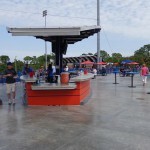 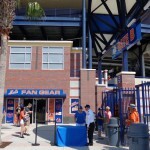 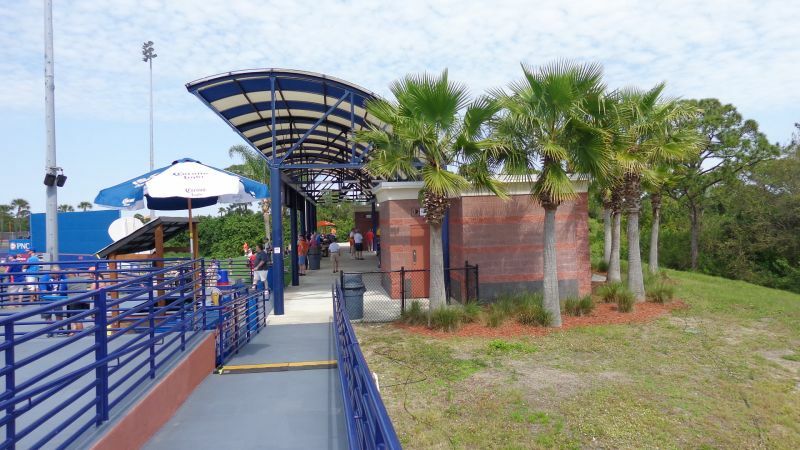 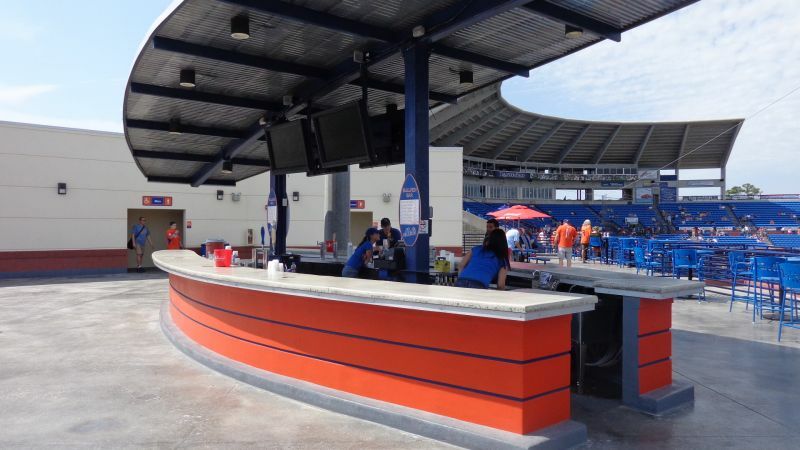 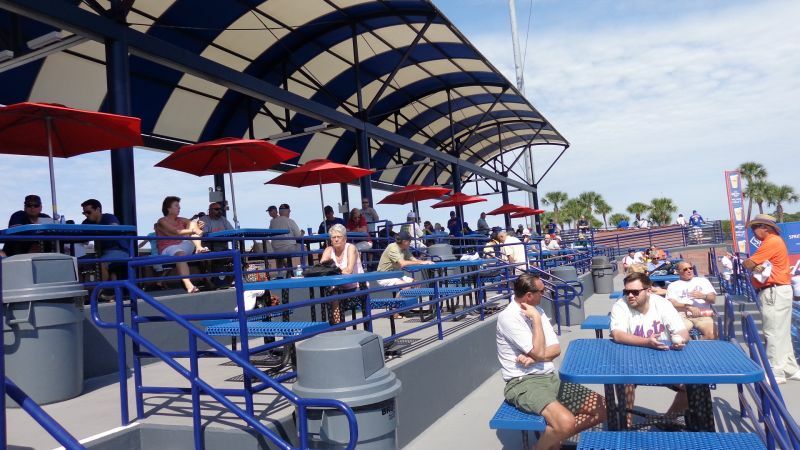 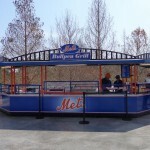 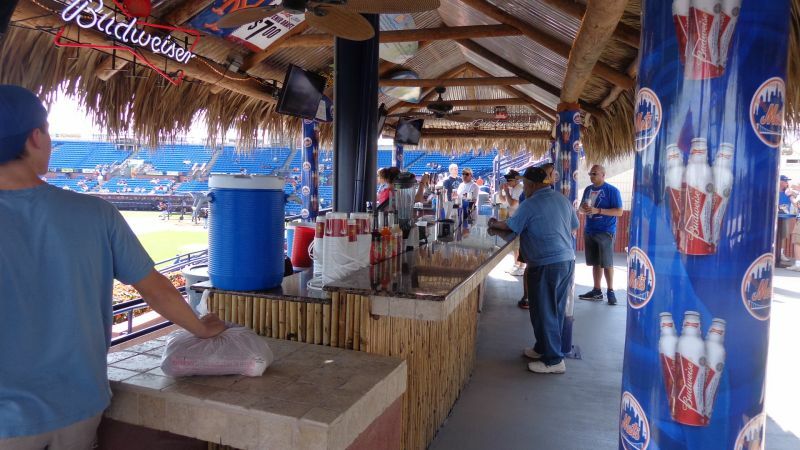 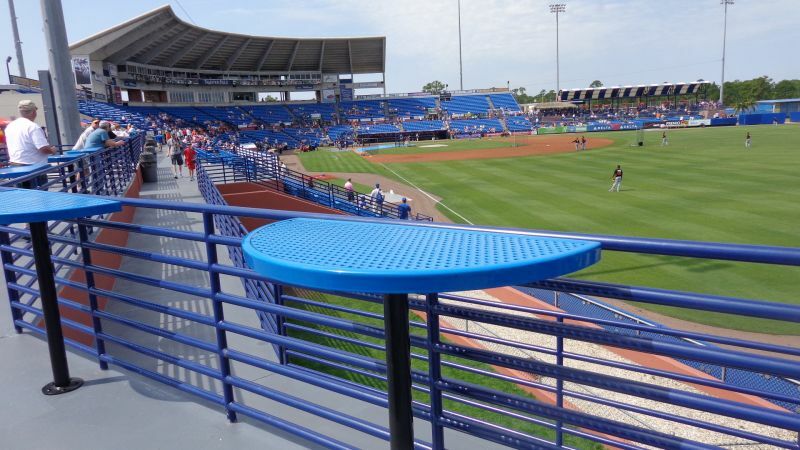 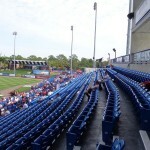 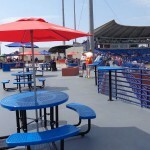 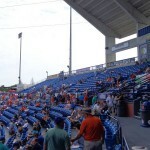 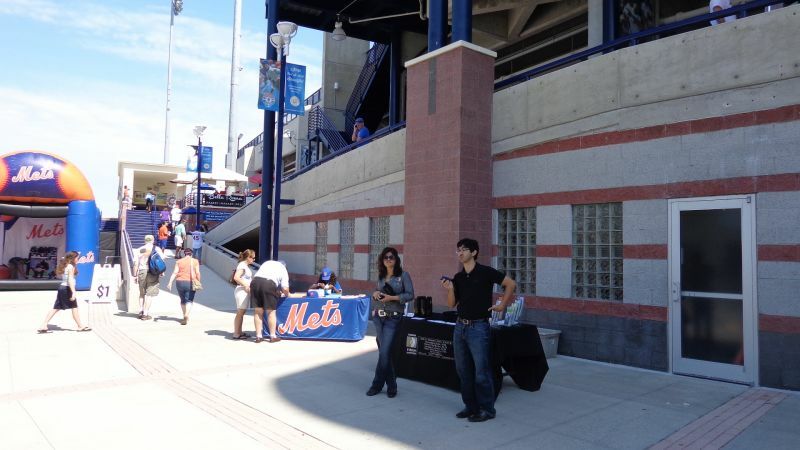 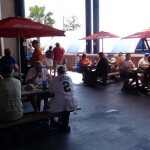 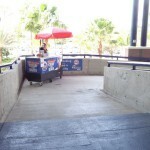 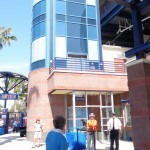 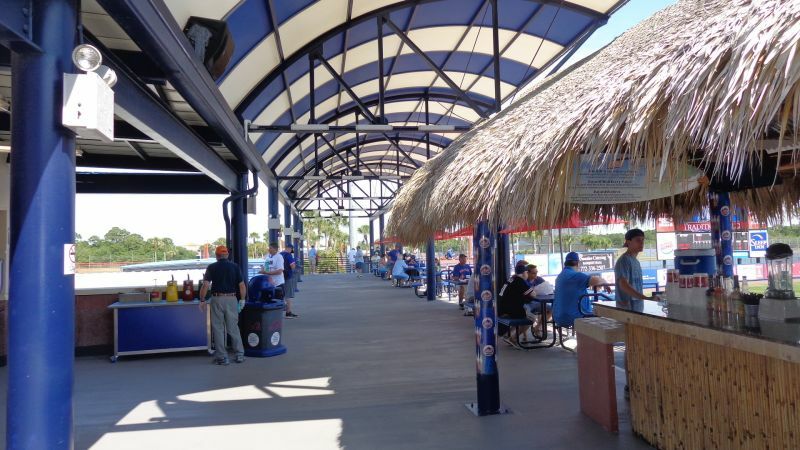 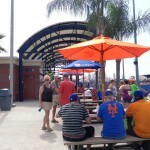 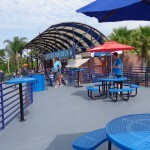 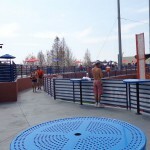 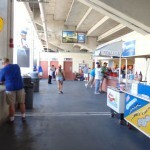 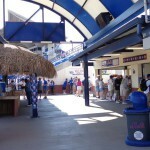 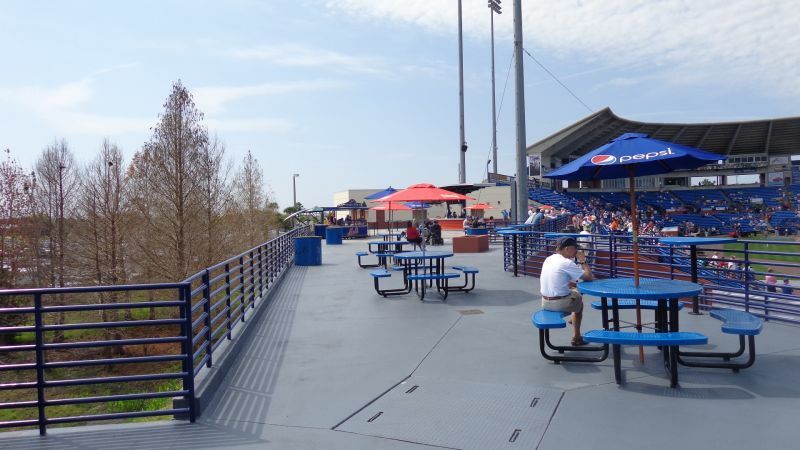 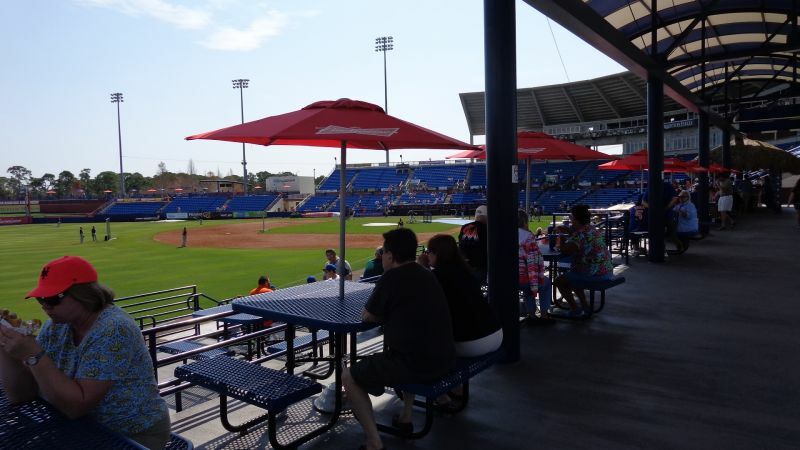 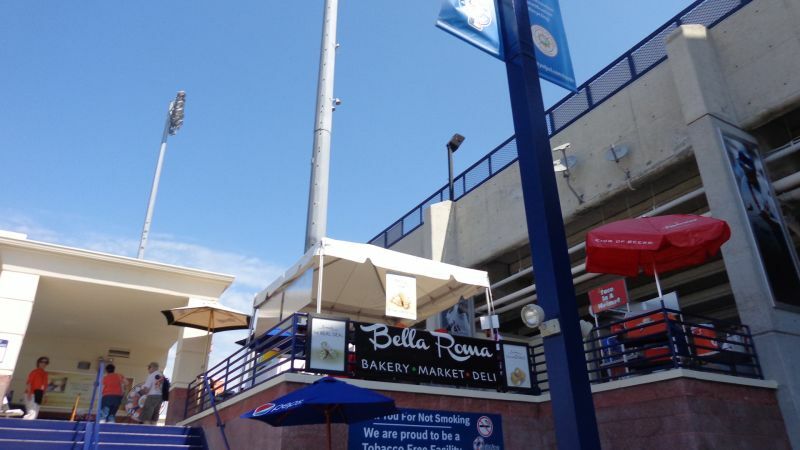 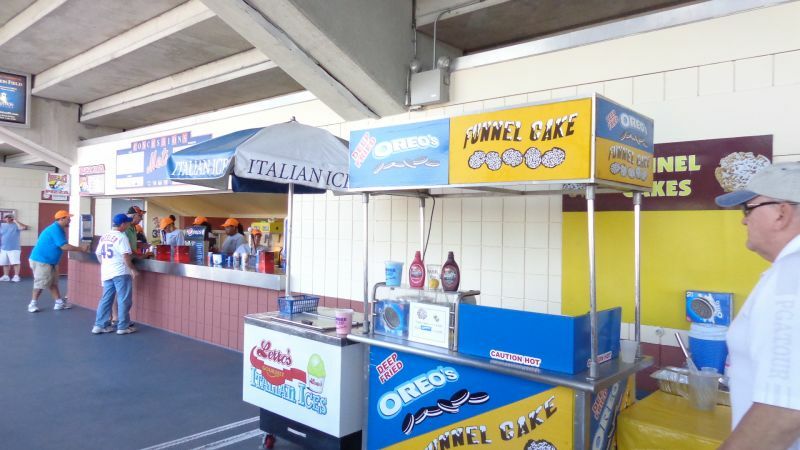 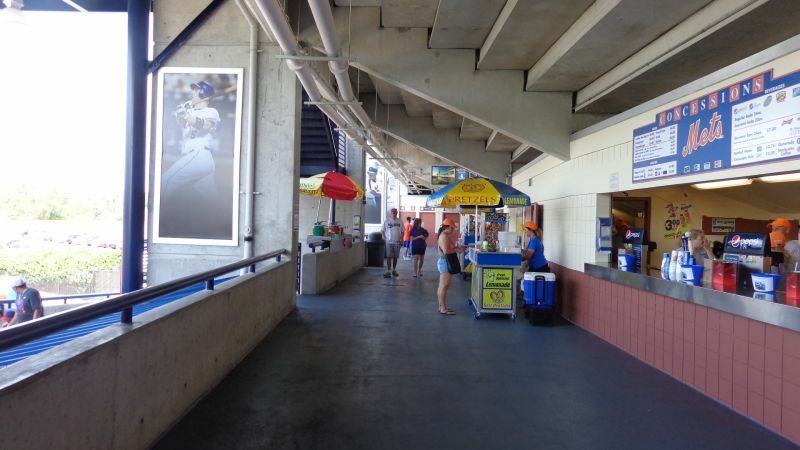 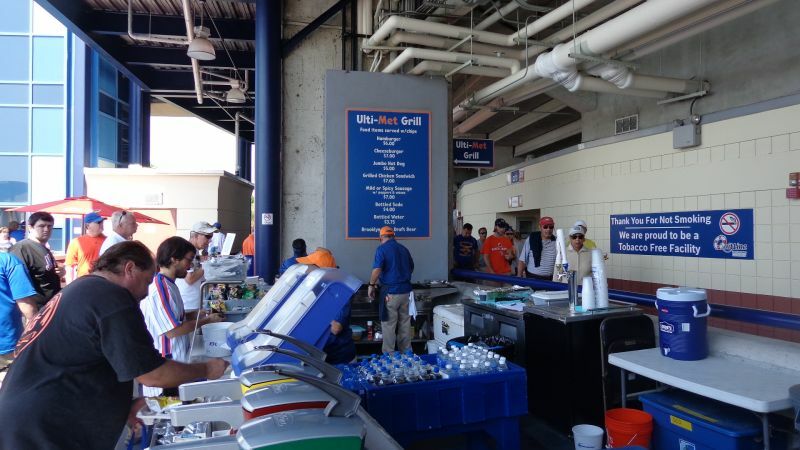 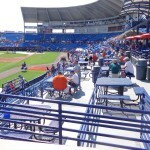 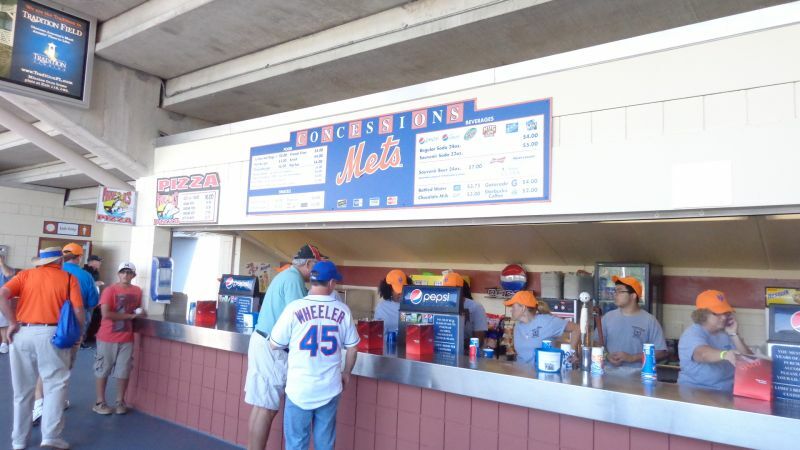 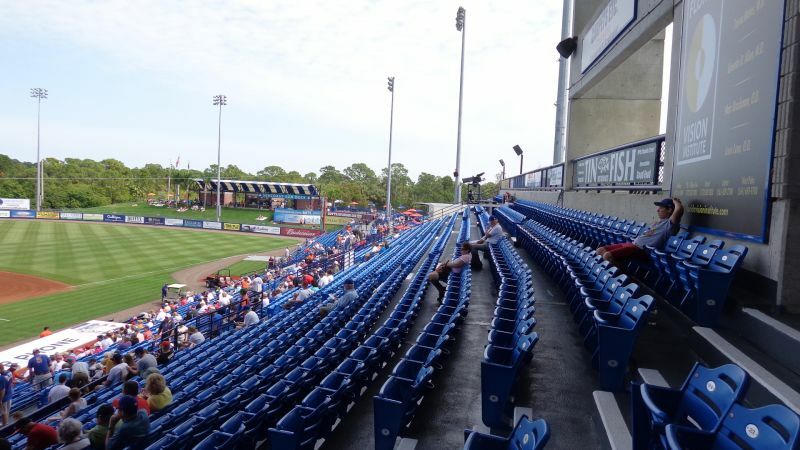 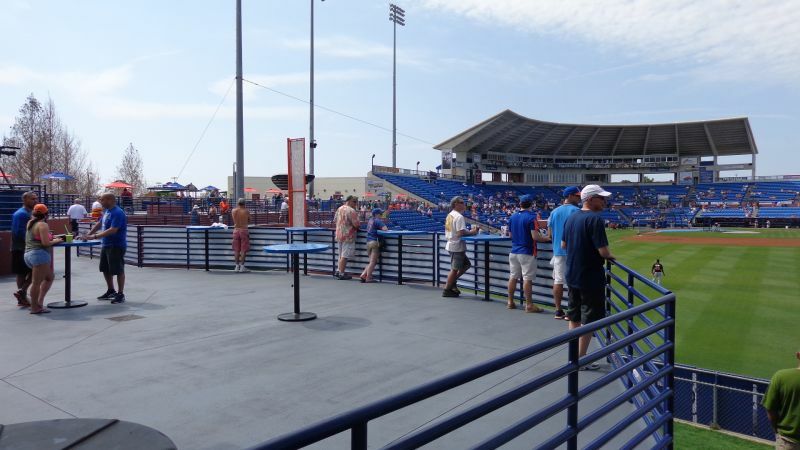 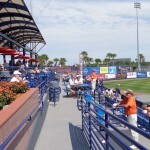 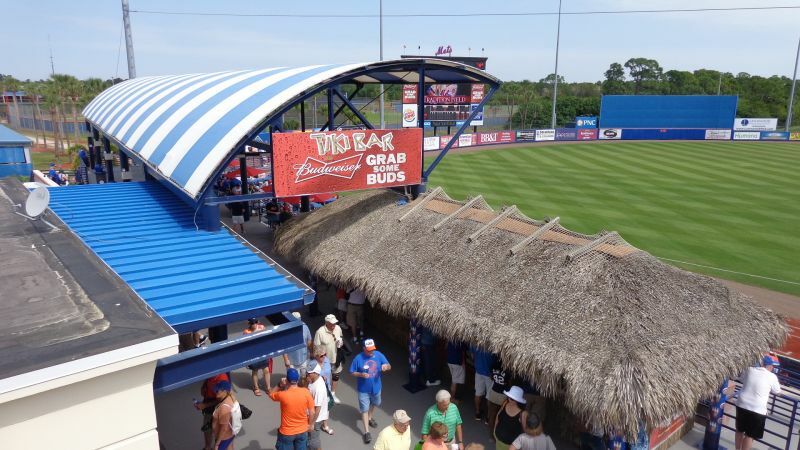 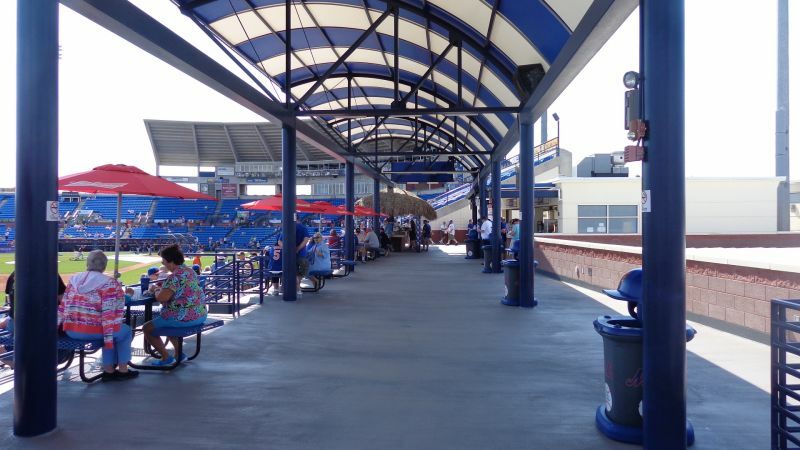 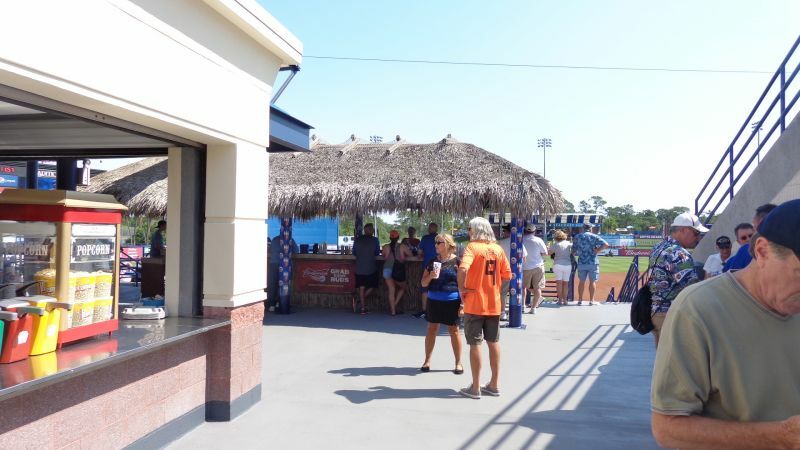 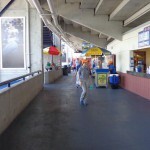 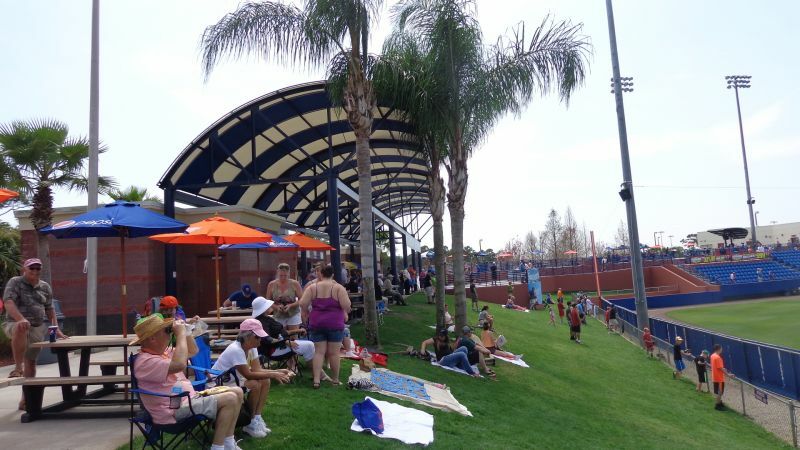 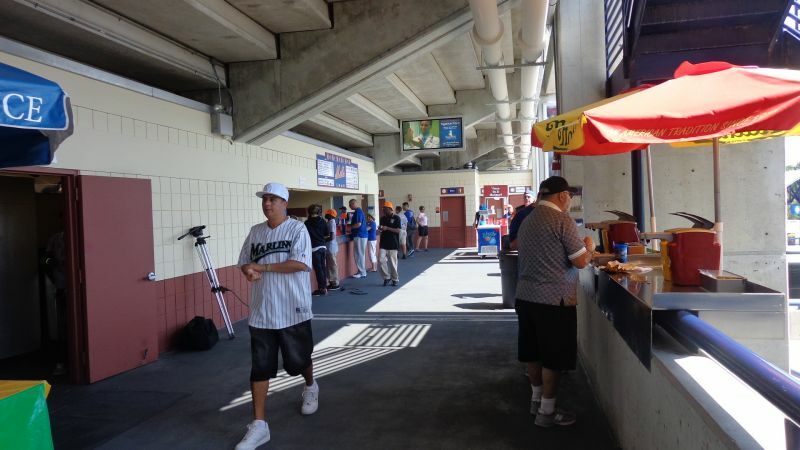 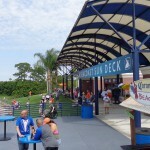 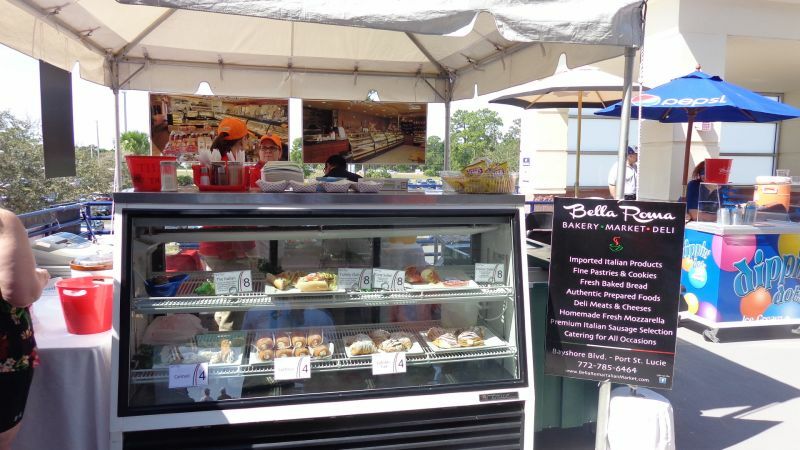 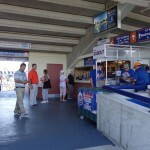 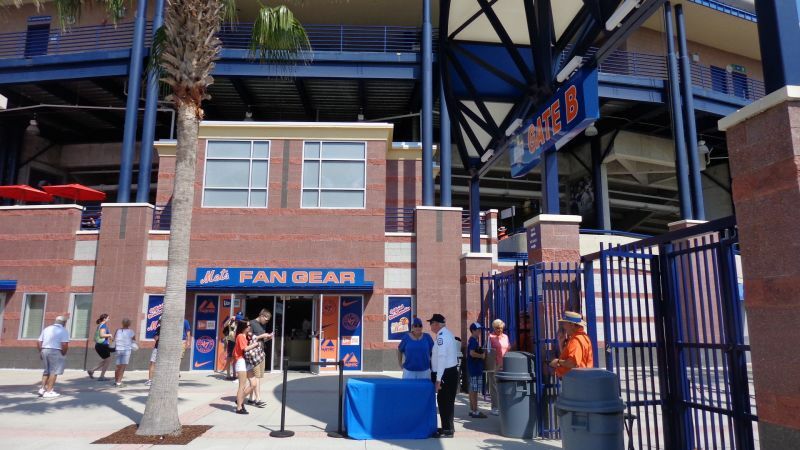 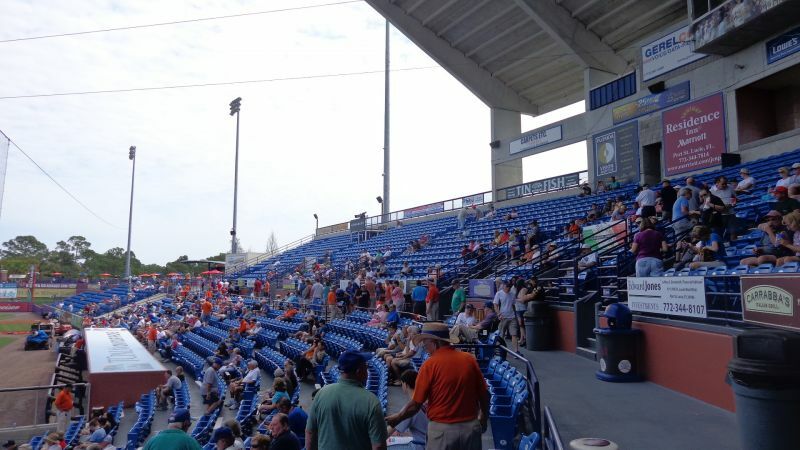 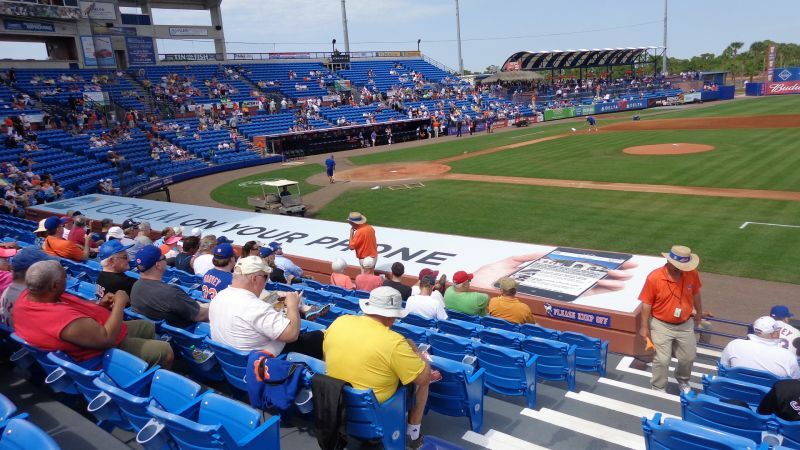 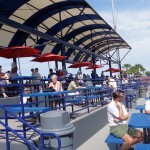 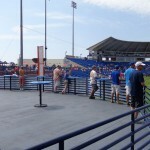 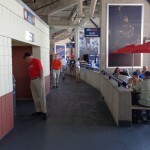 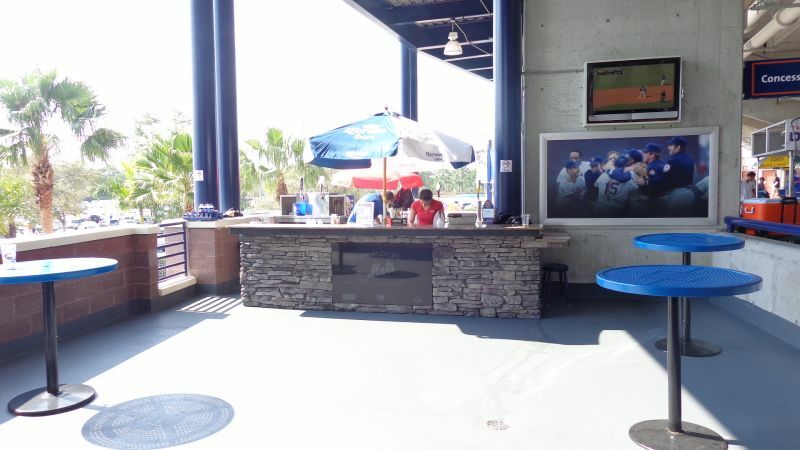 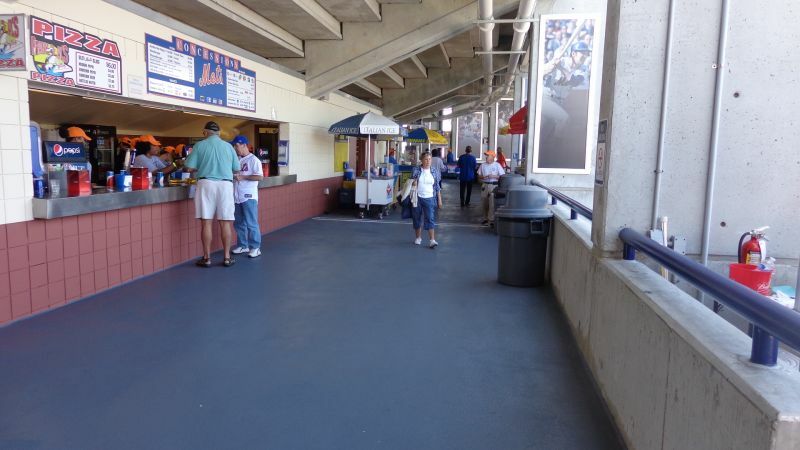 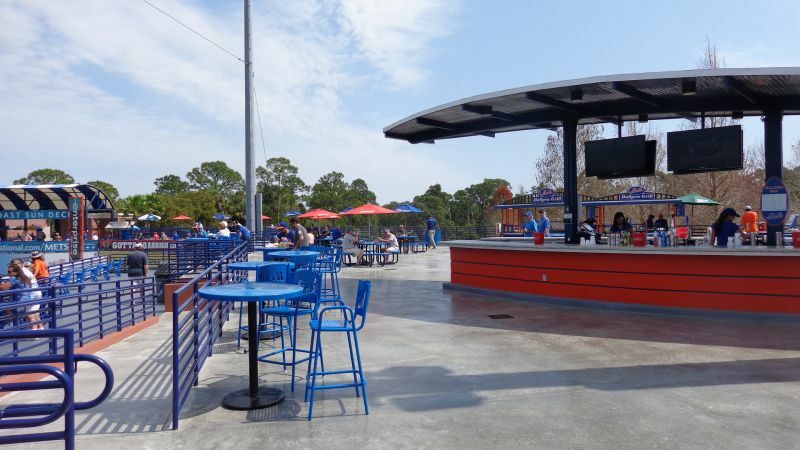 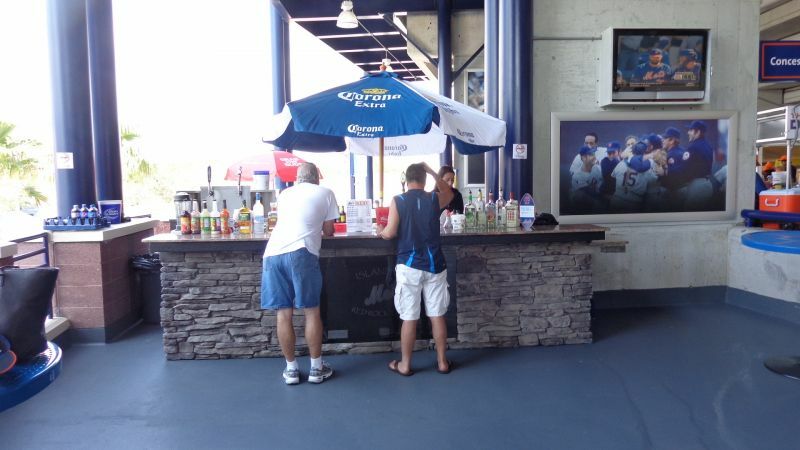 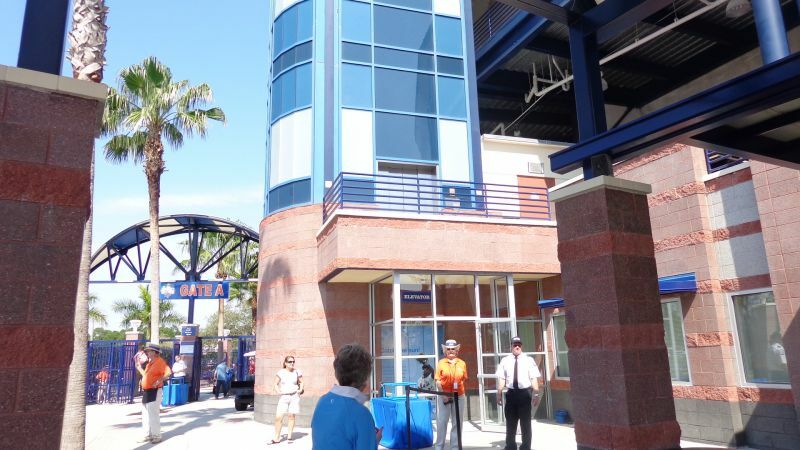 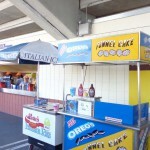 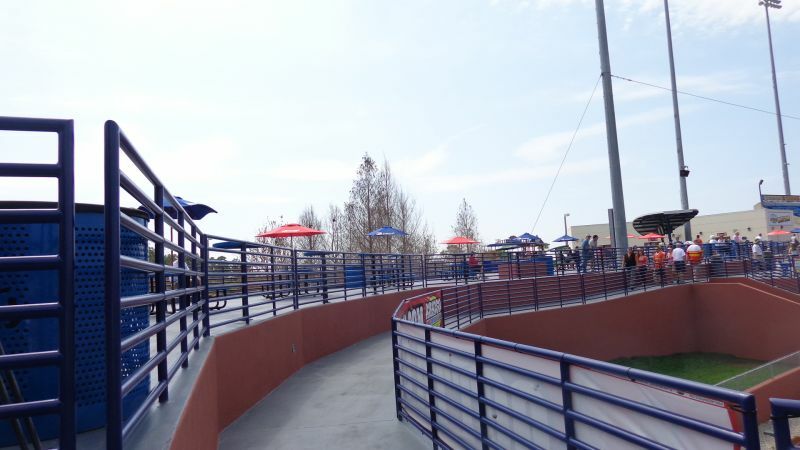 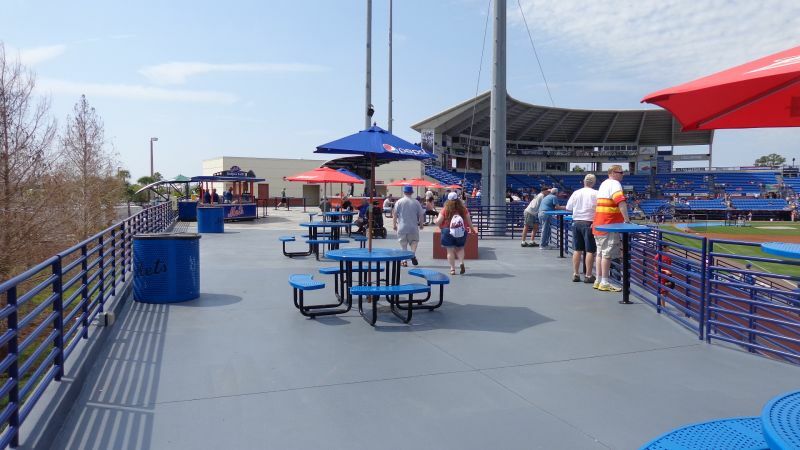 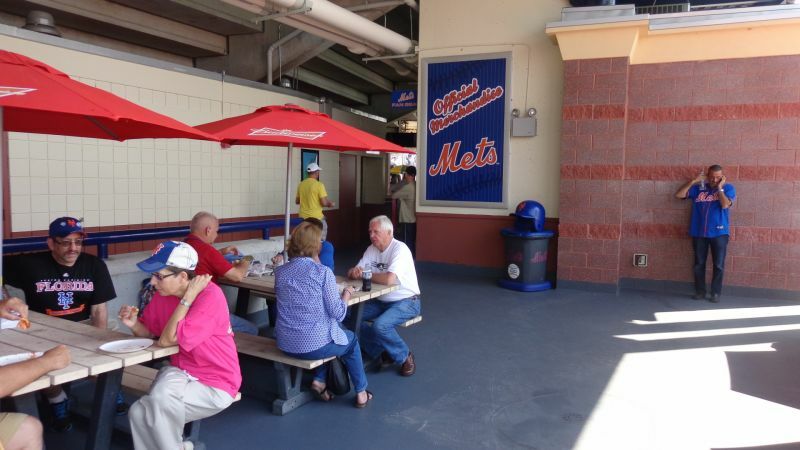 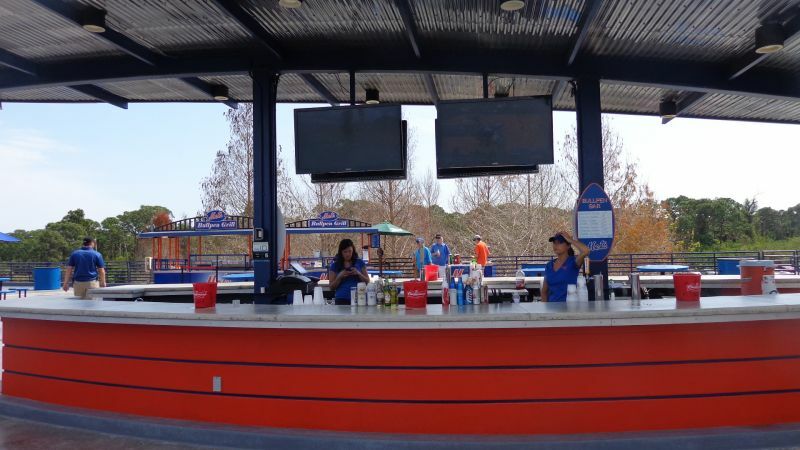 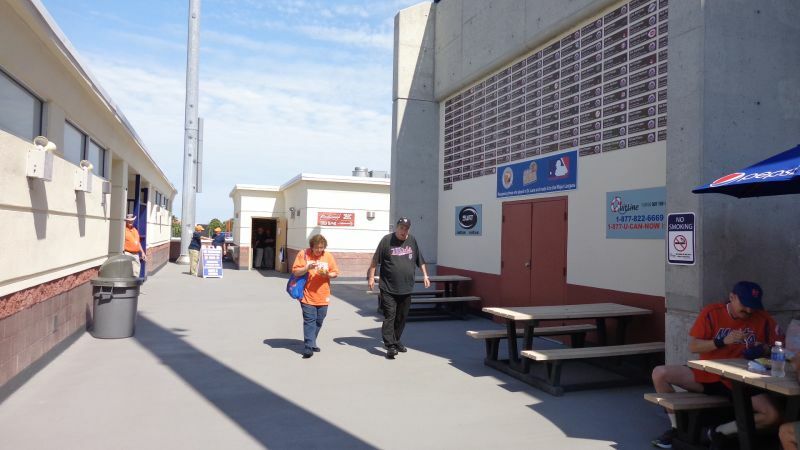 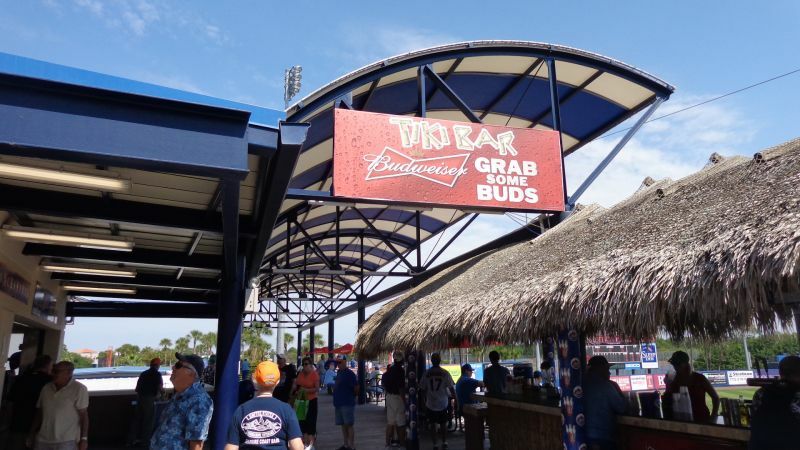 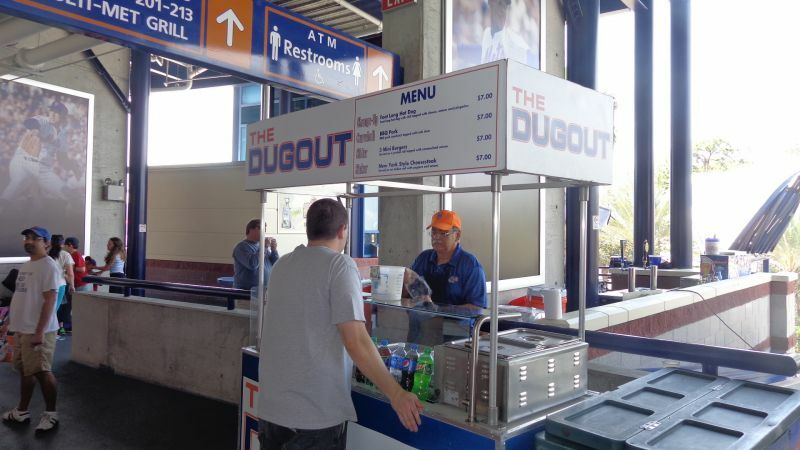 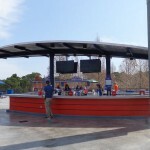 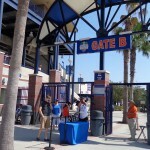 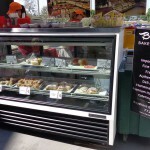 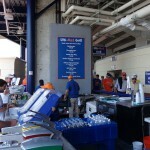 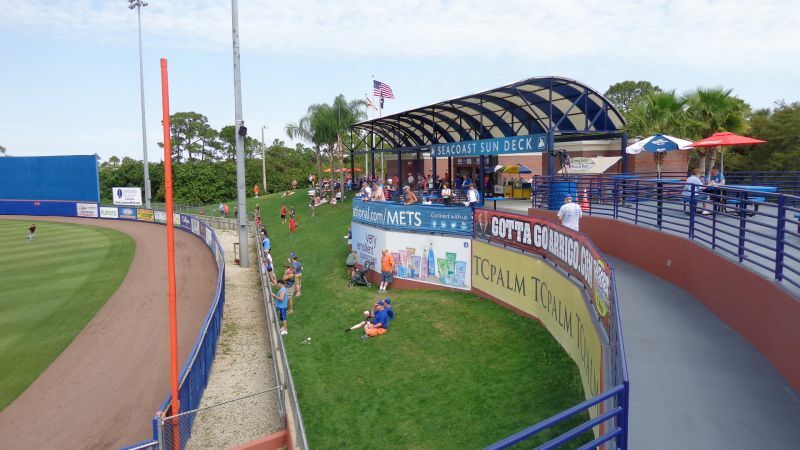 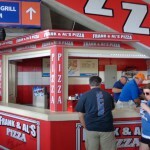 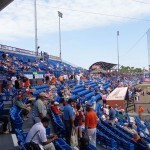 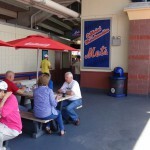 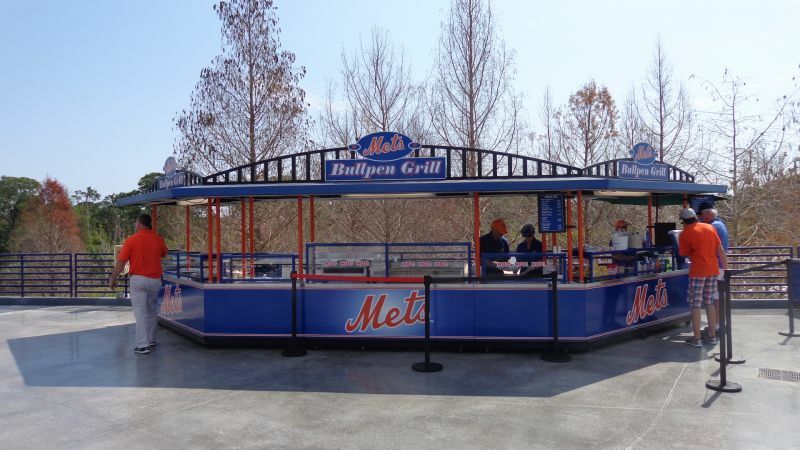 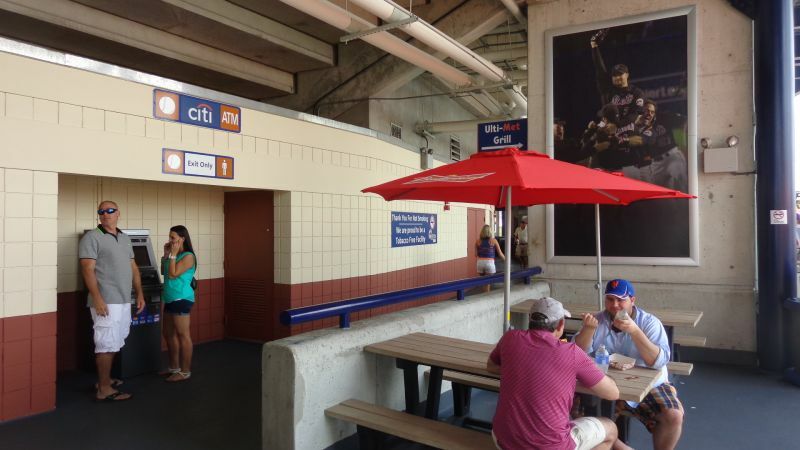 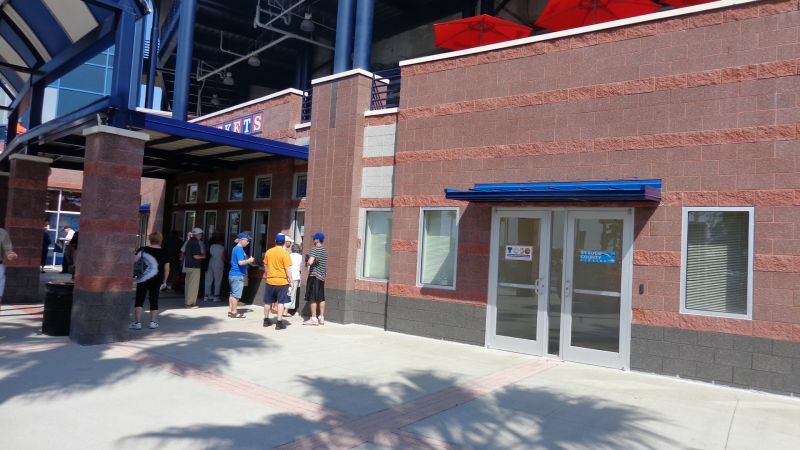 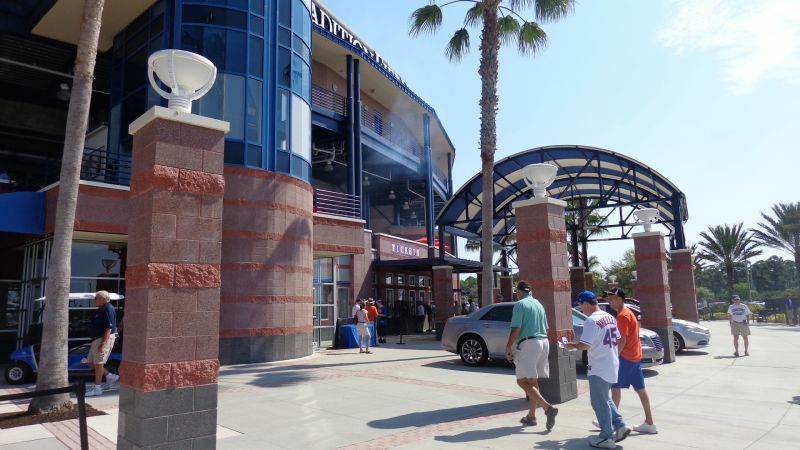 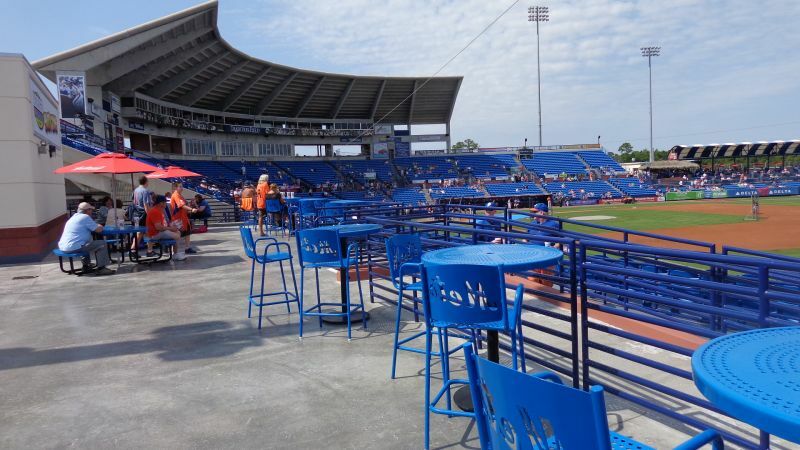 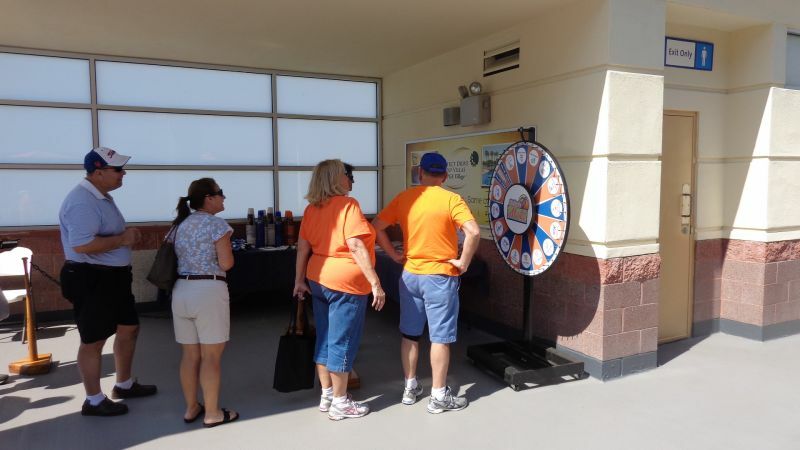 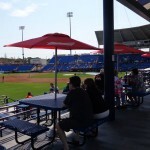 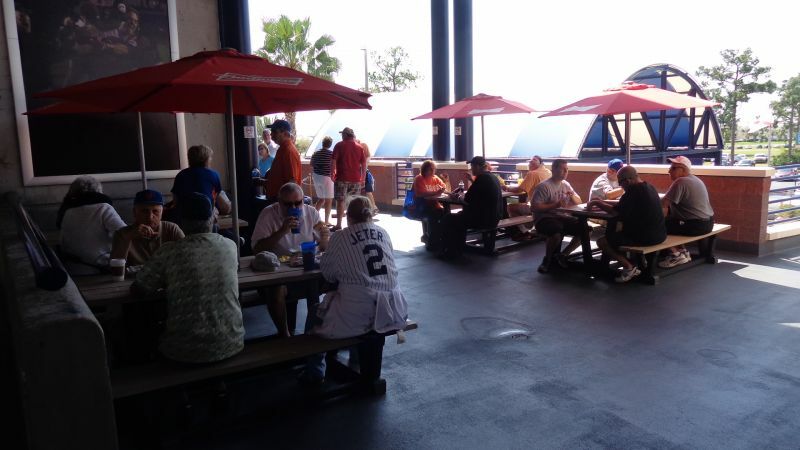 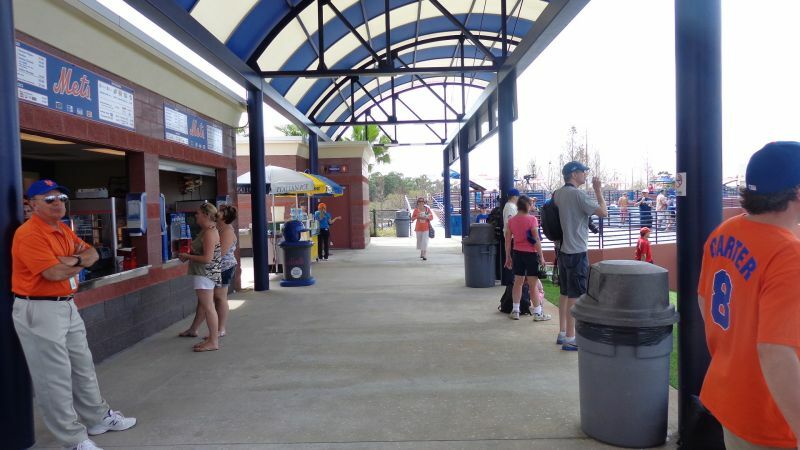 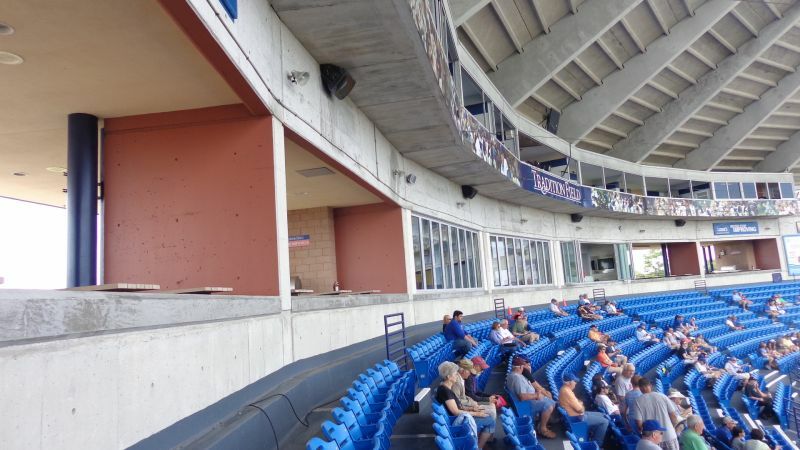 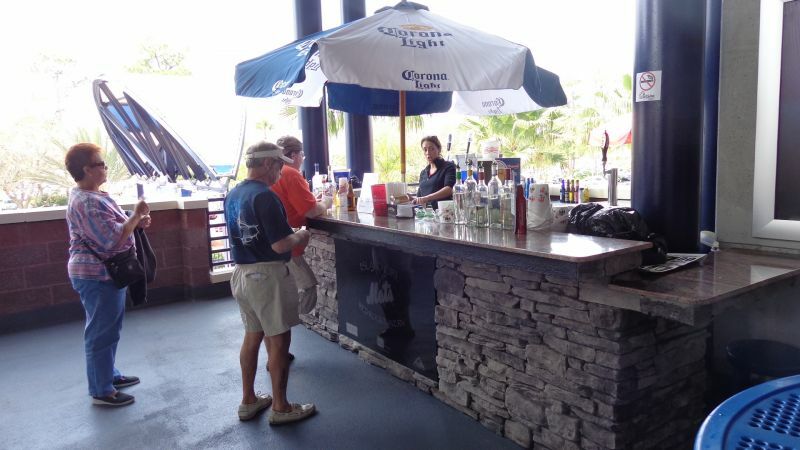 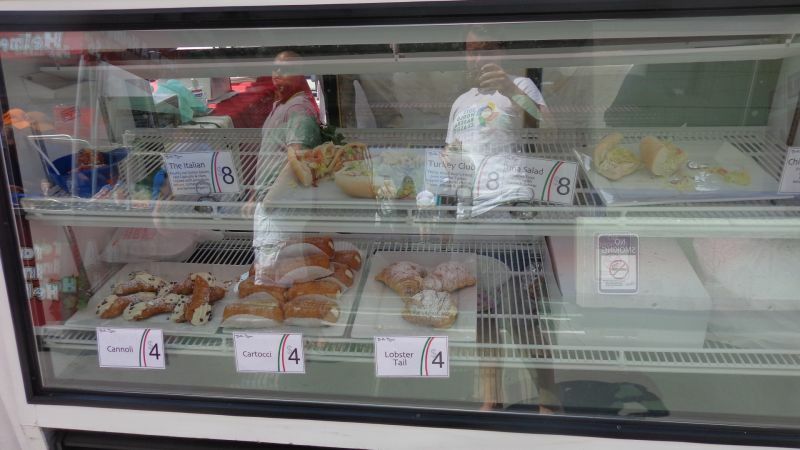 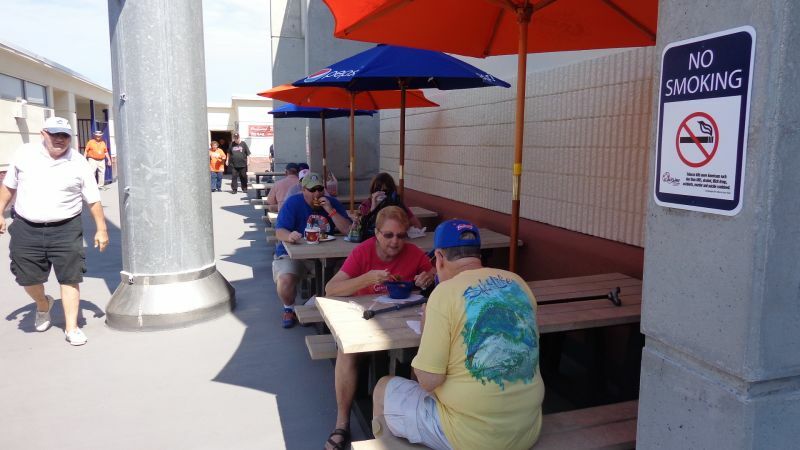 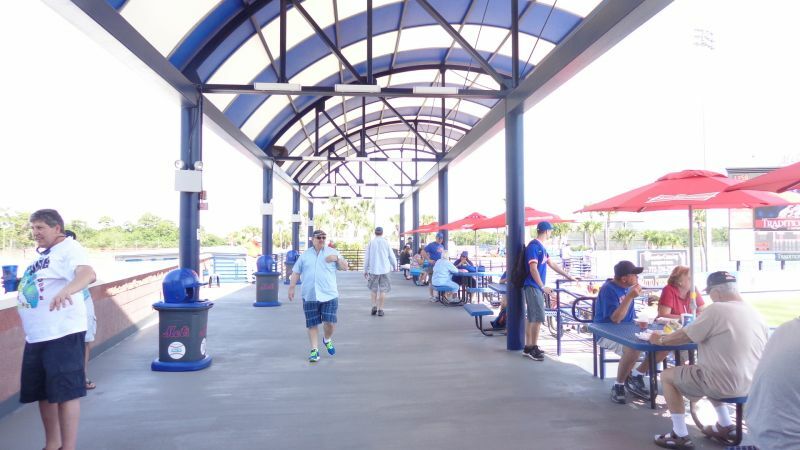 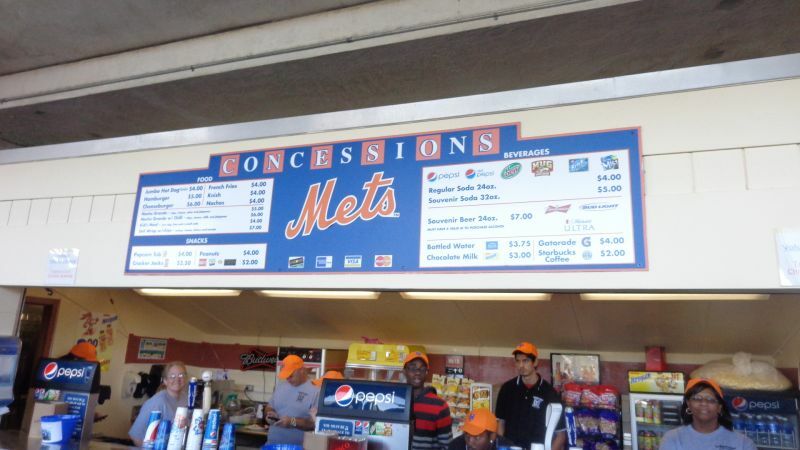 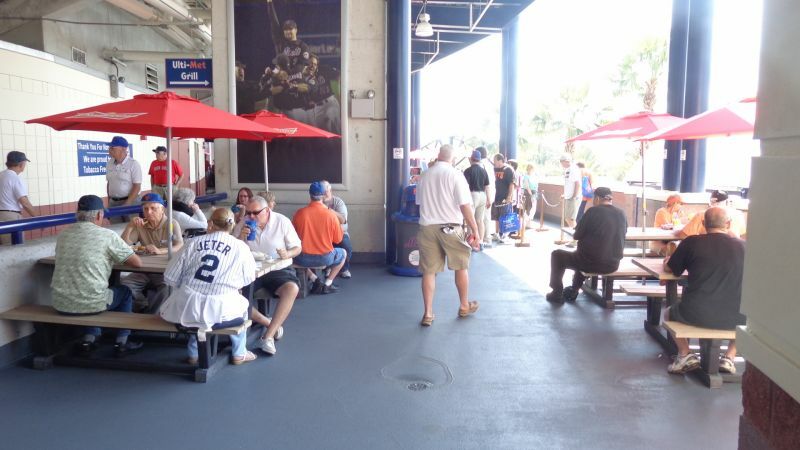 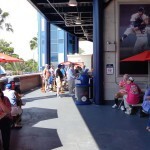 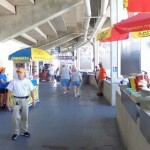 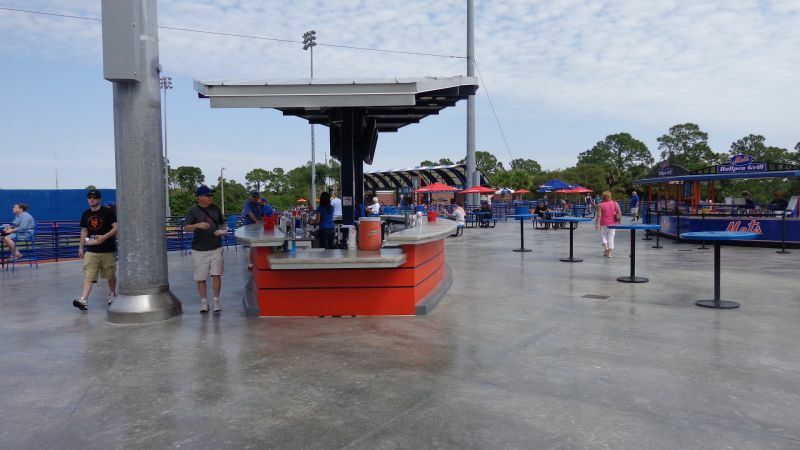 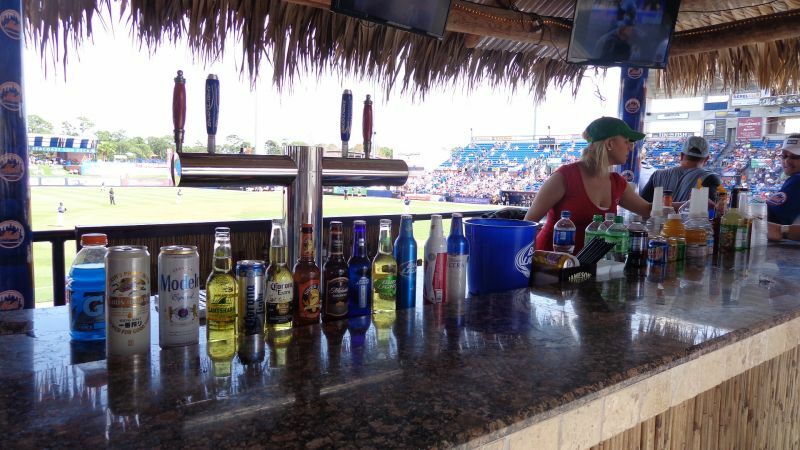 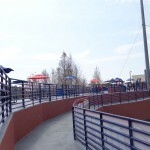 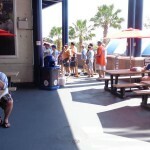 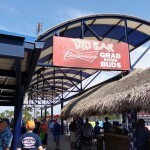 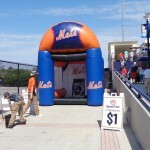 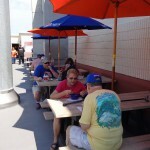 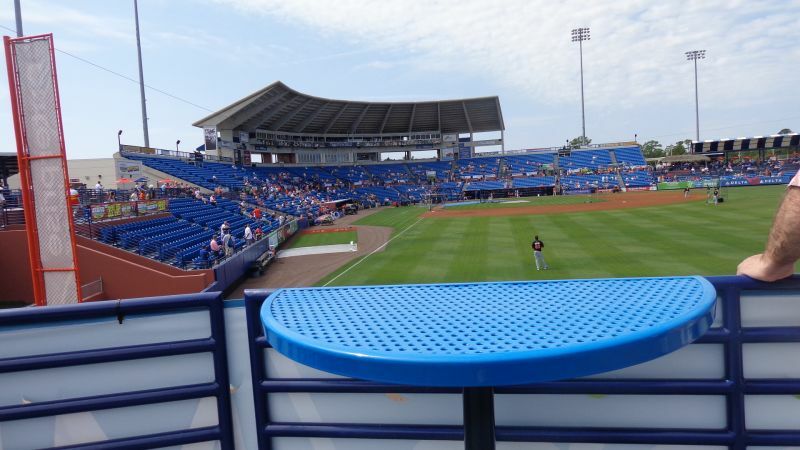 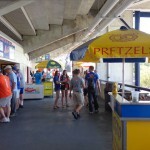 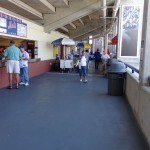 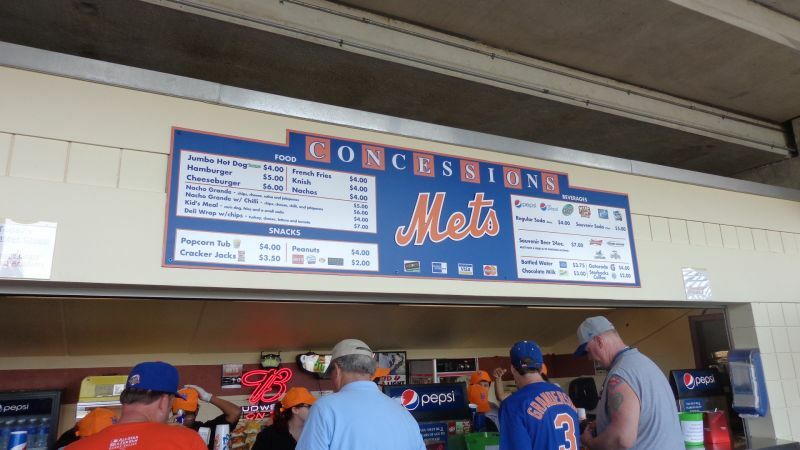 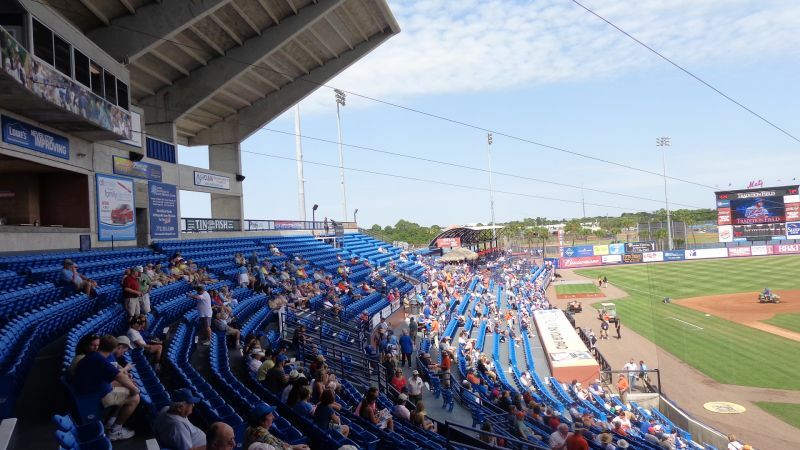 Naturally, in my estimation, it measures as the narrowest concourse in the Grapefruit League today; but the point is the Mets do well in filling these small spaces with food options, tables, bars, and other small enclaves to gather. 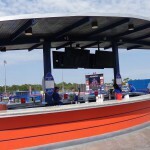 While the Mets spread outward down the lines with their two party areas, they have made the best with the small space originally allotted as well. 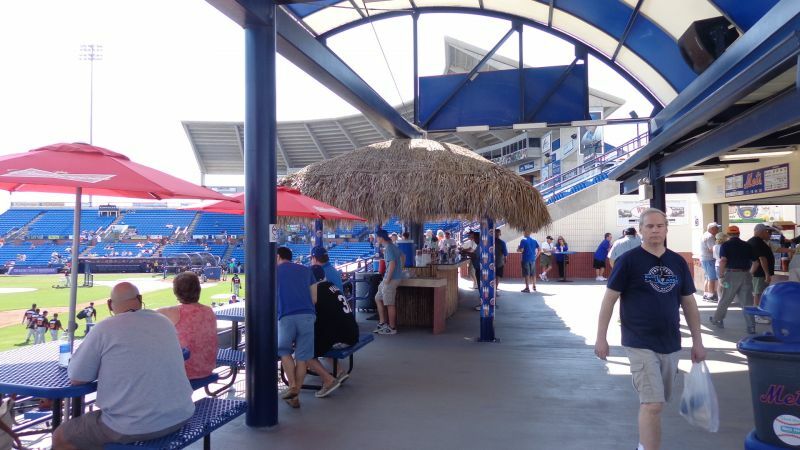 Sure we still have that ugly cantilevered roof and concrete galore, but you could argue it is quite a unique place to see a game. 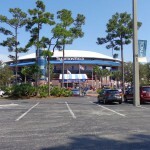 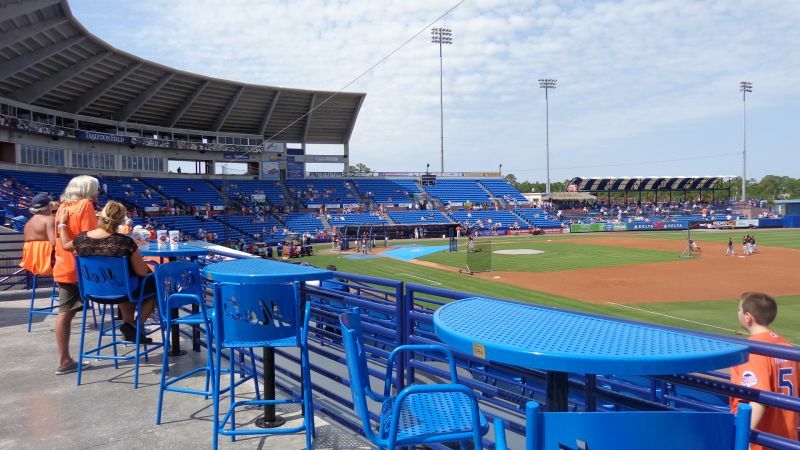 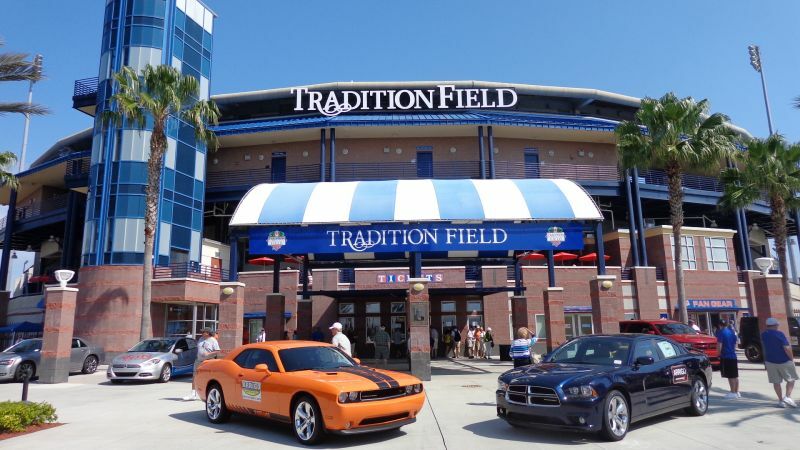 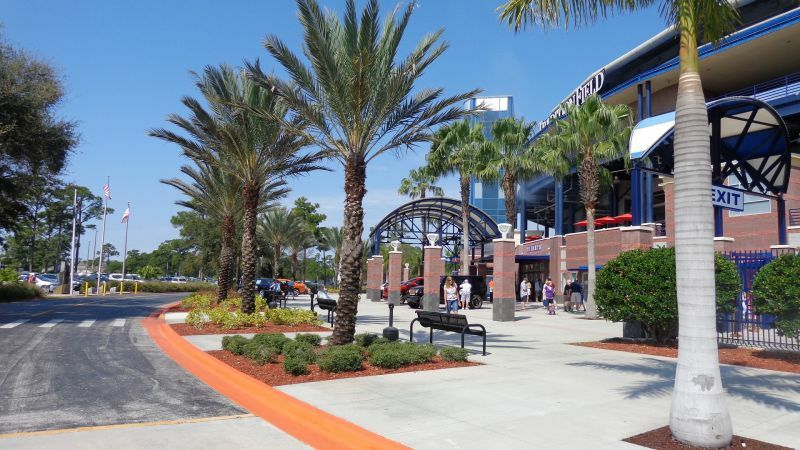 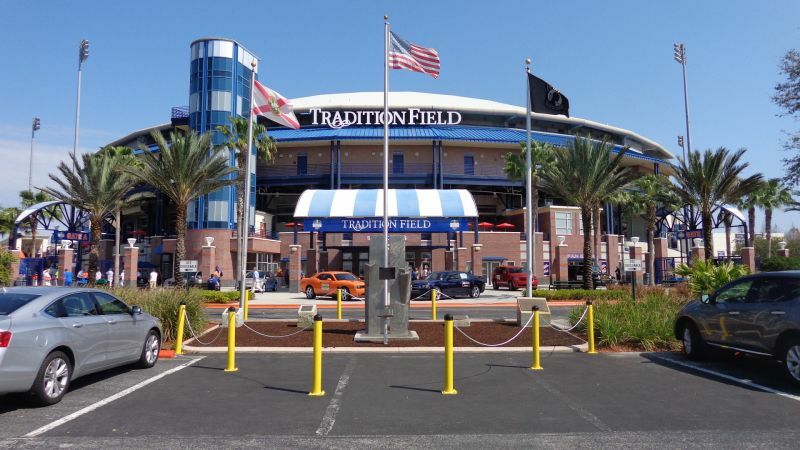 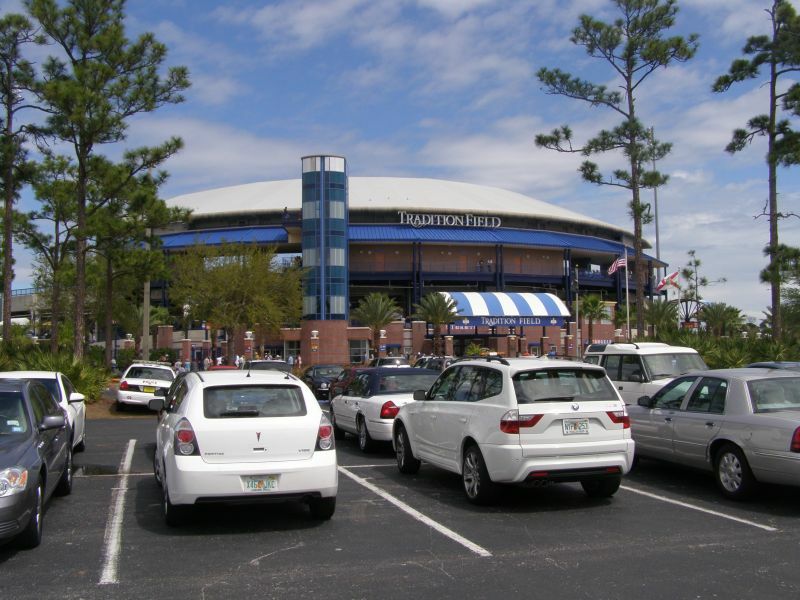 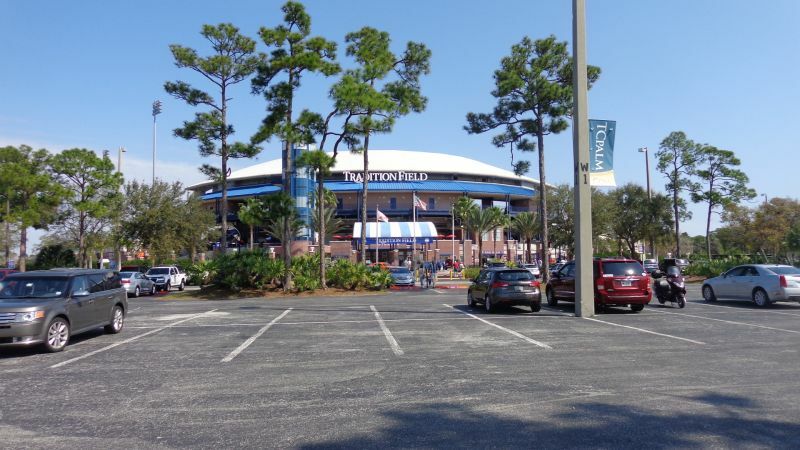 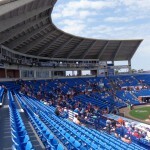 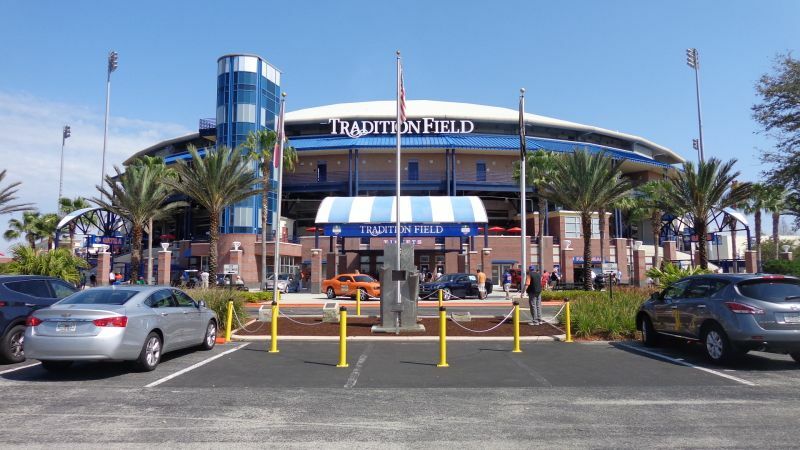 Ultimately though, Tradition Field illustrates the irony that if you go big in one era (the 80s), you may be unable to architecturally adjust as effectively in the next. 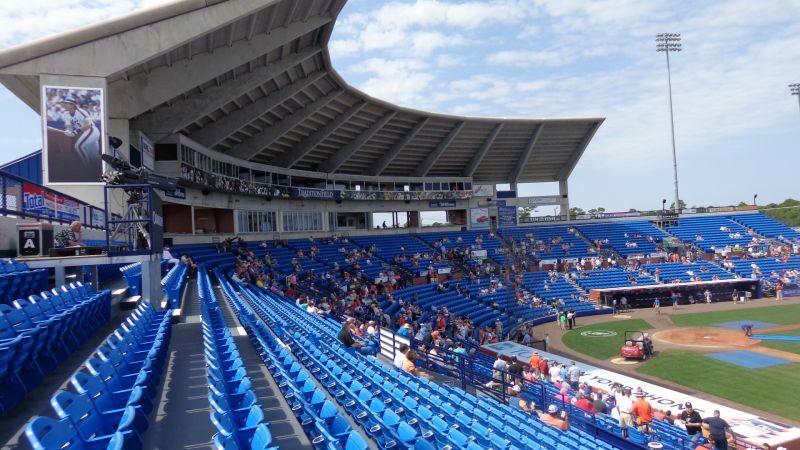 Ballparks listed like the rudimentary Ed Smith Stadium and Charlotte Sports Park were just big concrete blocks with the team’s insignia on the outside, so they were able to become far superior through renovations, because there just wasn’t much there in the first place. 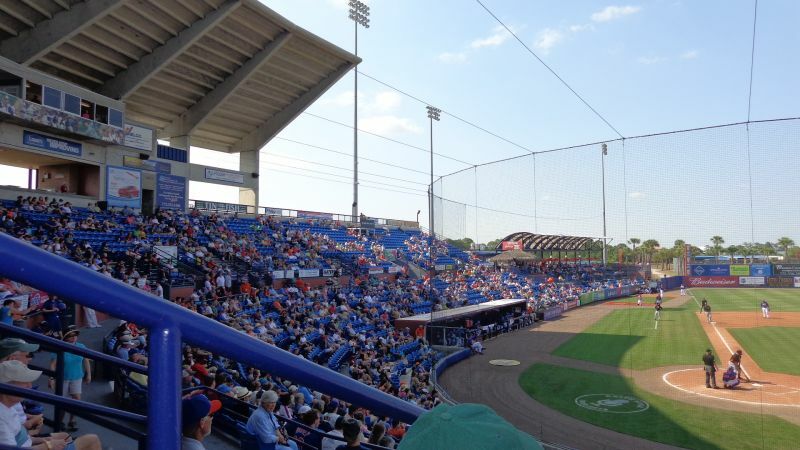 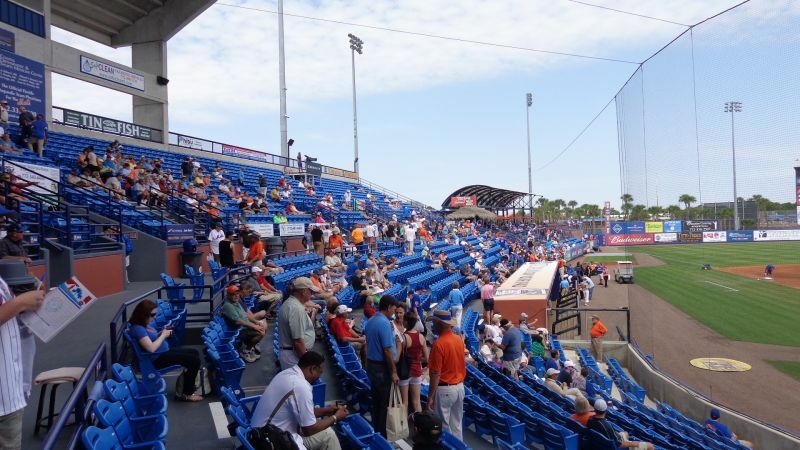 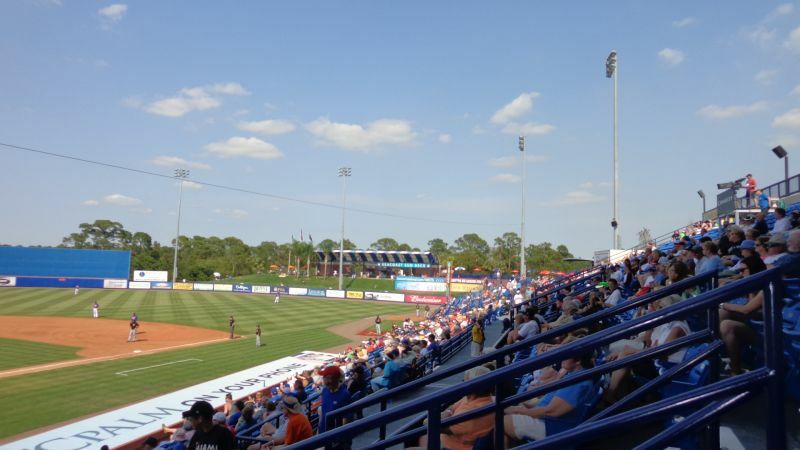 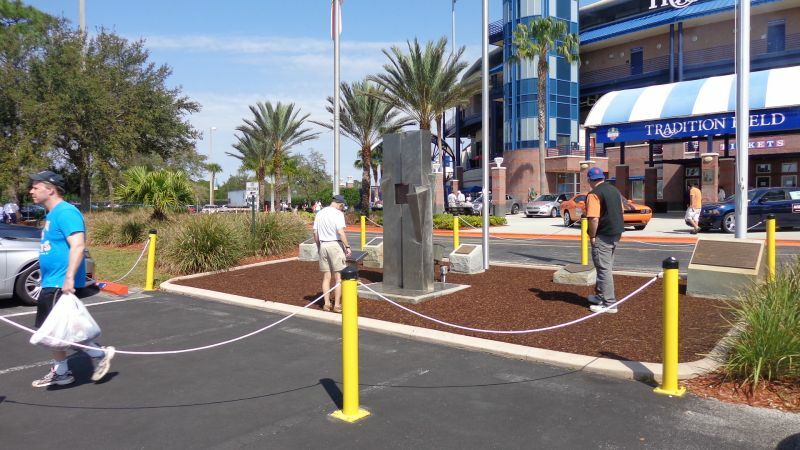 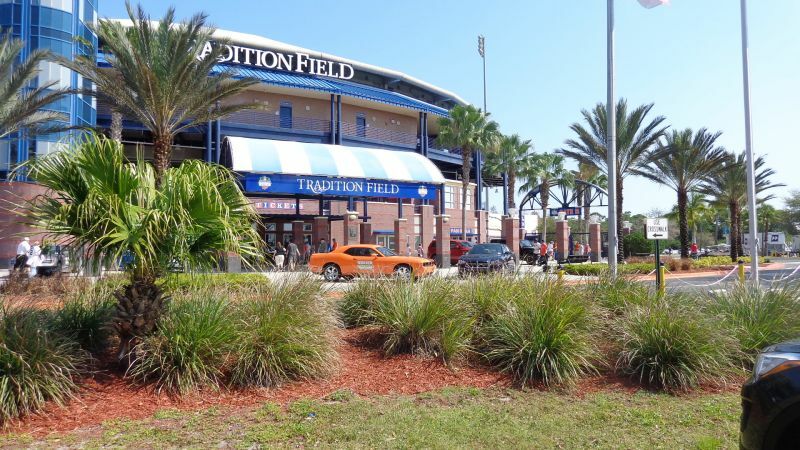 *Edit March 2017: It appears Tradition Field will go through another round of renovations in 2018-2019 (at the tune of $60 million, not coincidentally more than other spring training renovations), but the lasting impression will probably remain intact.